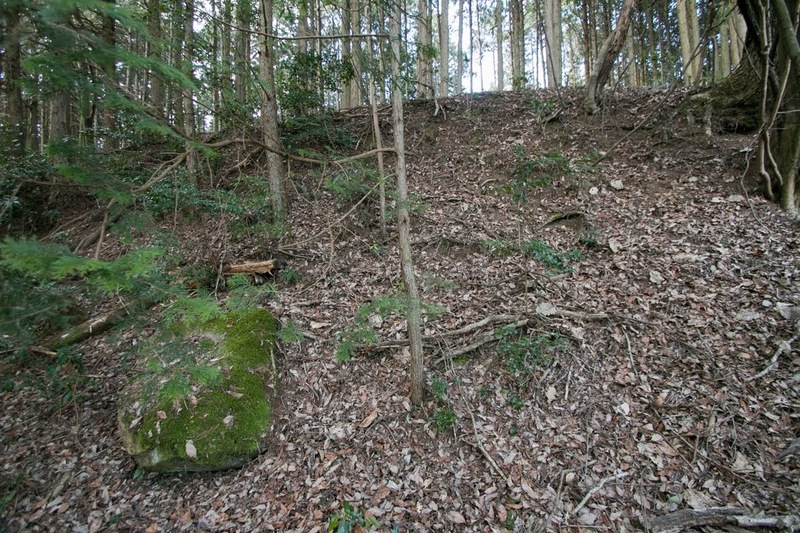 Higumayama castle (比熊山城) is built over Higuma-yama mountain, one of about 180 meter tall from hillside just at the north of current Miyoshi city central. 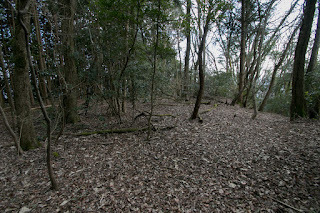 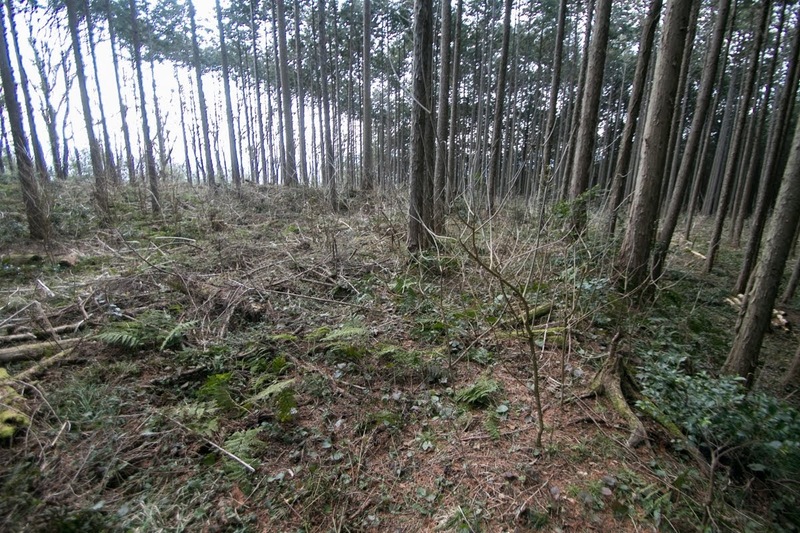 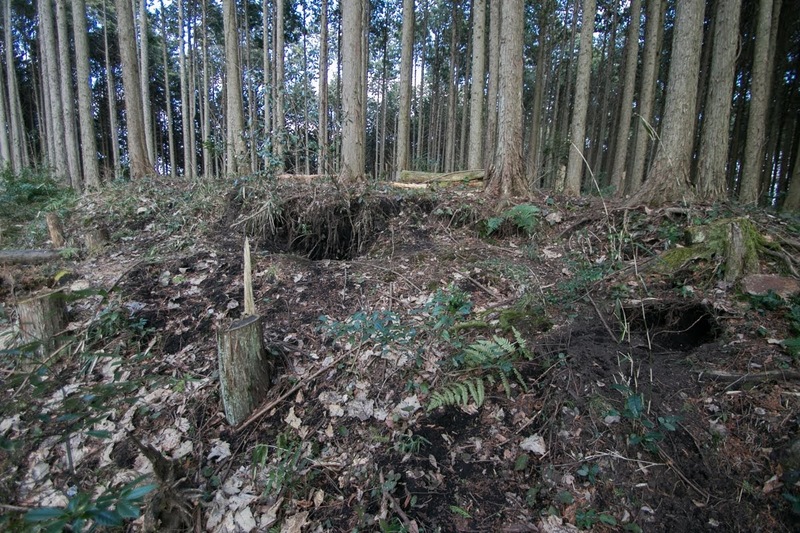 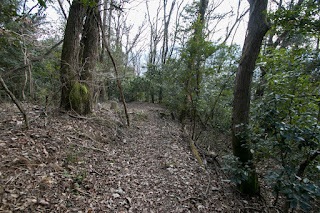 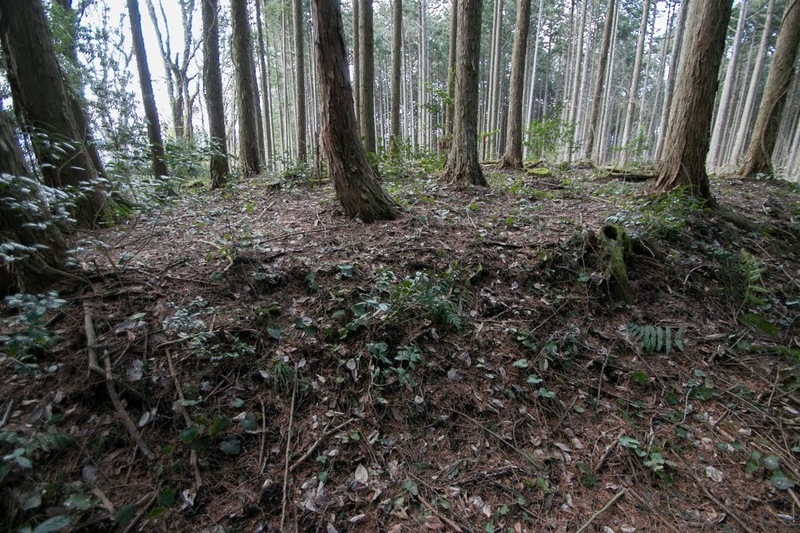 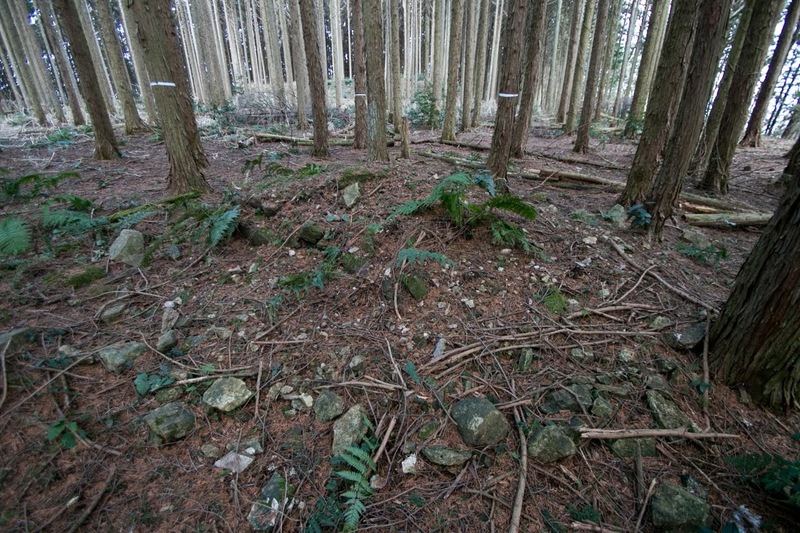 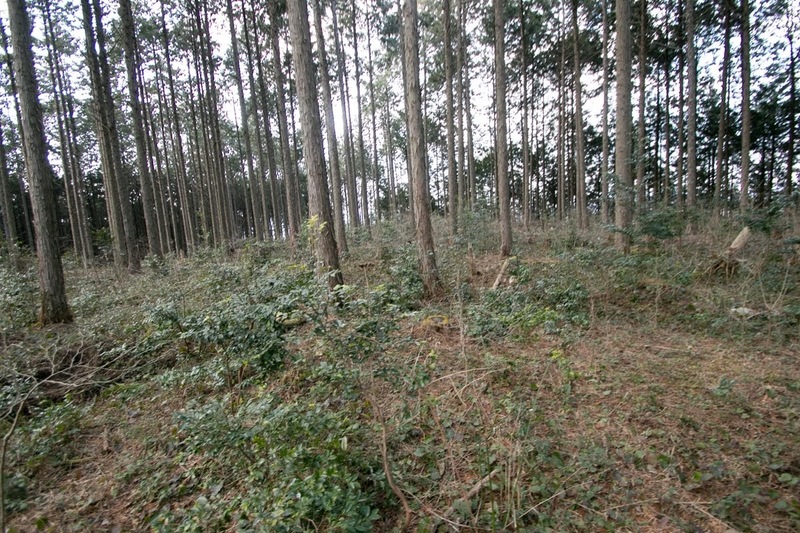 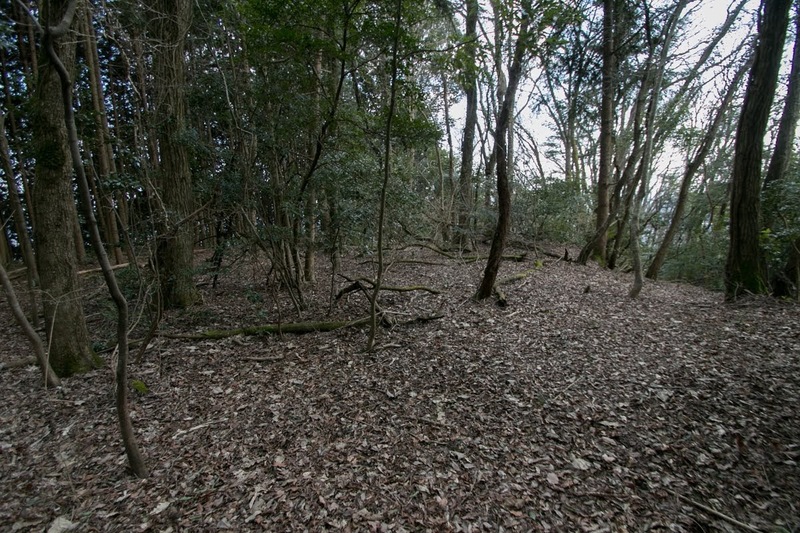 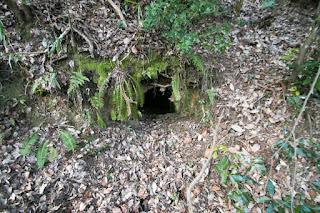 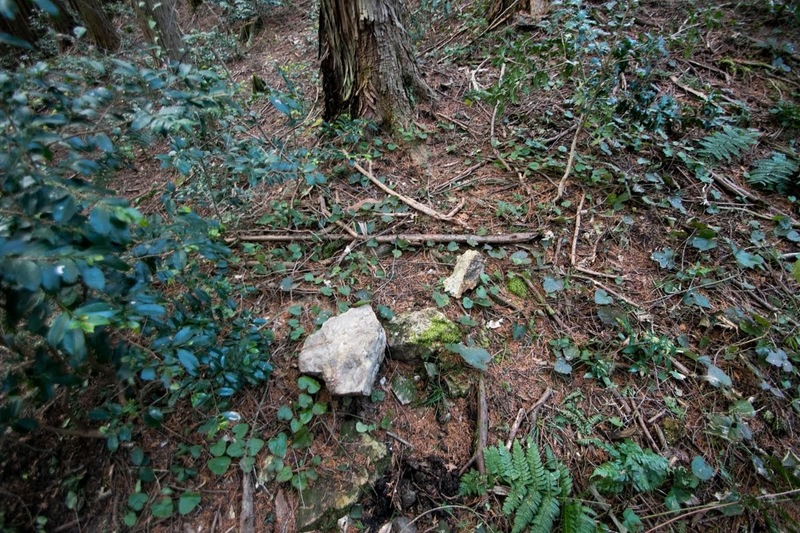 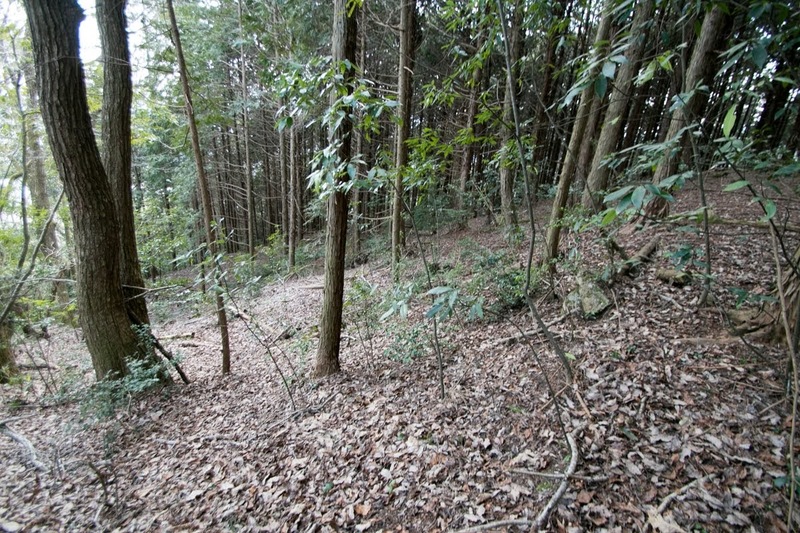 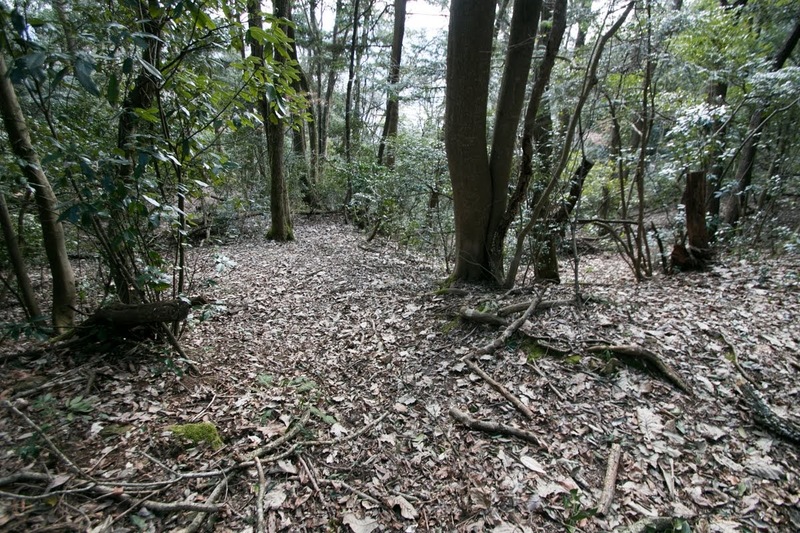 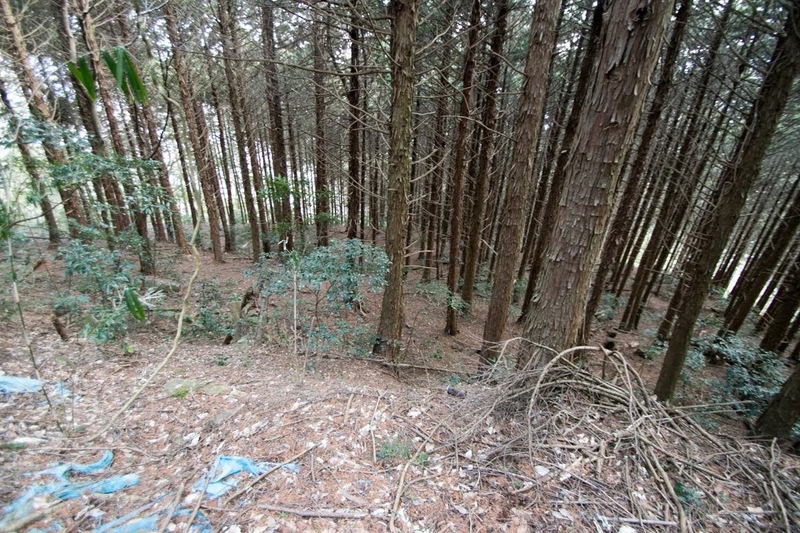 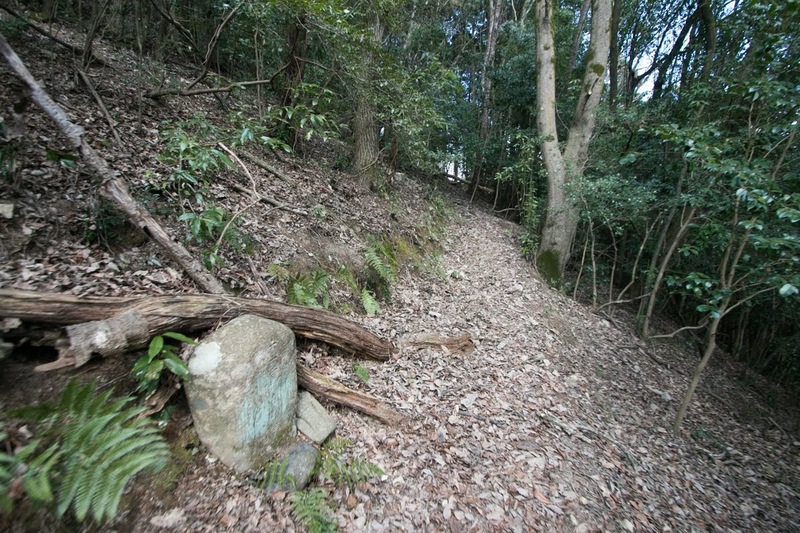 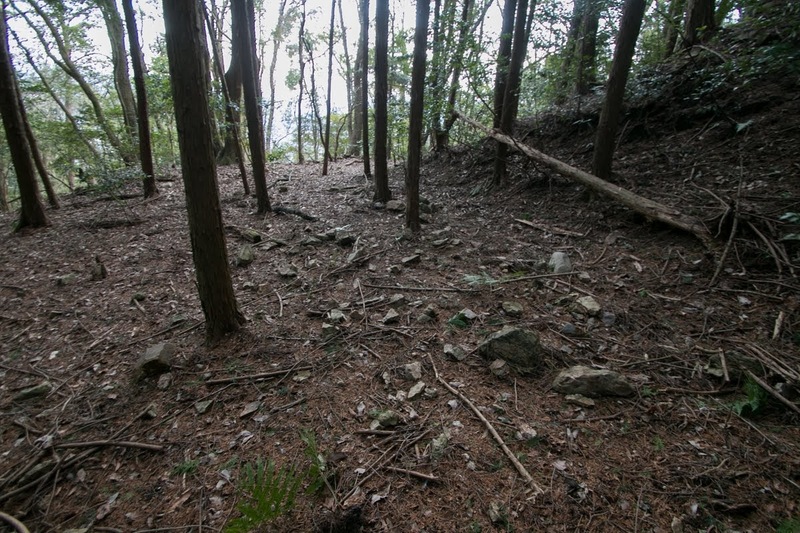 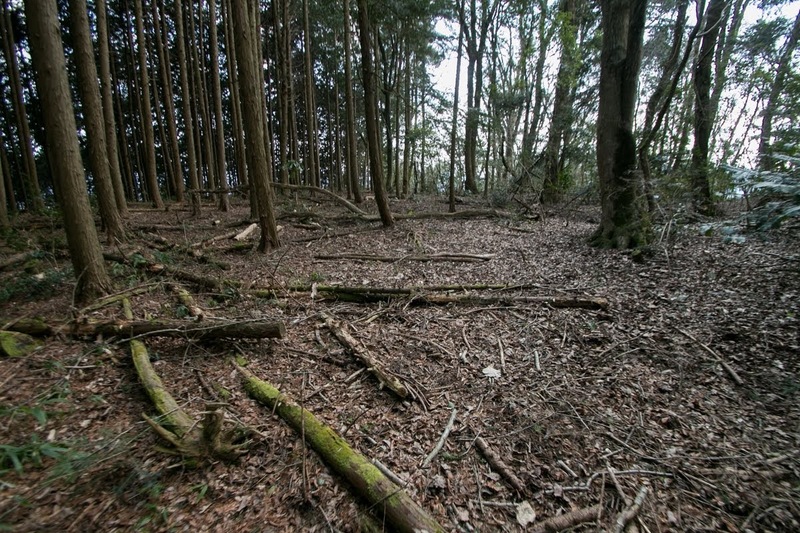 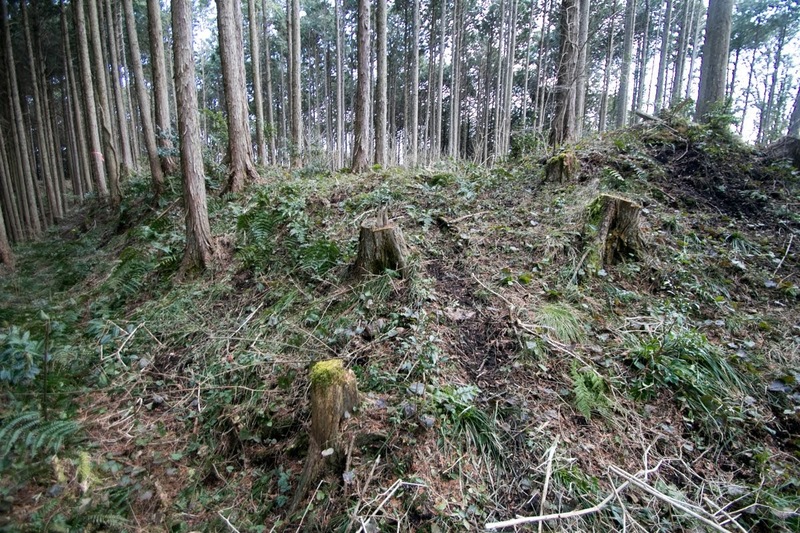 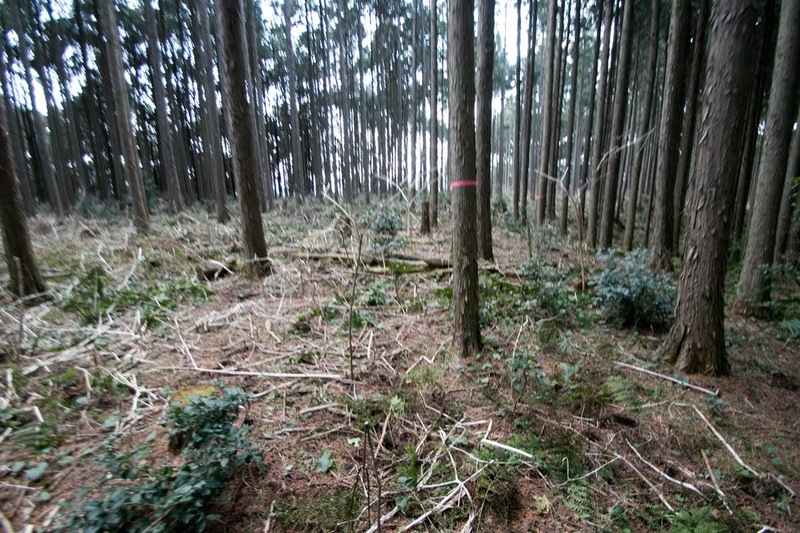 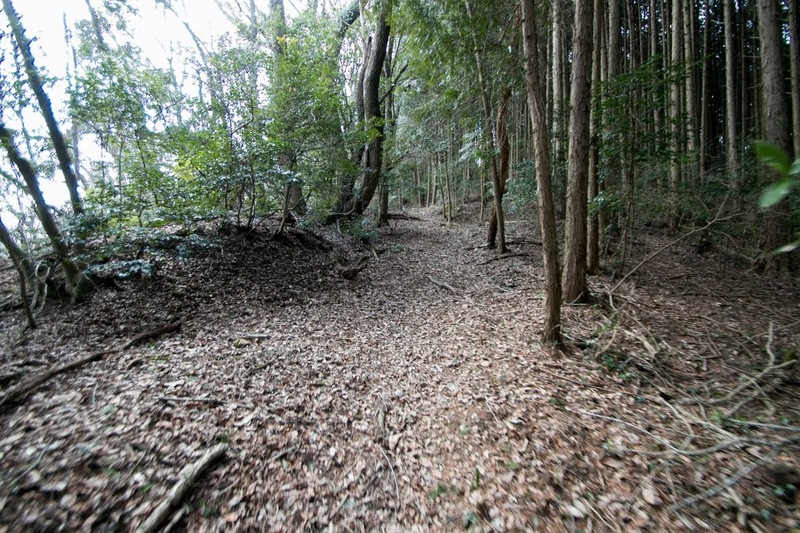 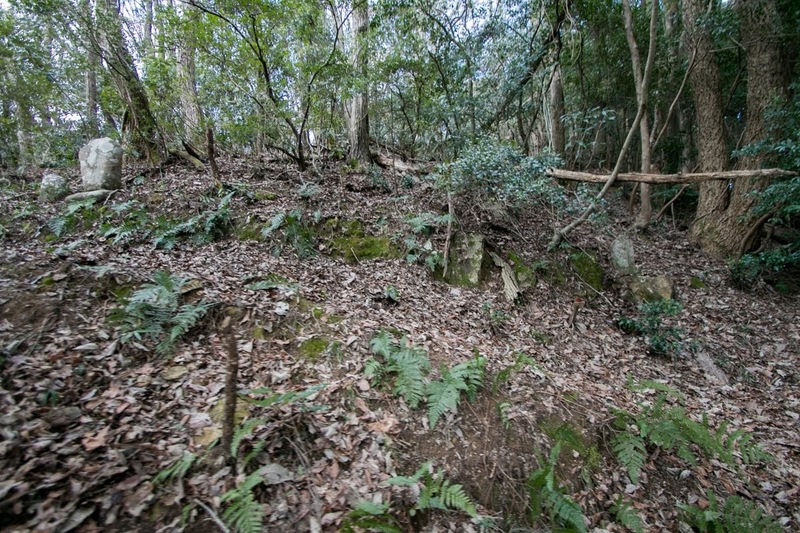 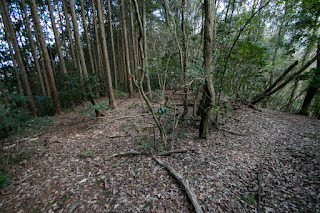 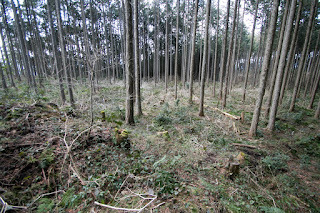 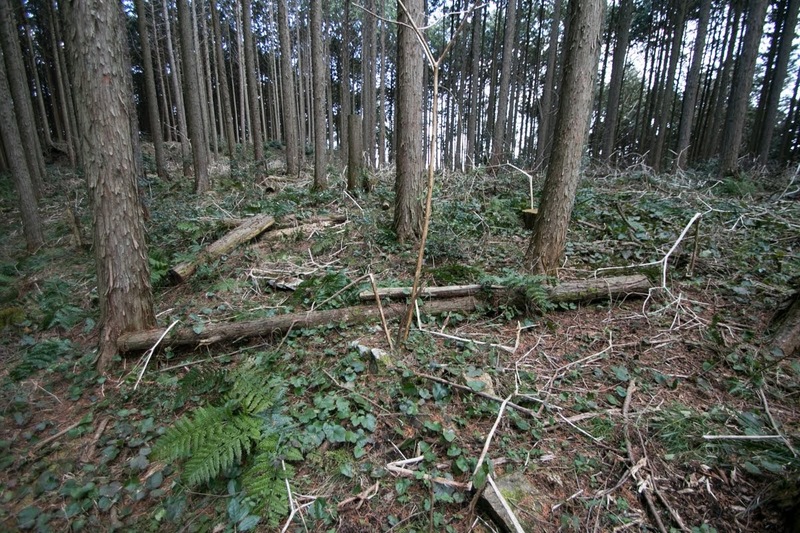 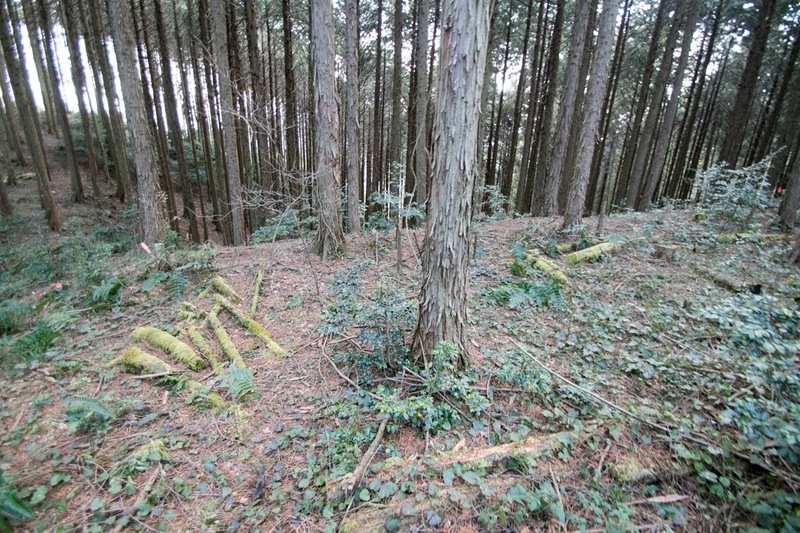 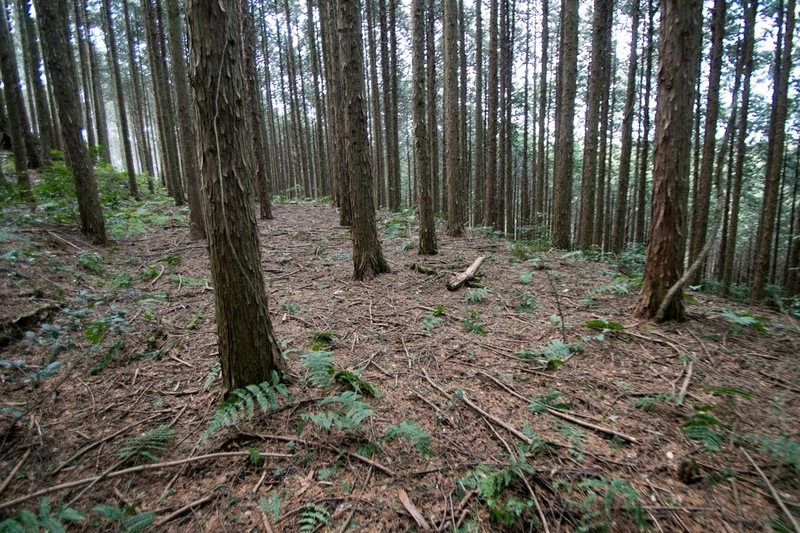 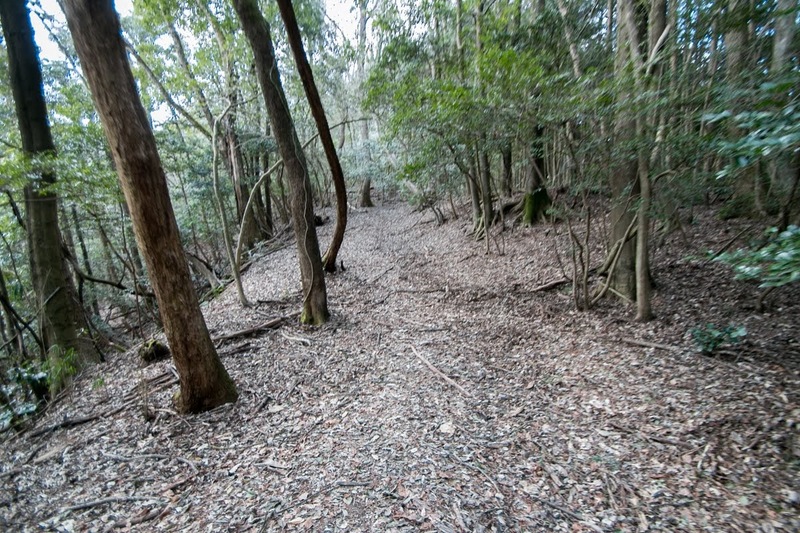 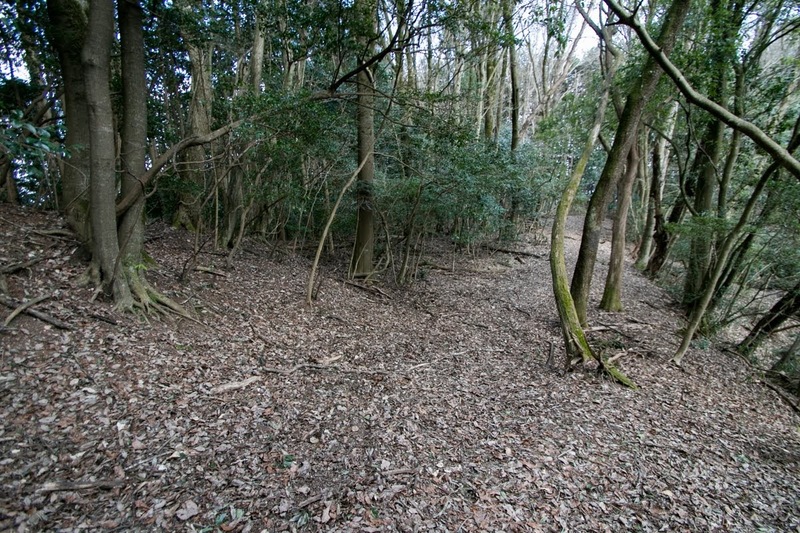 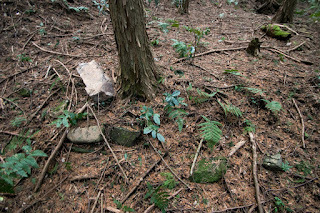 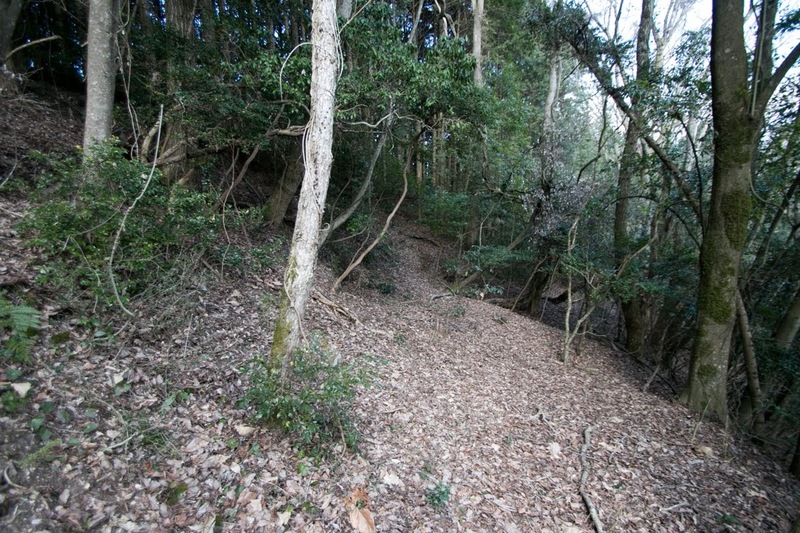 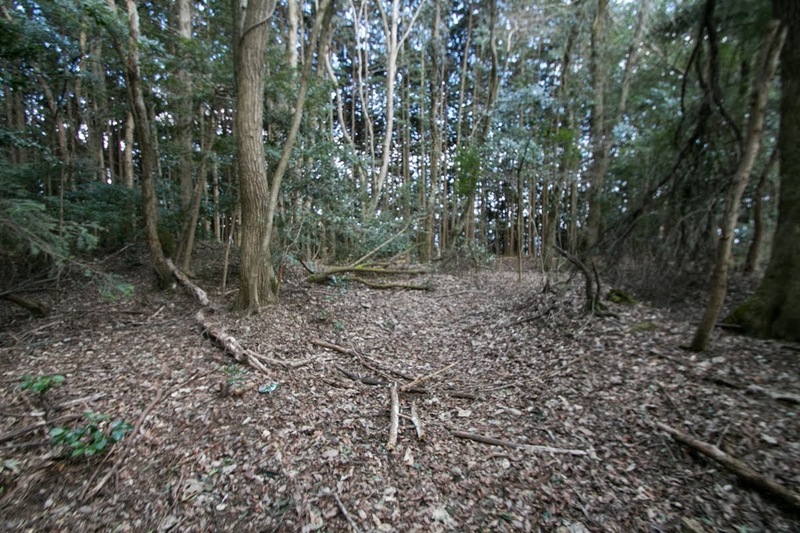 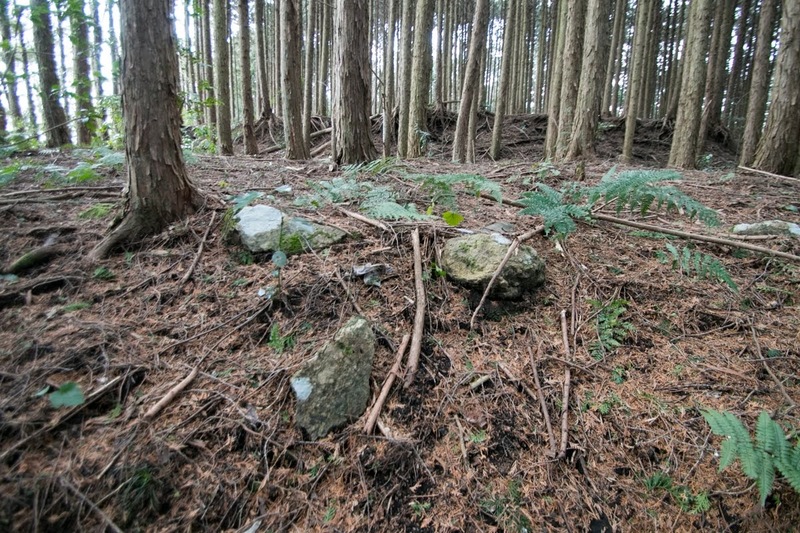 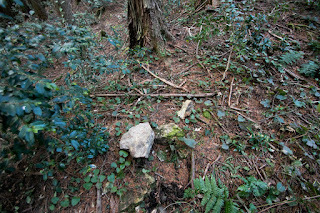 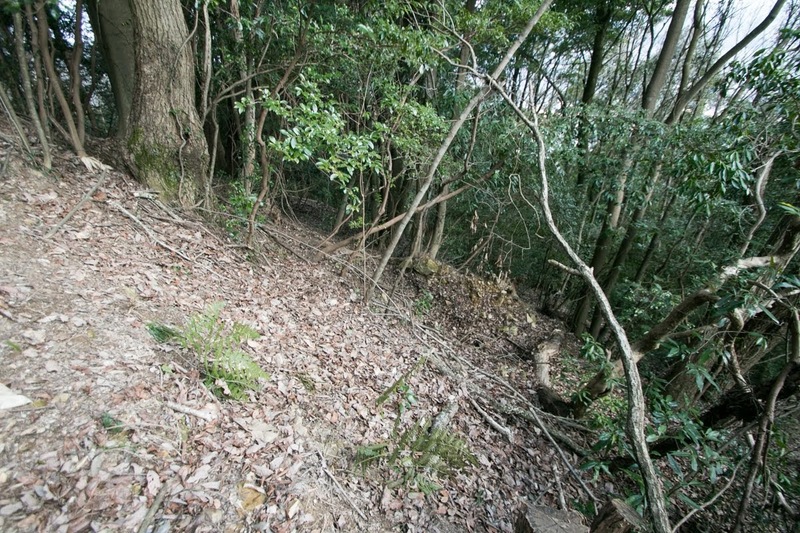 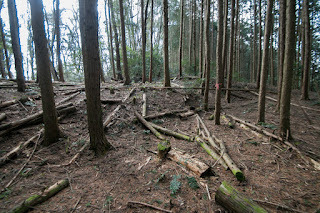 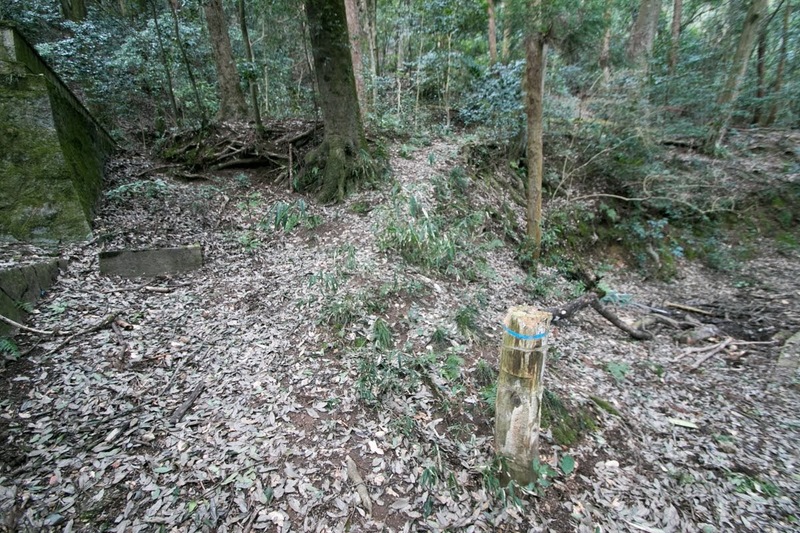 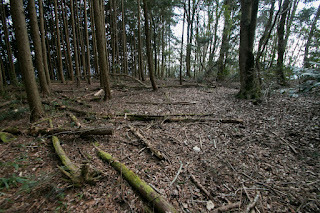 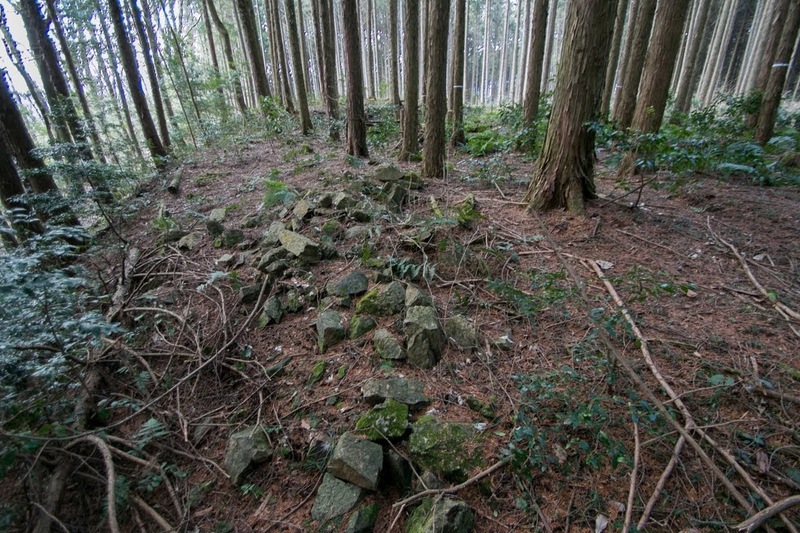 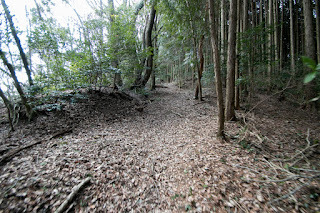 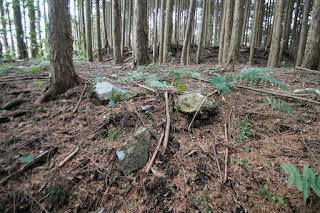 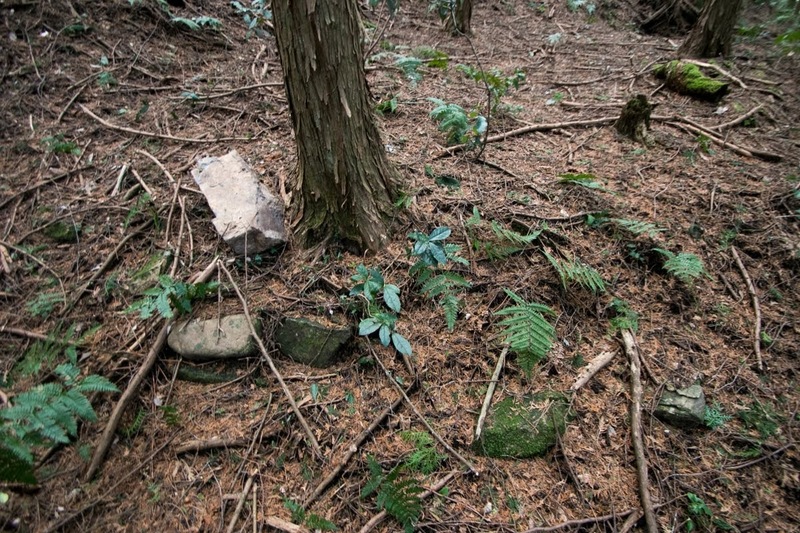 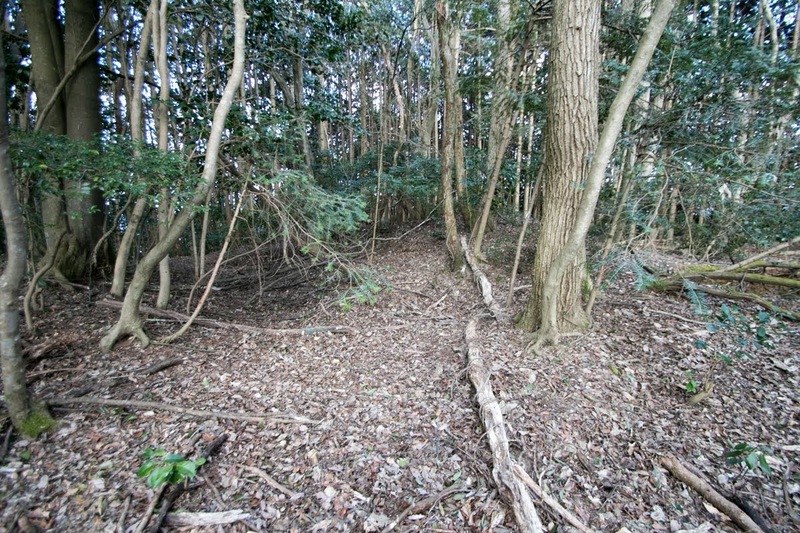 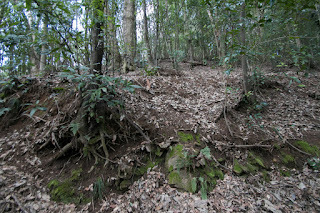 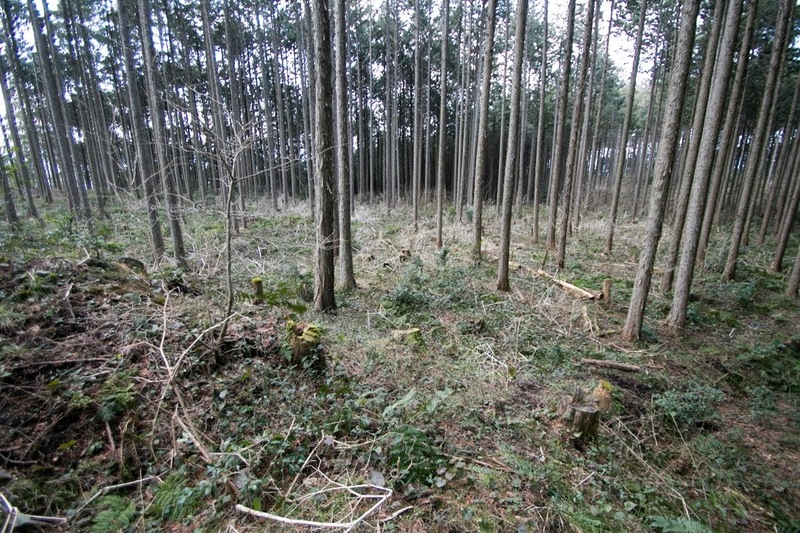 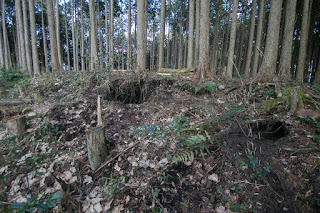 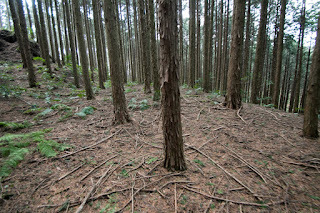 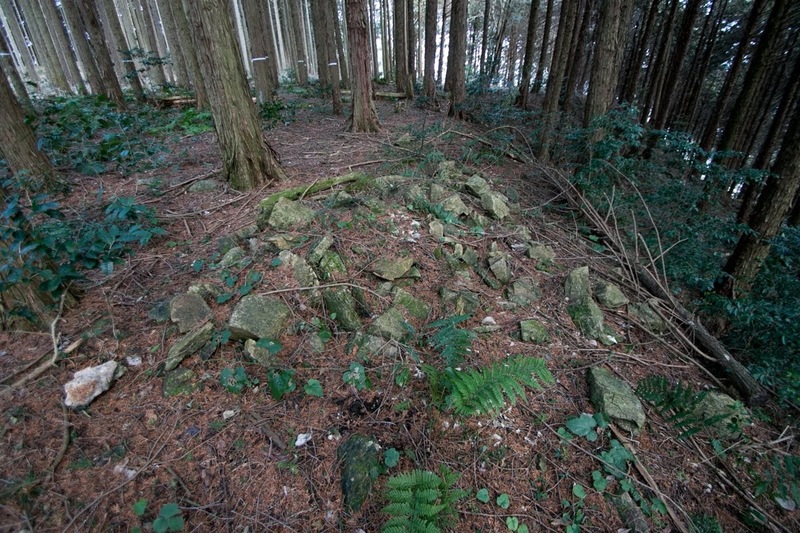 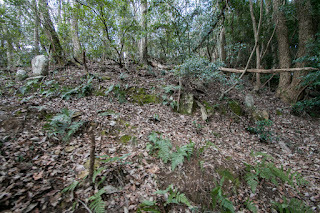 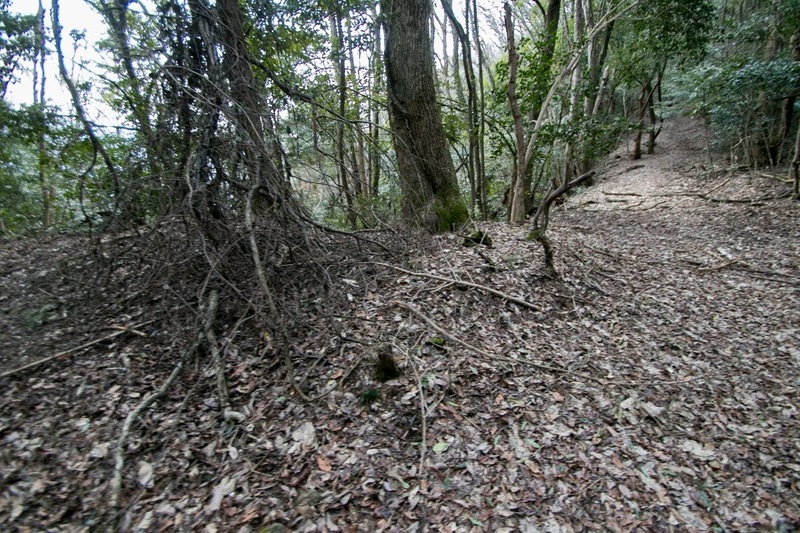 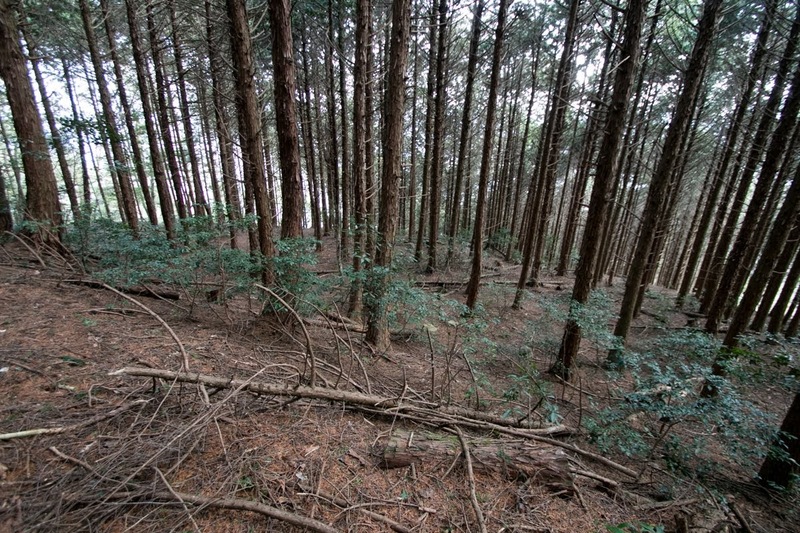 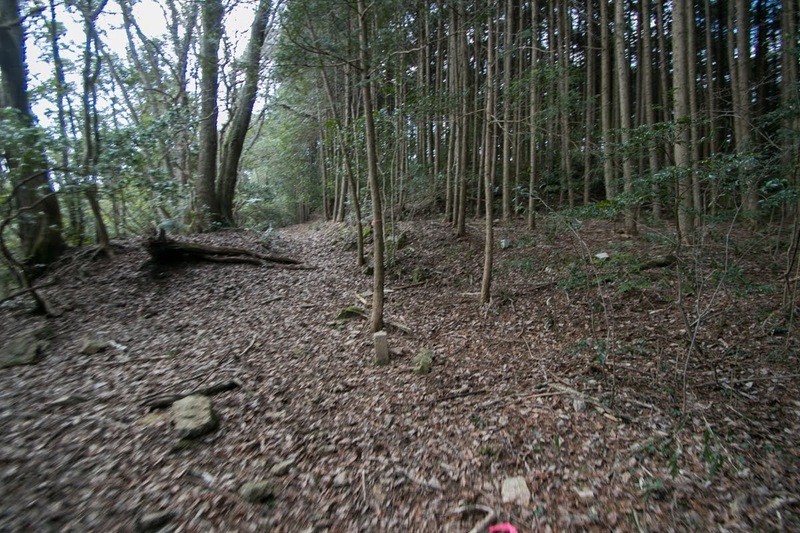 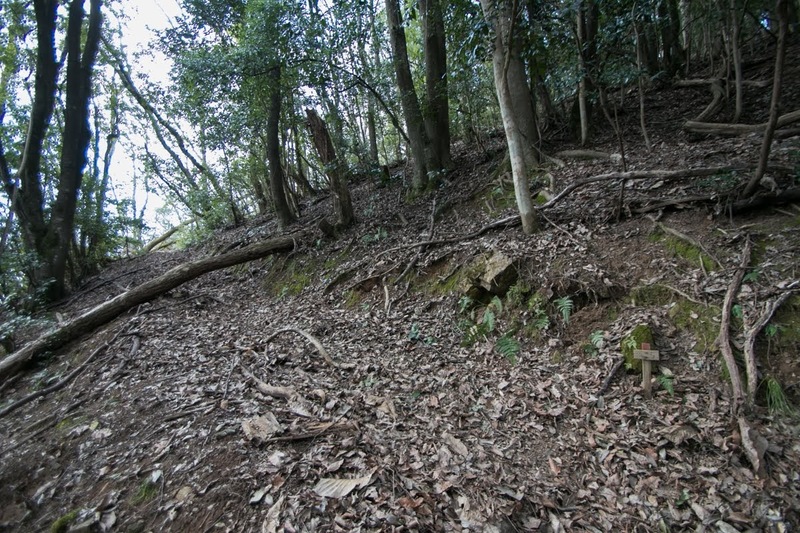 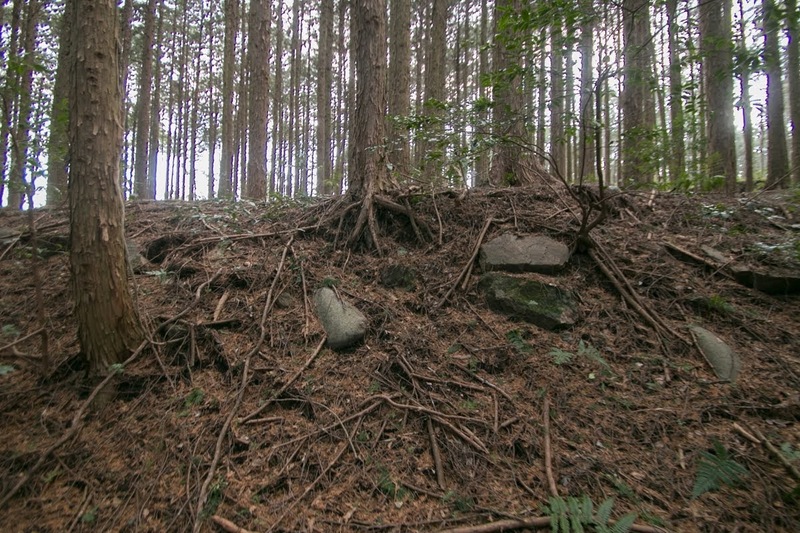 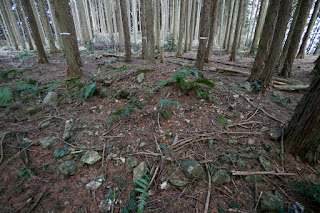 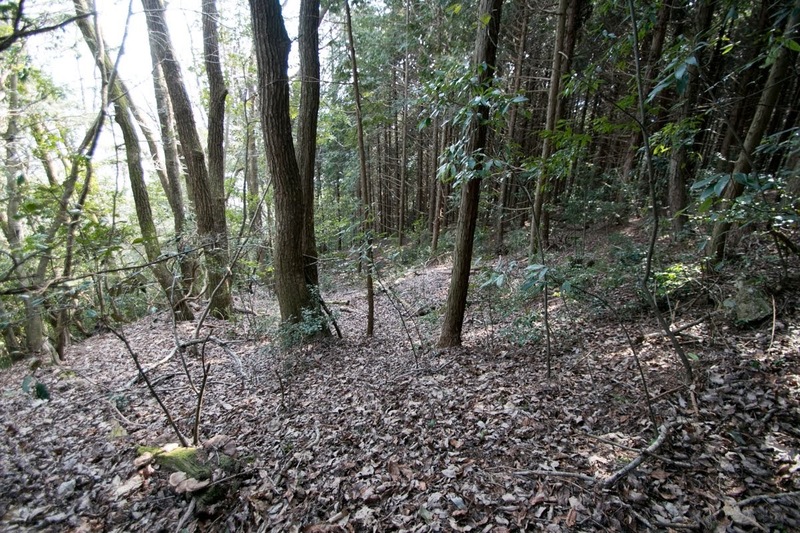 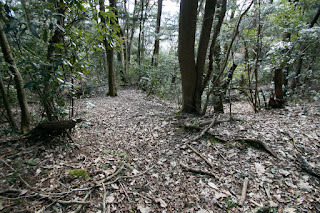 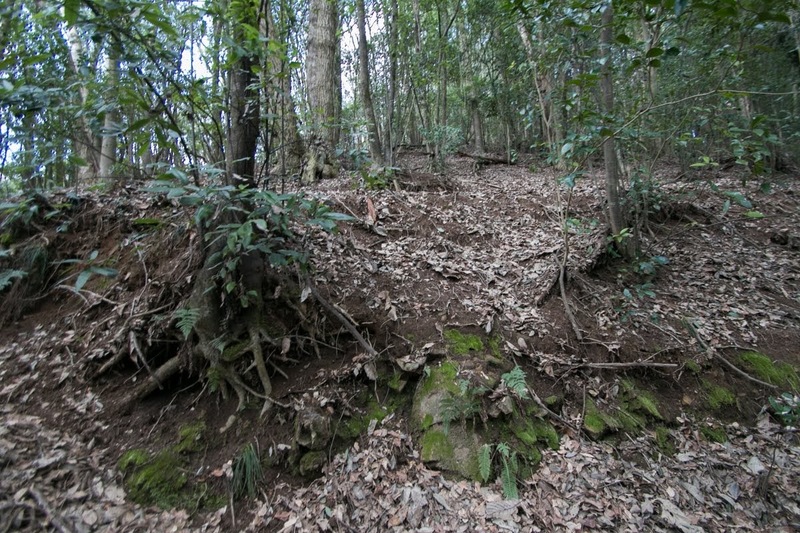 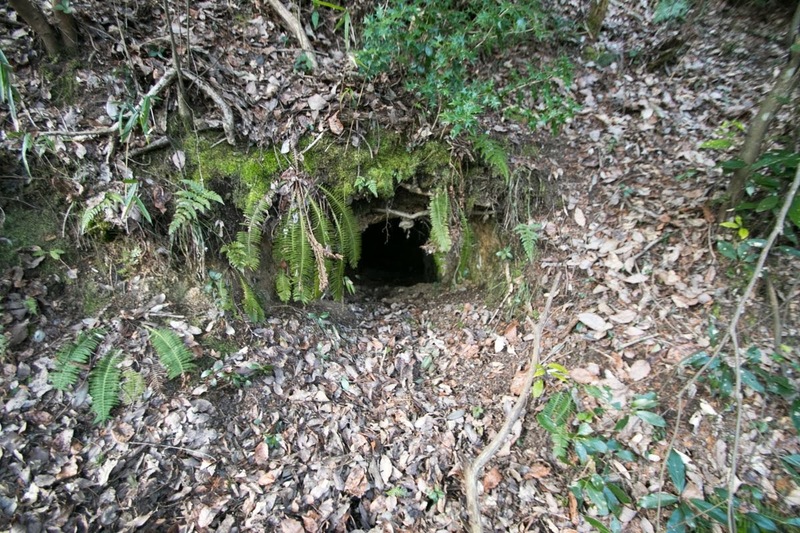 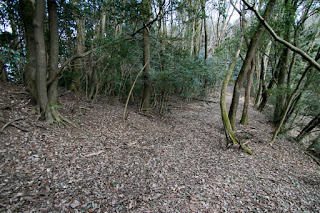 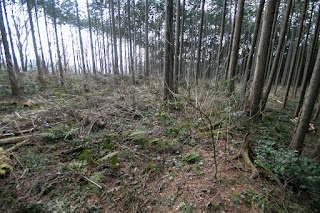 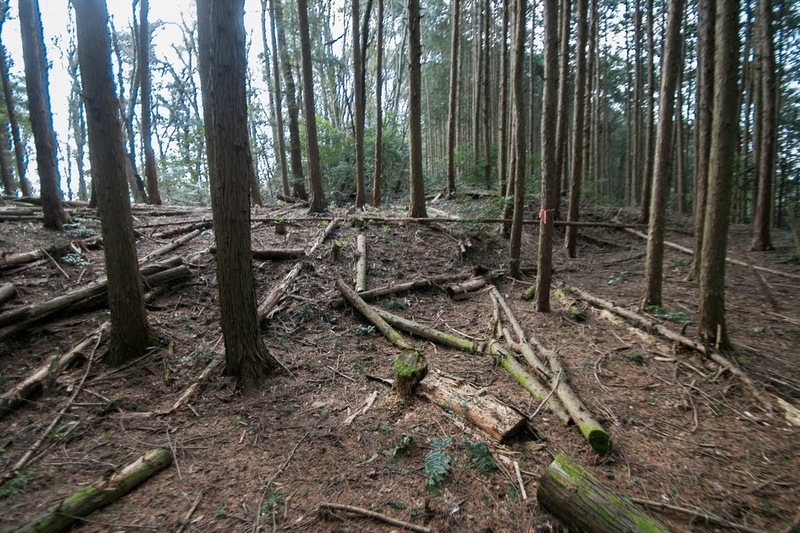 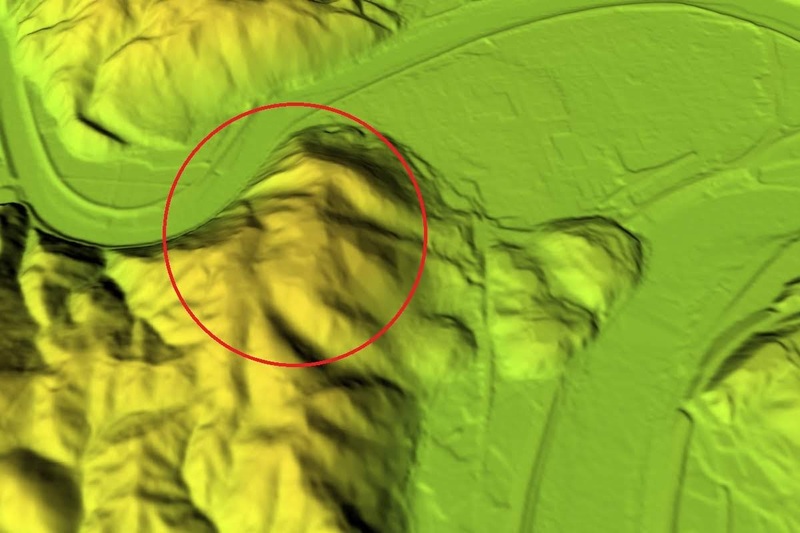 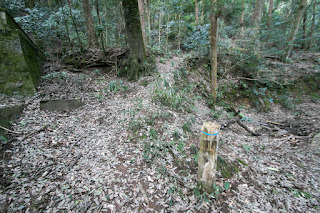 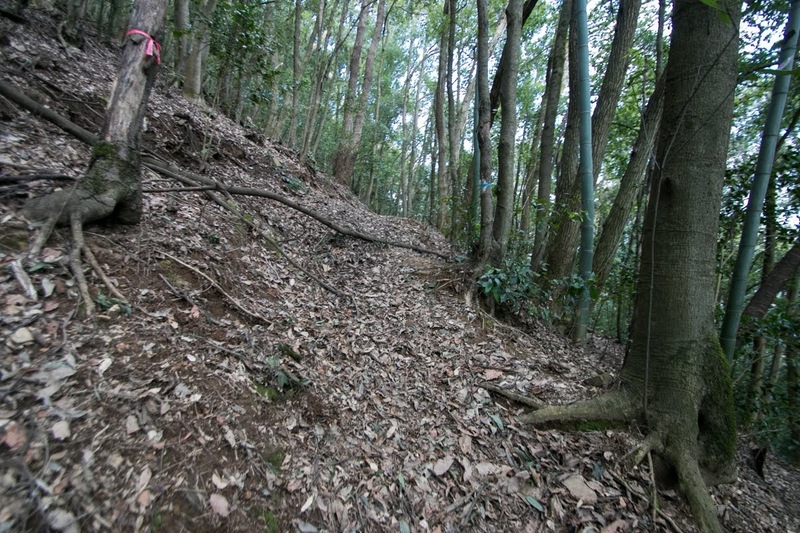 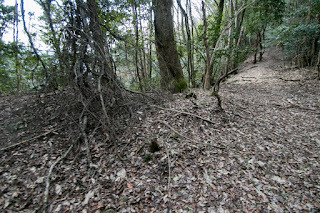 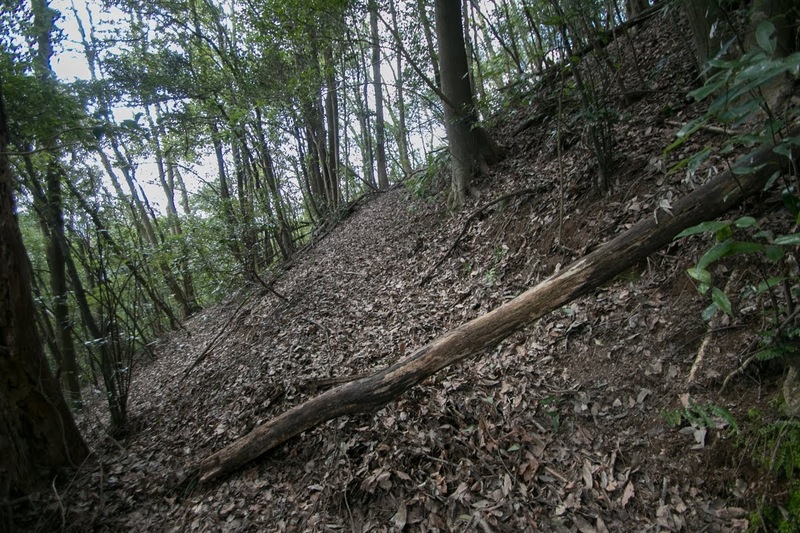 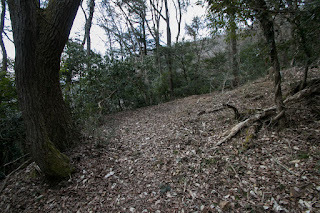 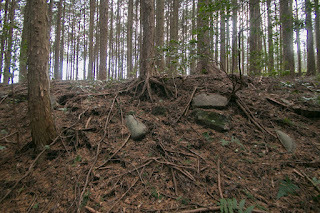 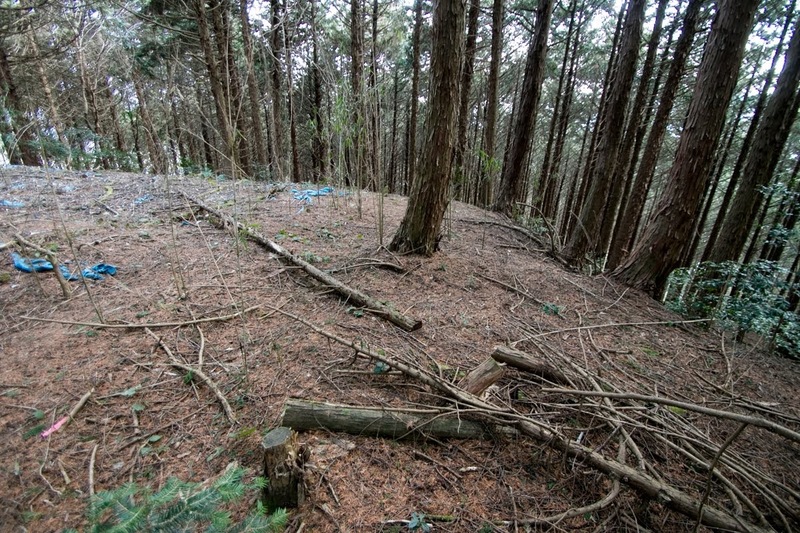 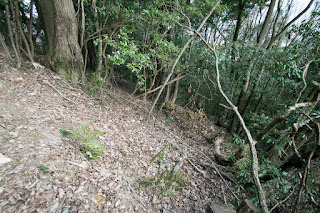 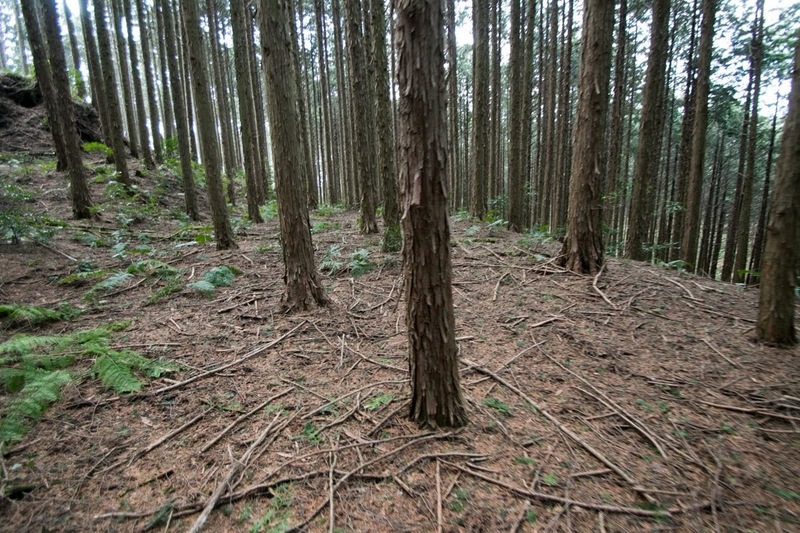 Castle site locates at the northwestern corner of Miyoshi basin, which is a parallelogram one of about 20 kilometer spreads in the north part of current Hiroshima prefecture. 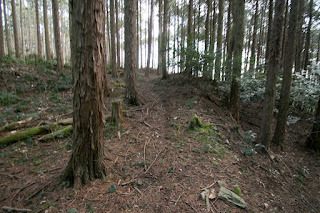 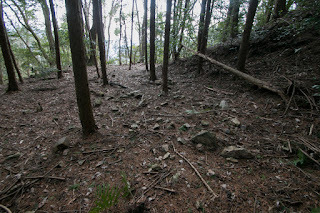 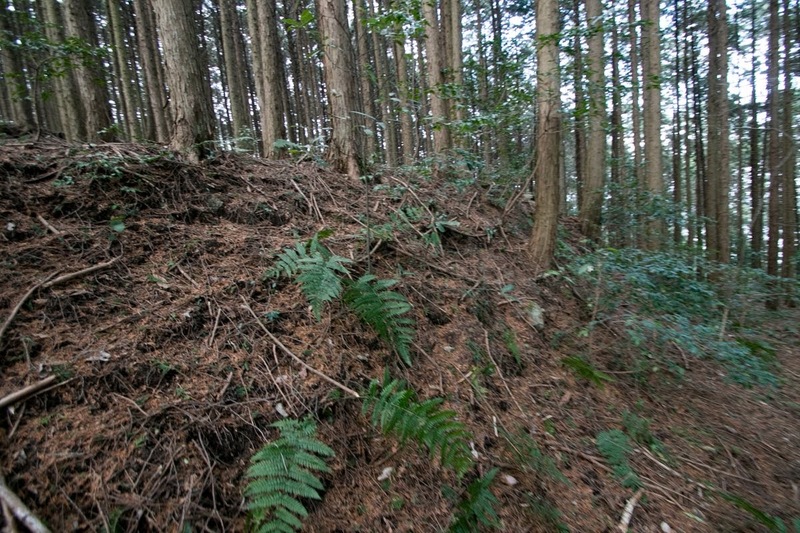 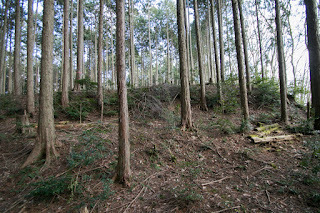 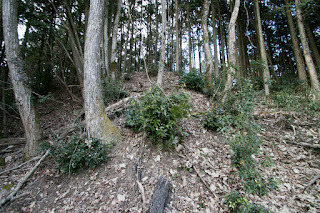 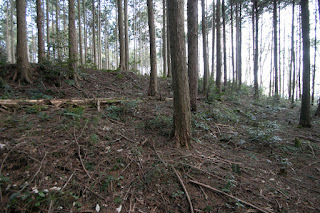 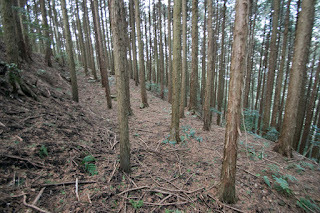 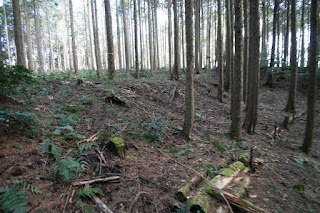 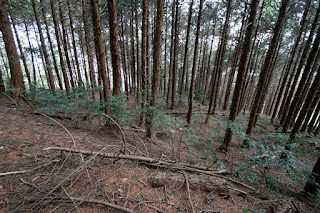 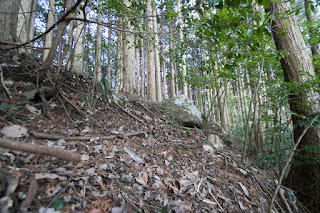 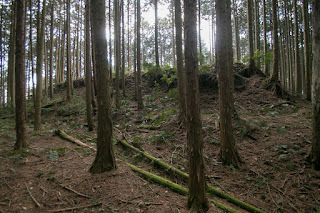 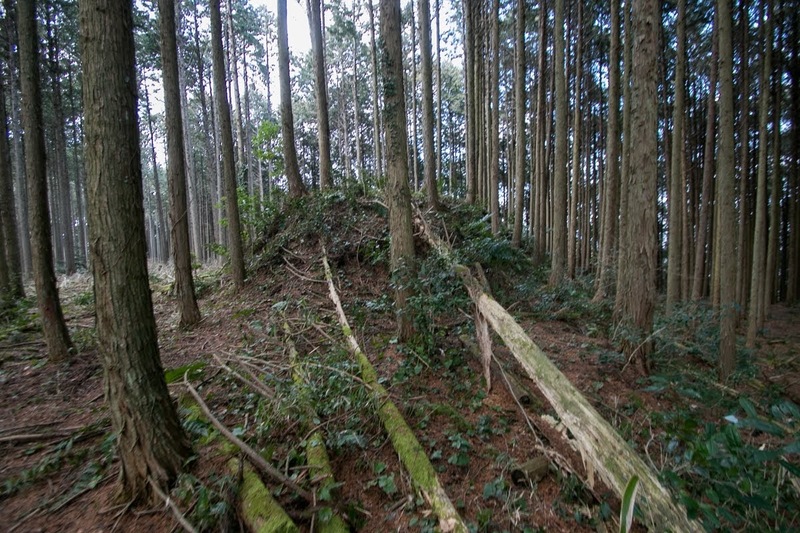 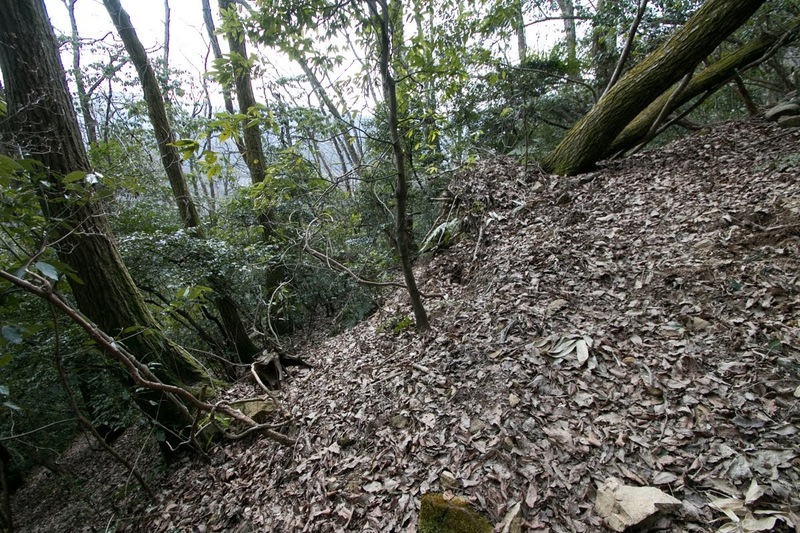 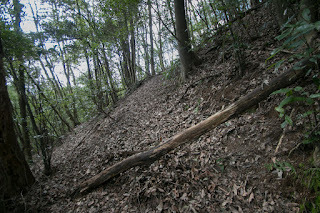 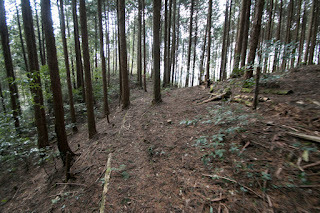 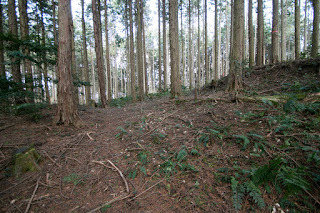 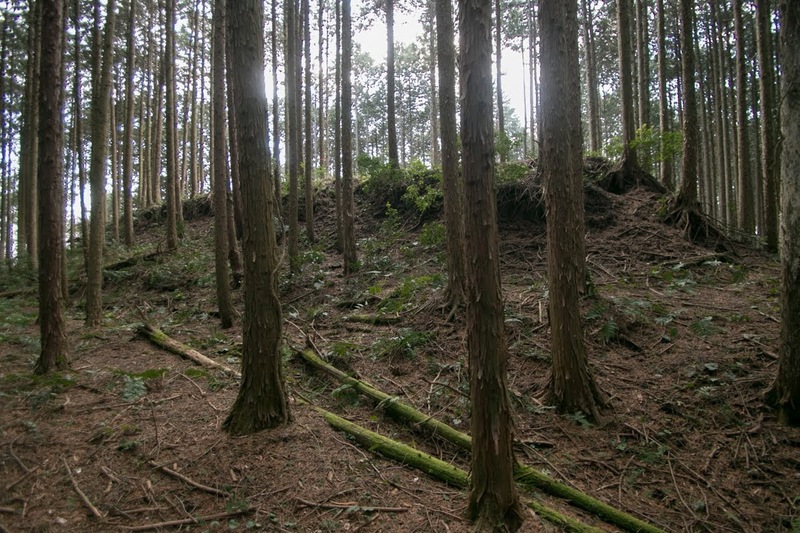 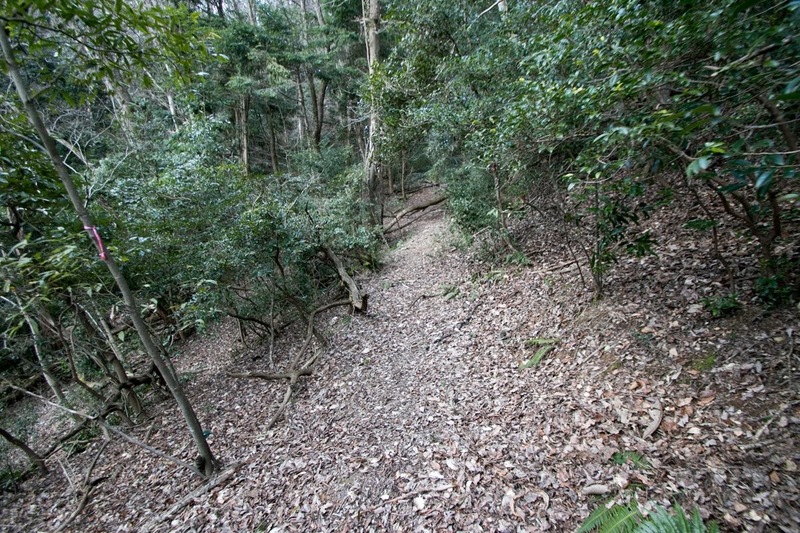 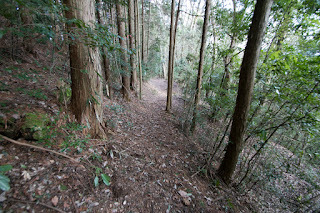 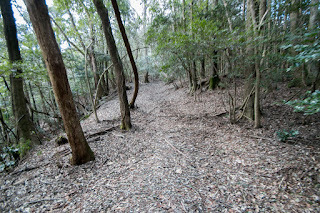 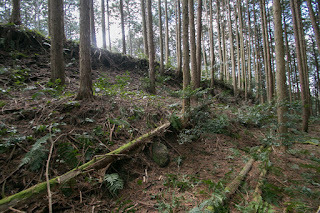 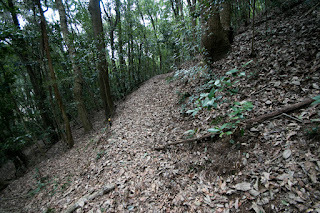 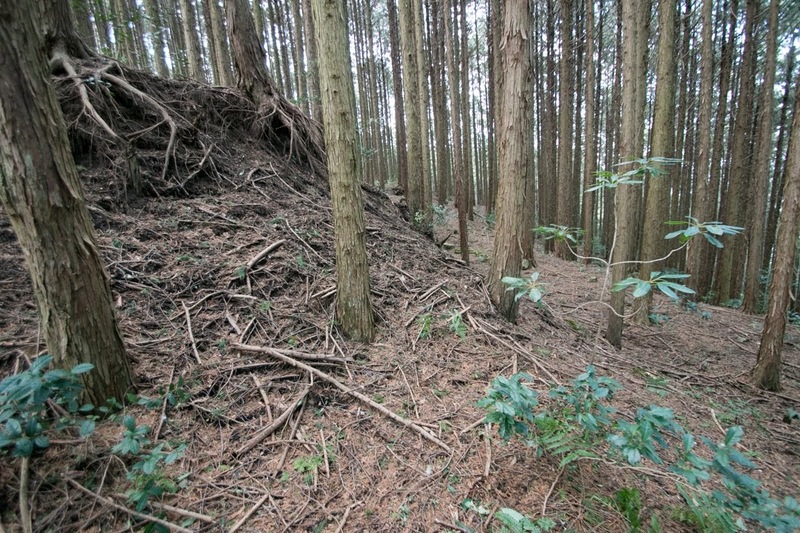 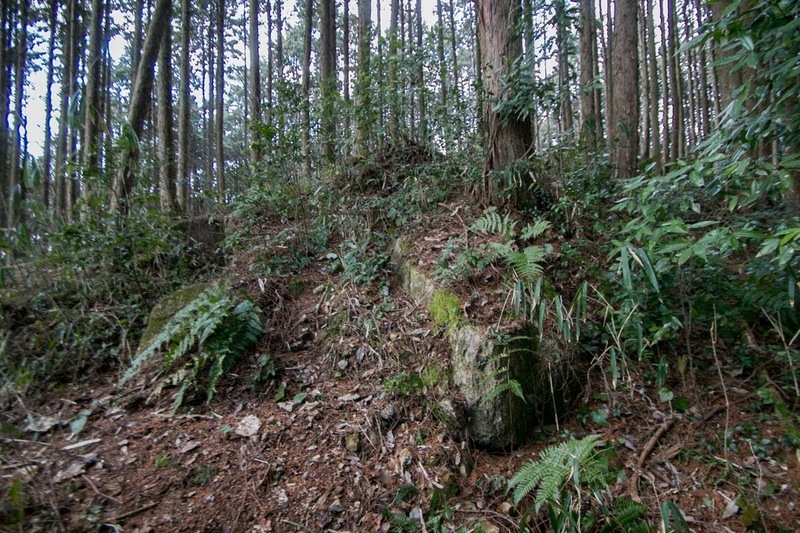 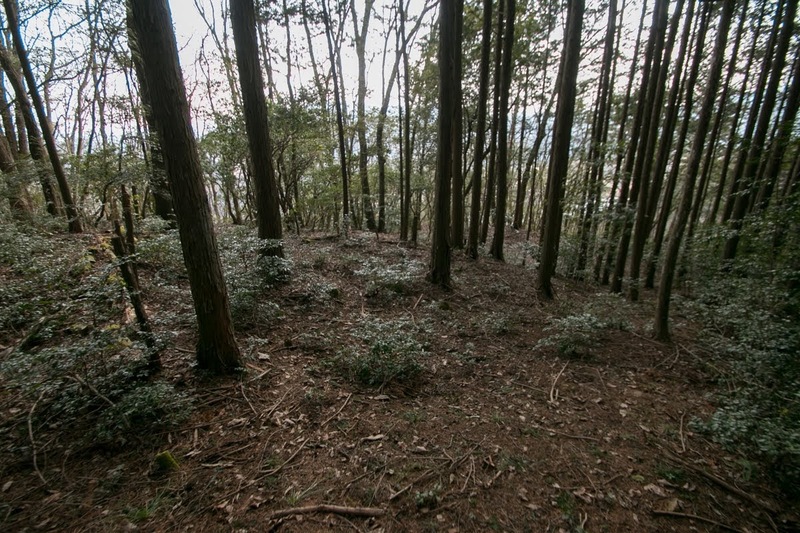 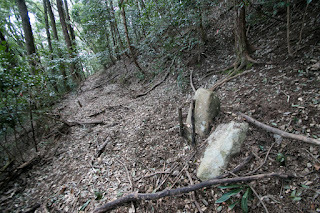 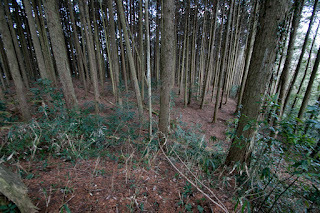 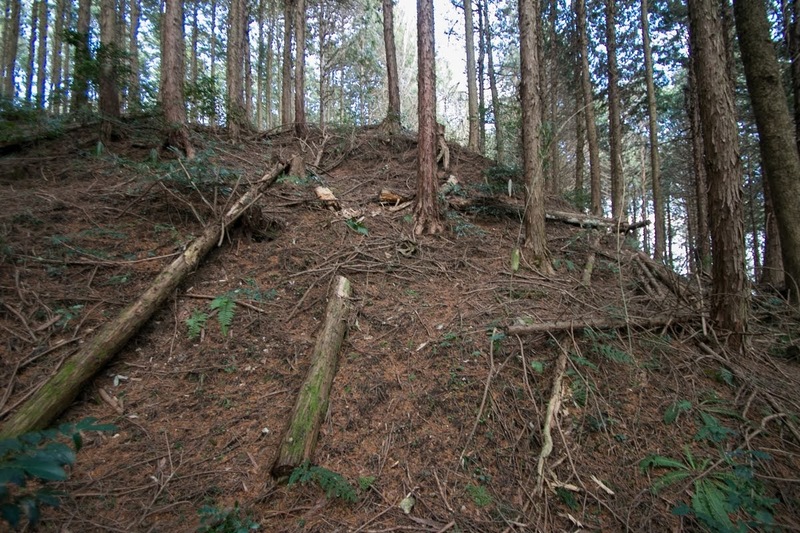 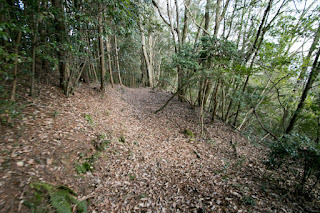 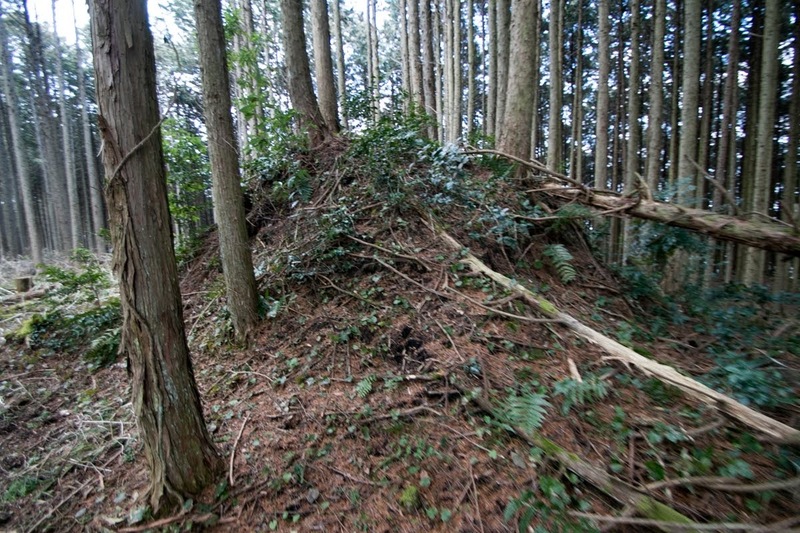 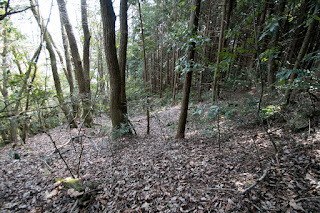 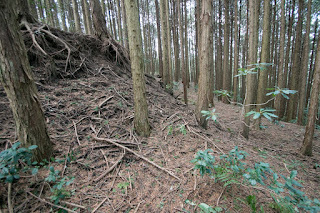 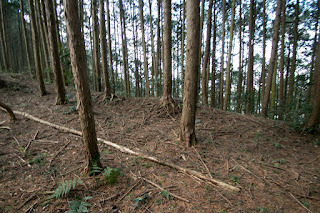 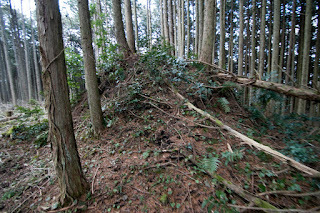 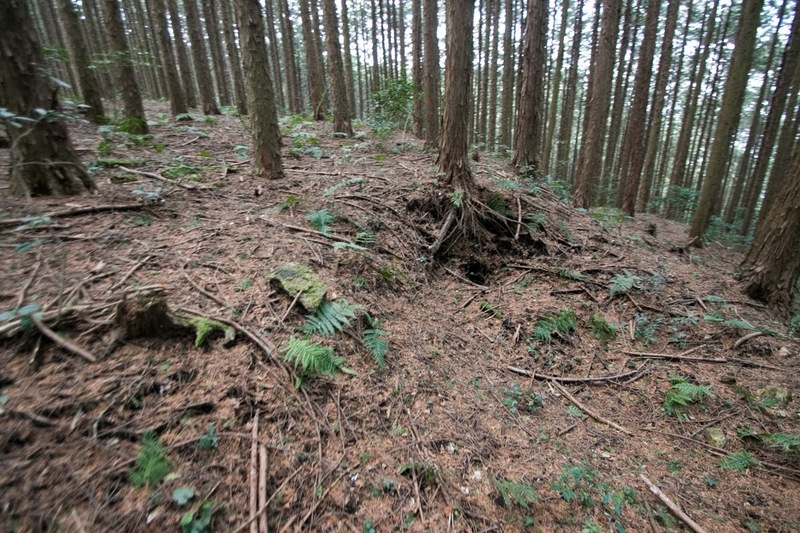 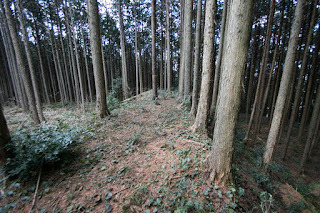 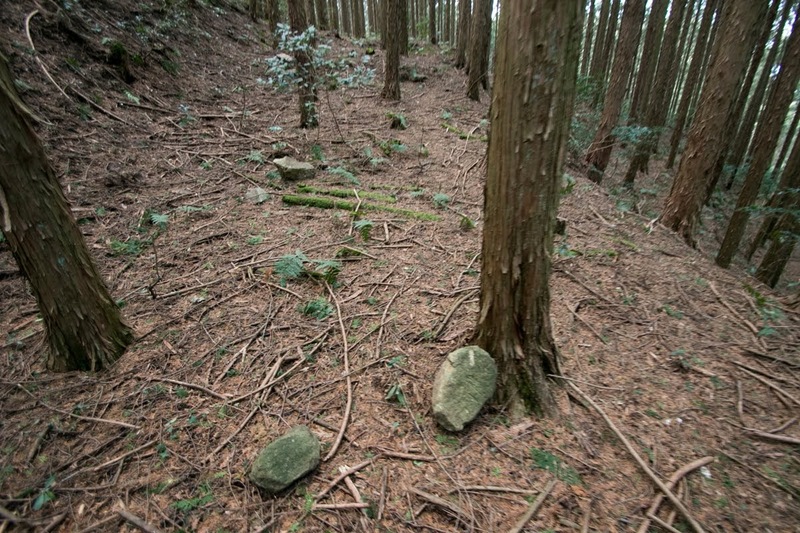 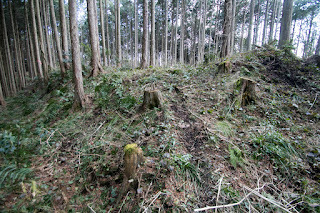 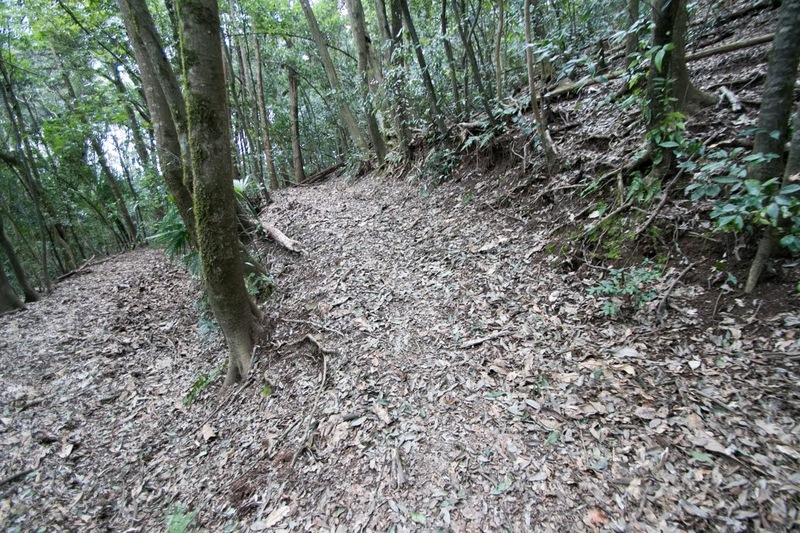 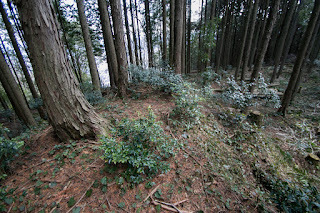 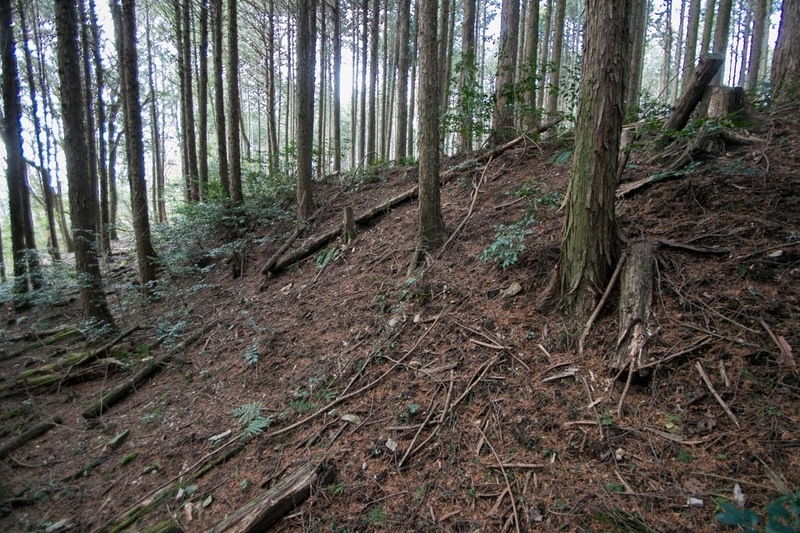 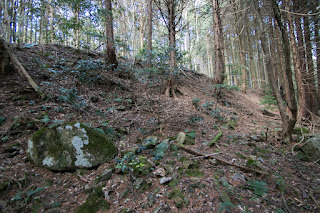 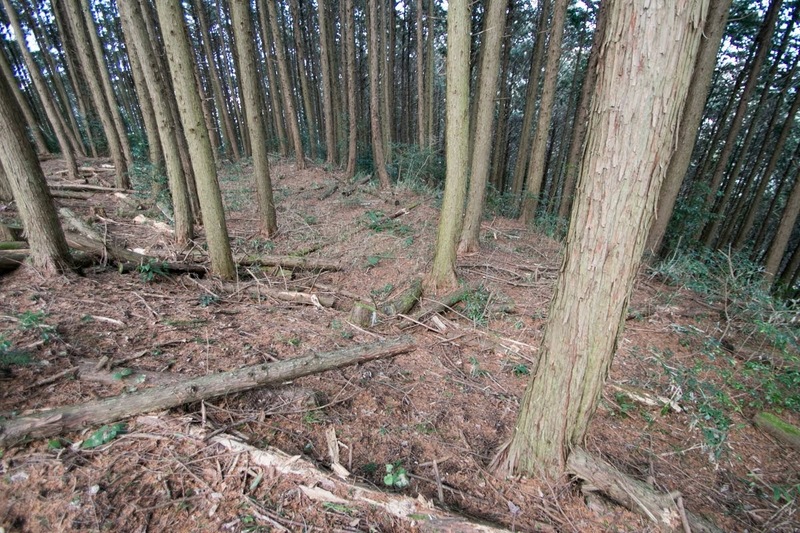 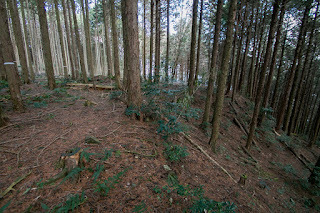 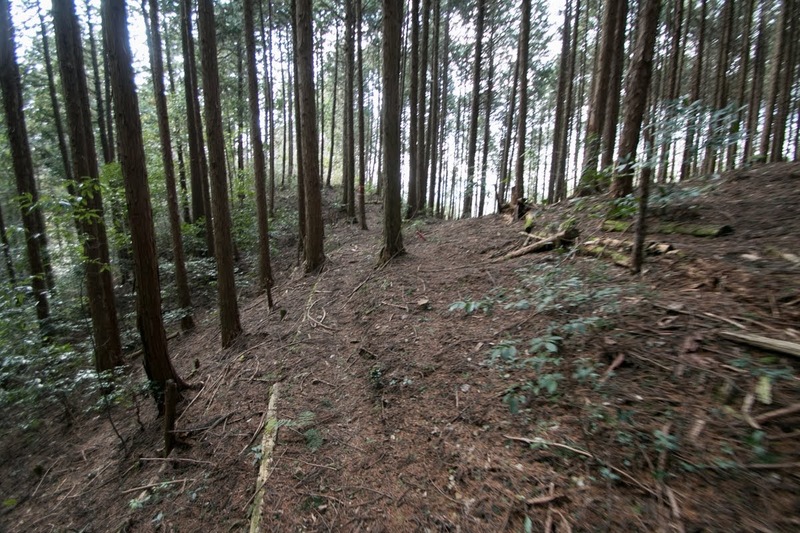 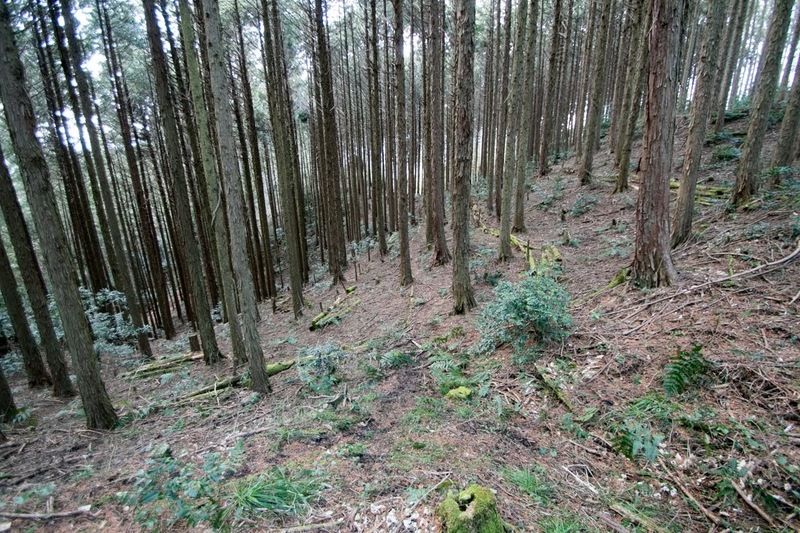 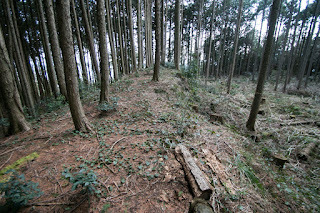 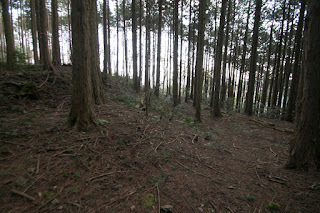 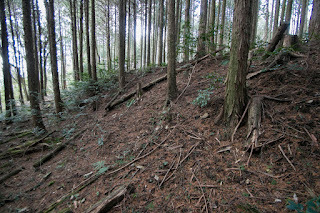 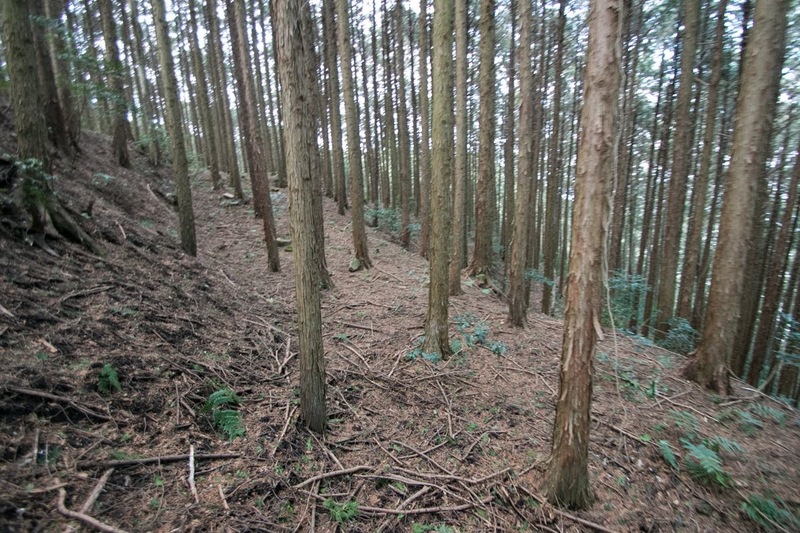 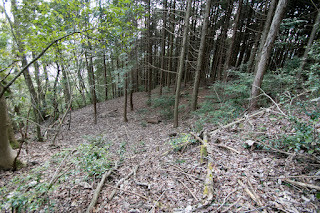 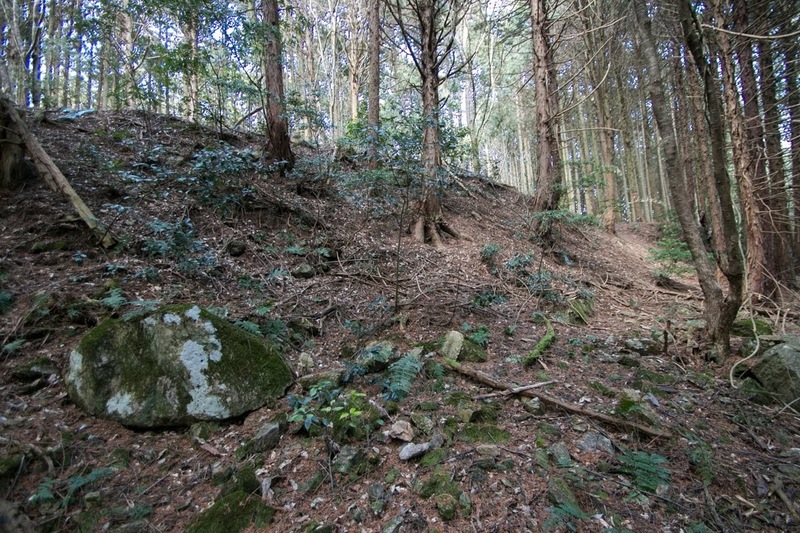 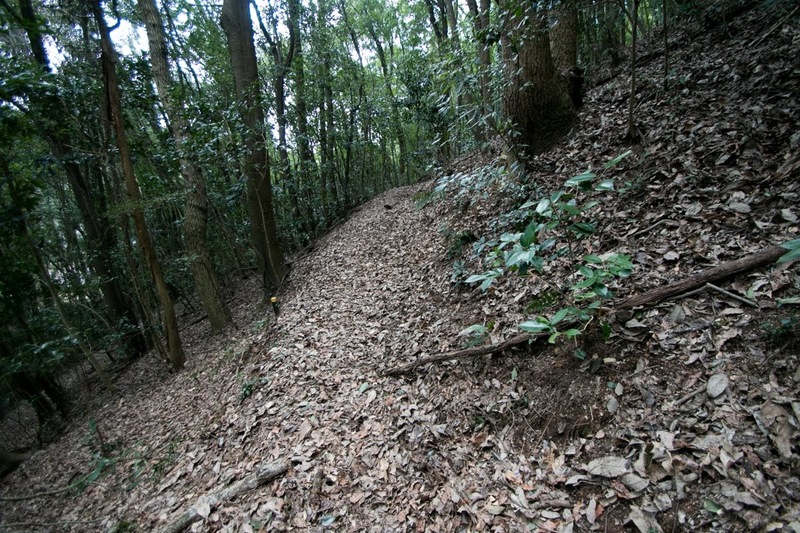 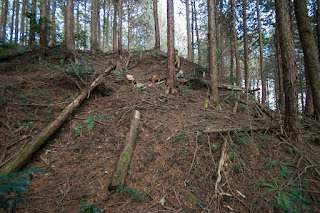 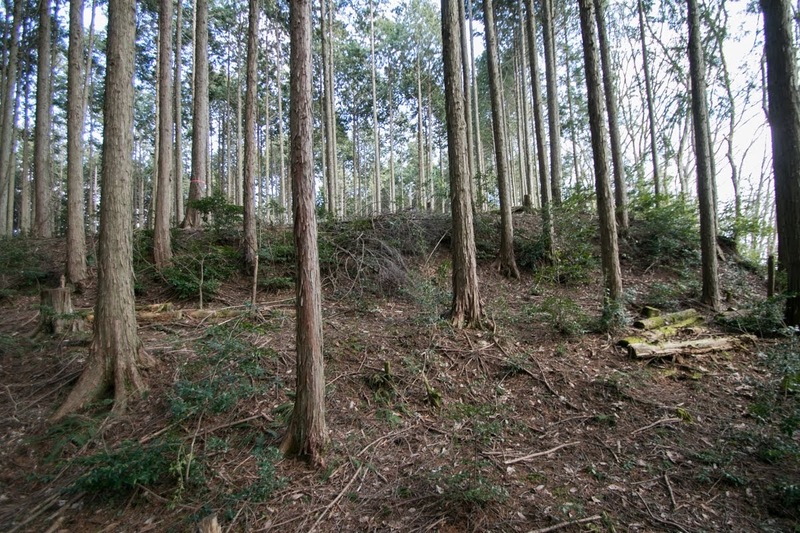 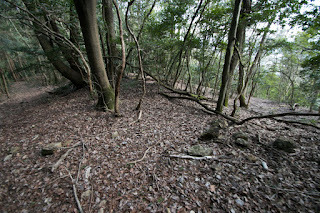 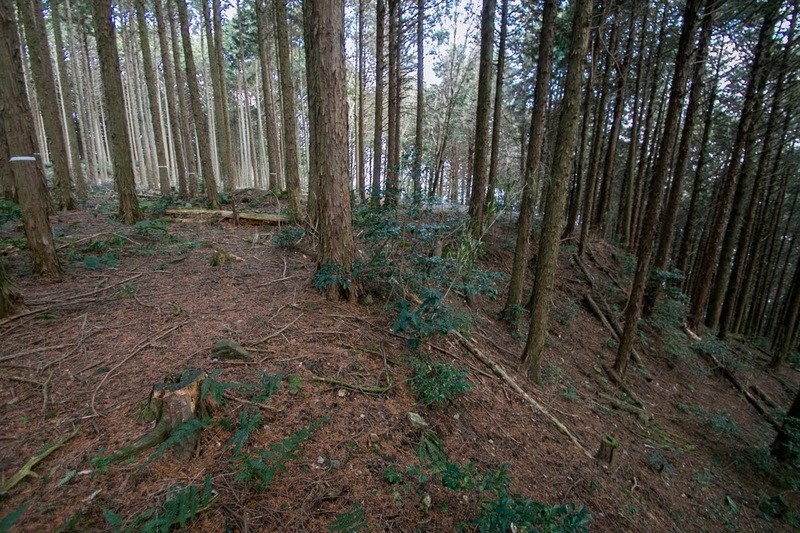 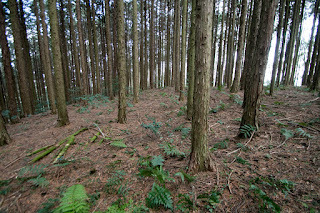 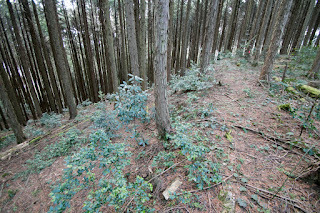 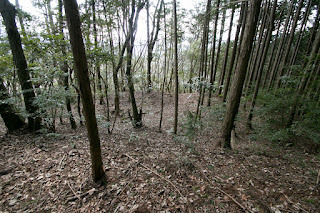 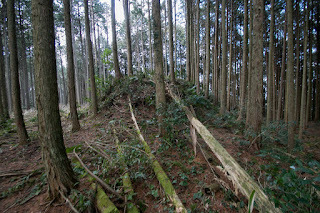 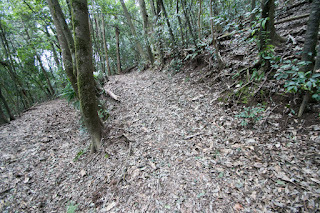 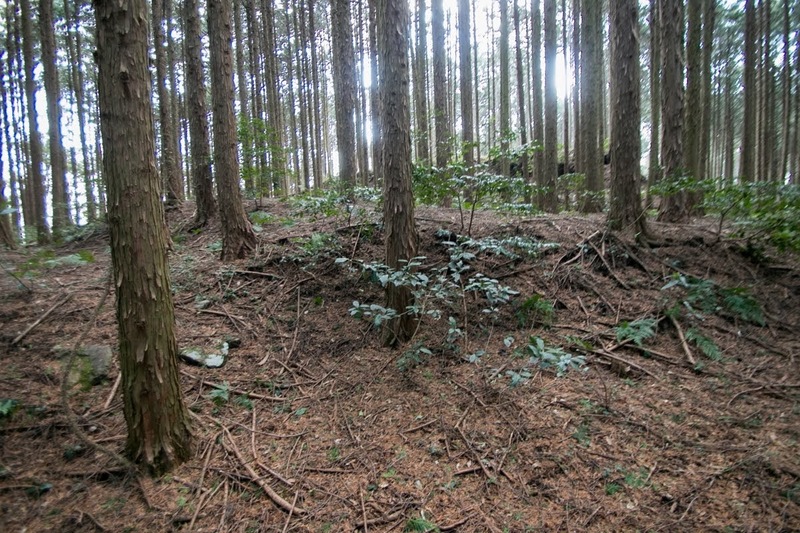 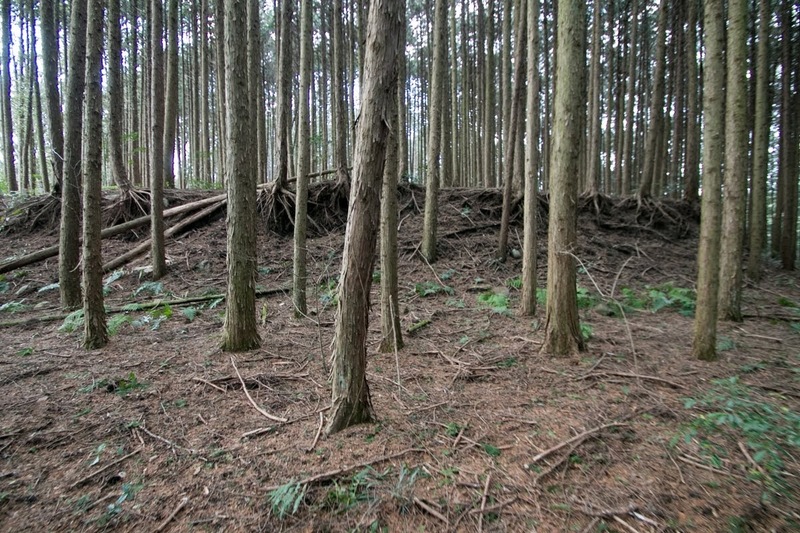 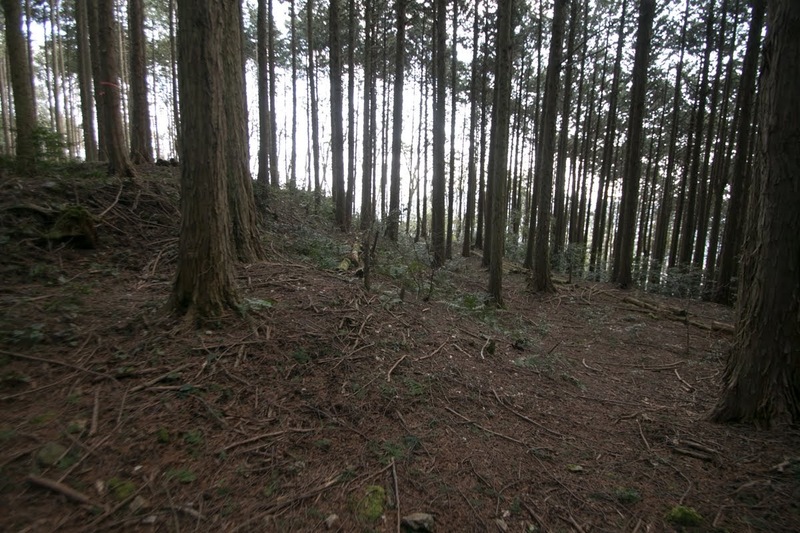 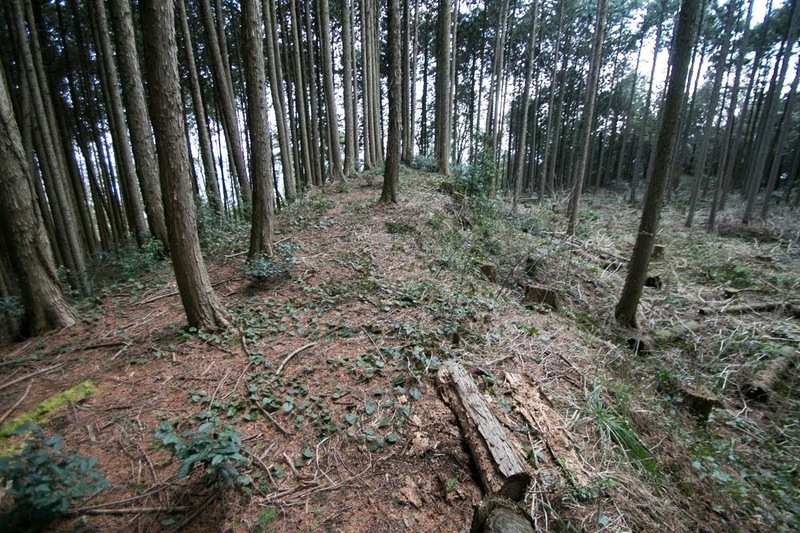 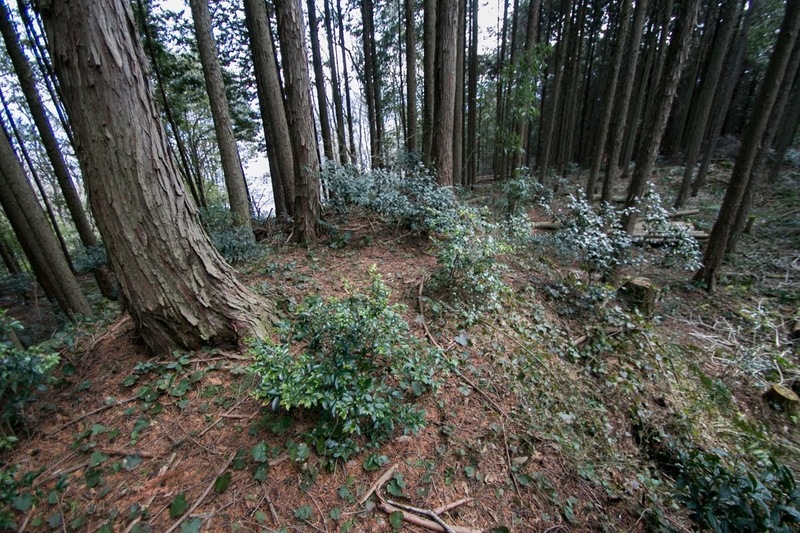 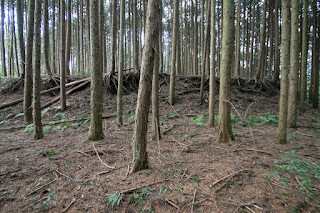 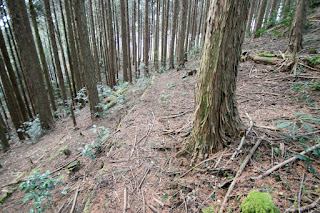 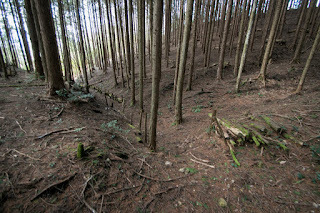 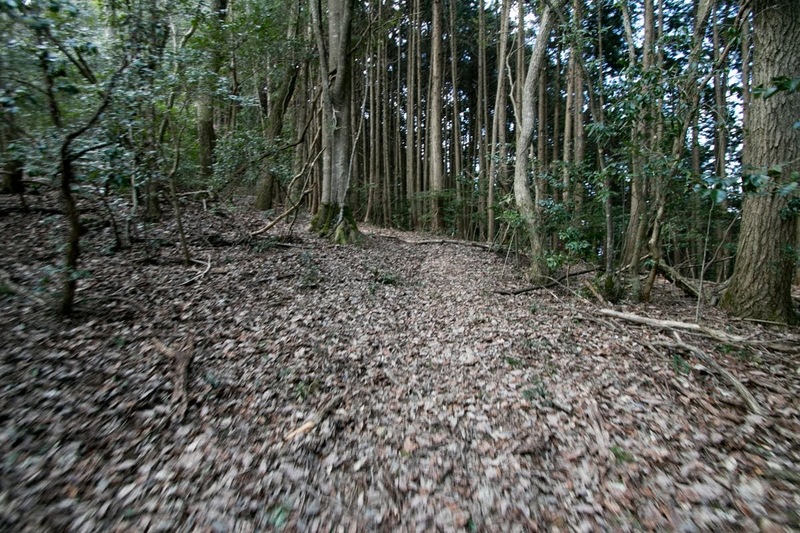 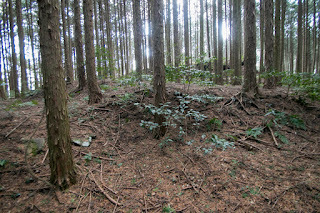 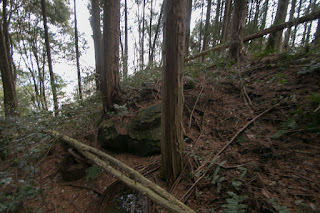 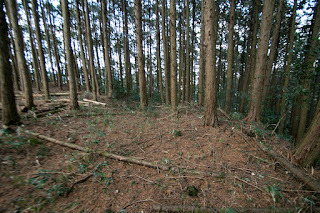 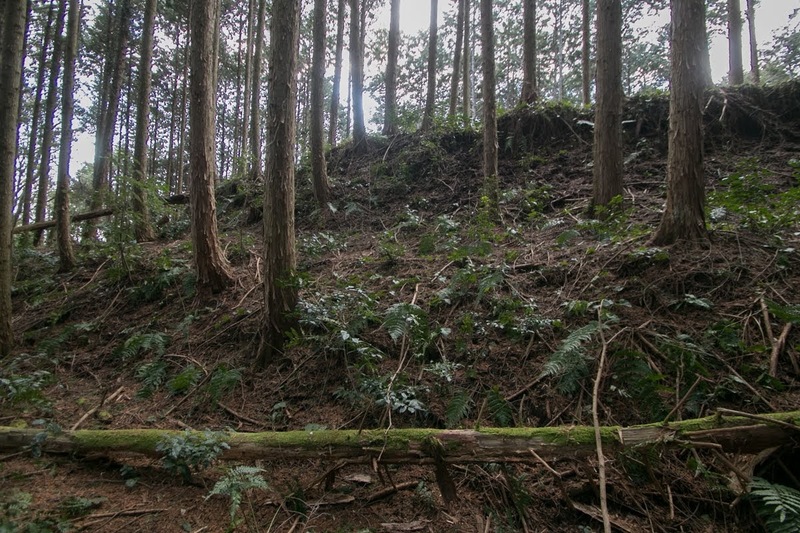 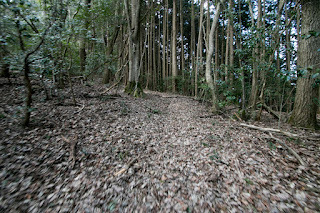 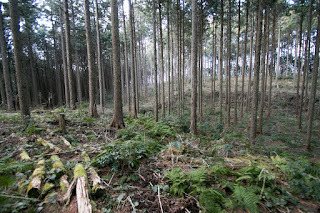 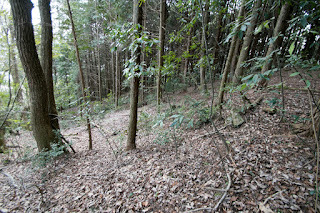 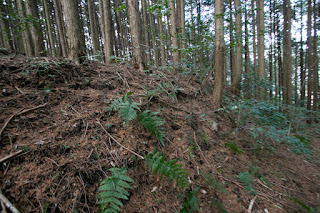 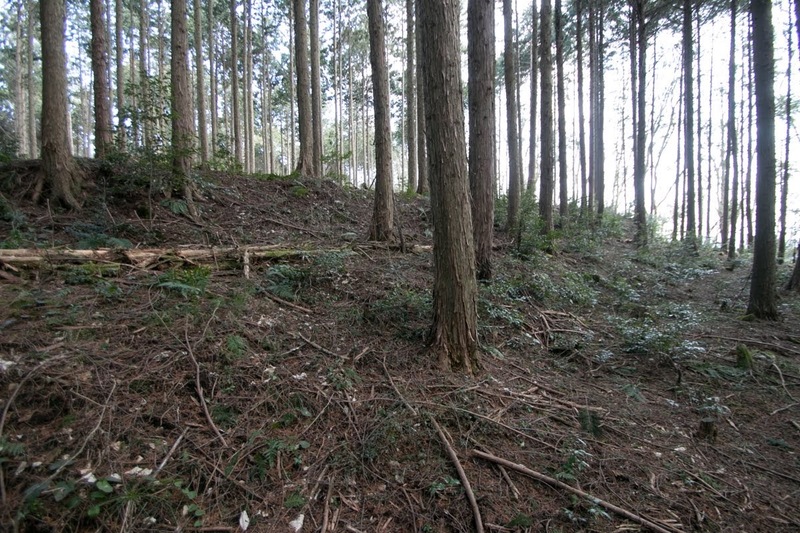 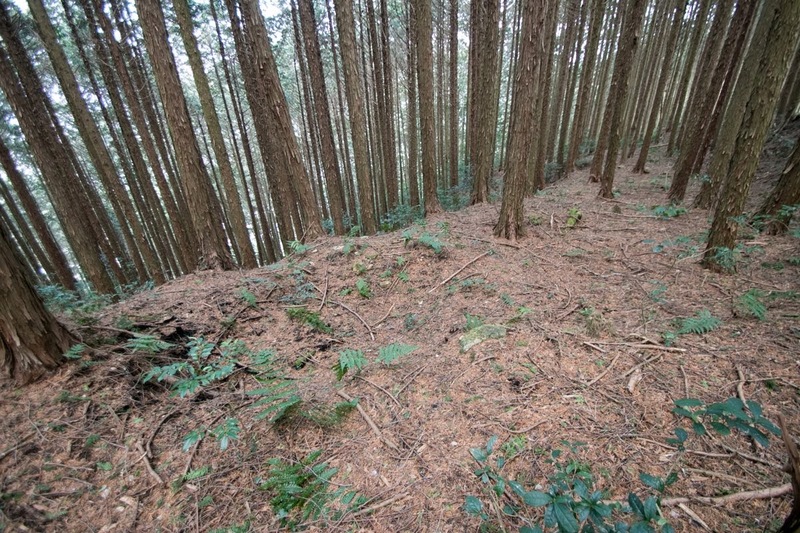 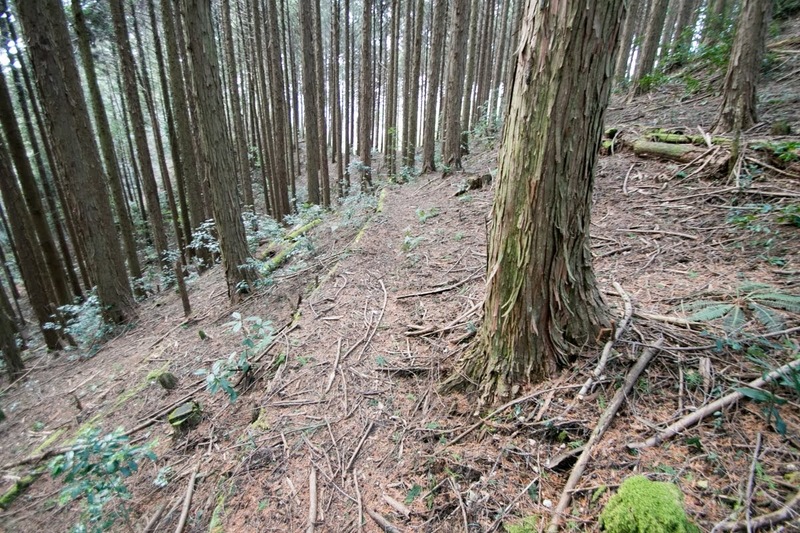 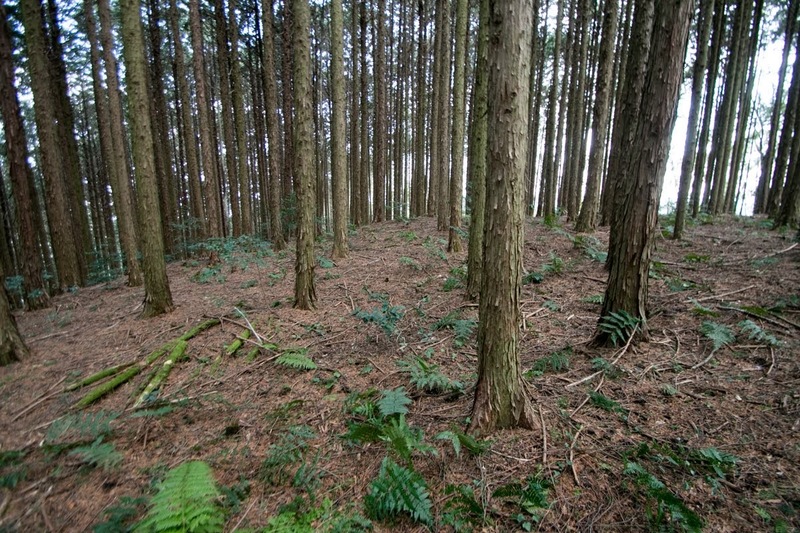 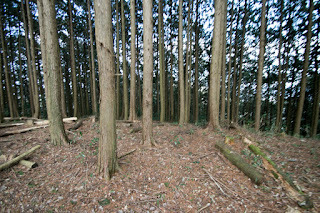 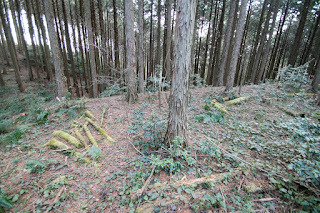 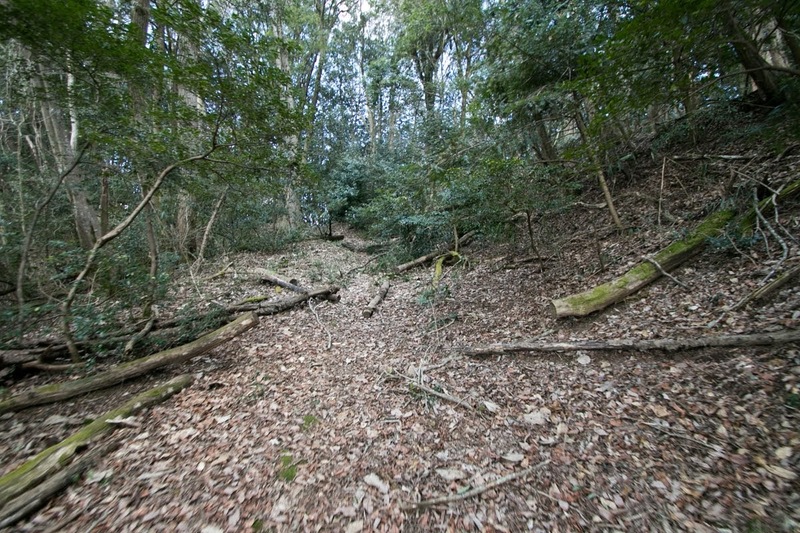 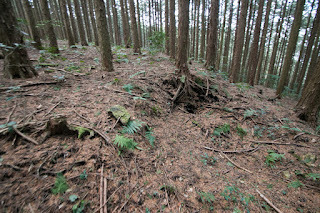 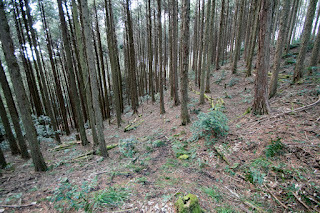 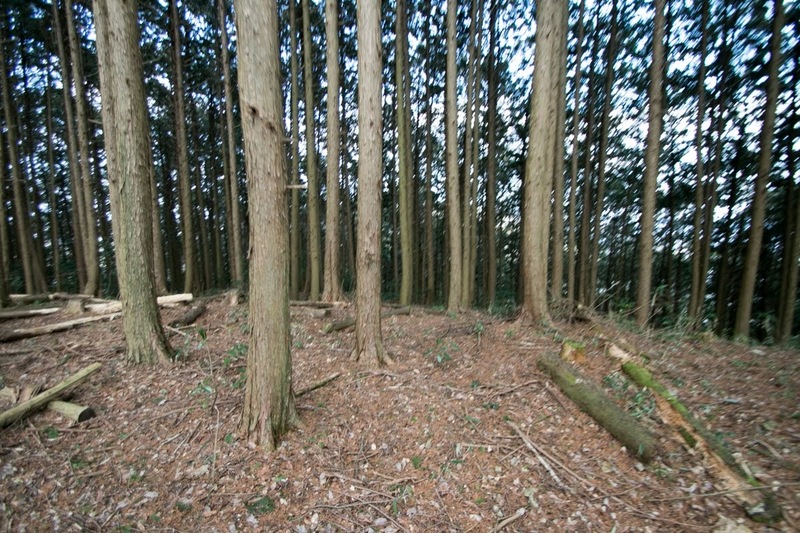 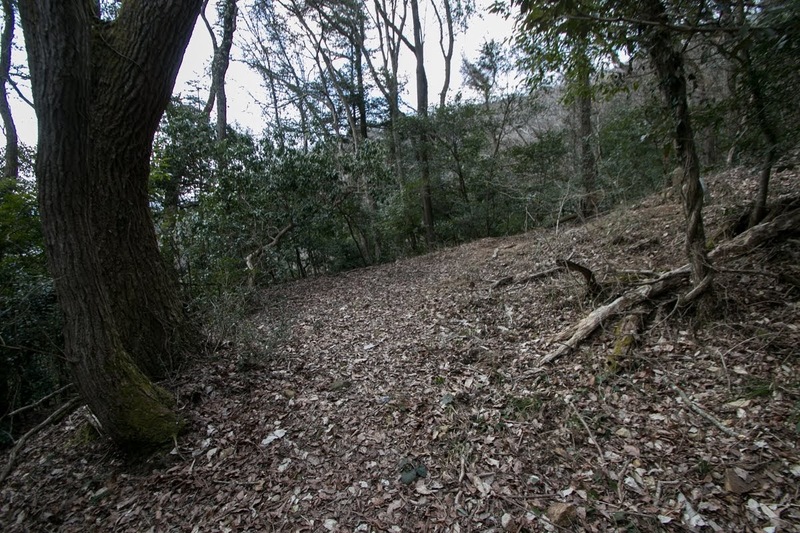 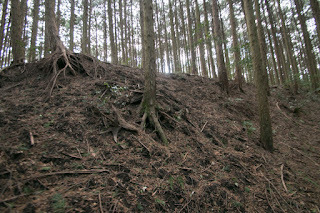 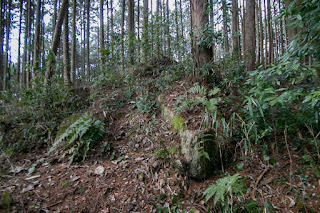 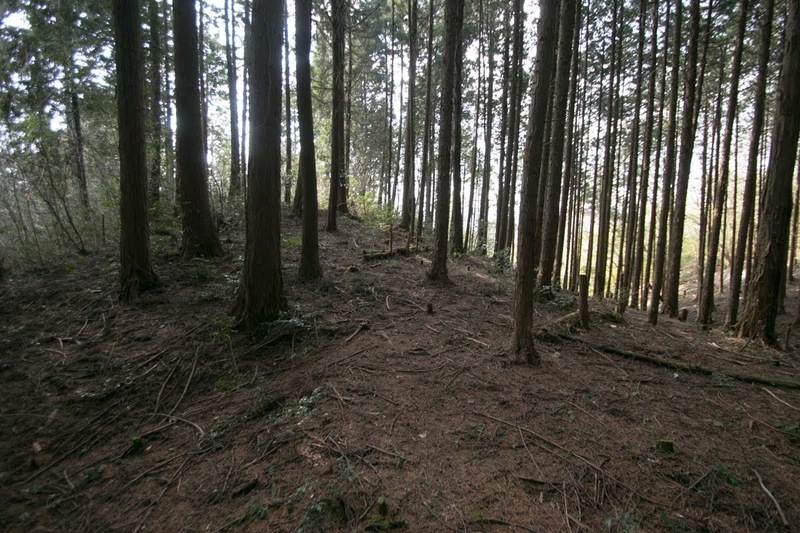 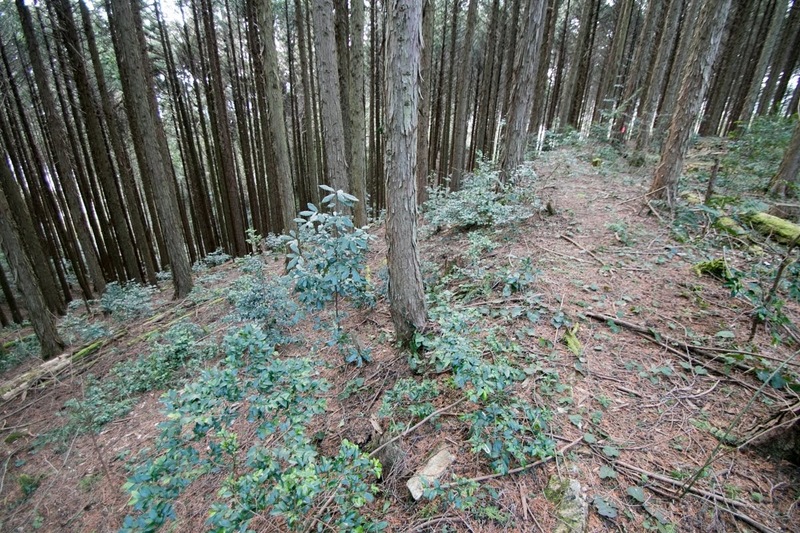 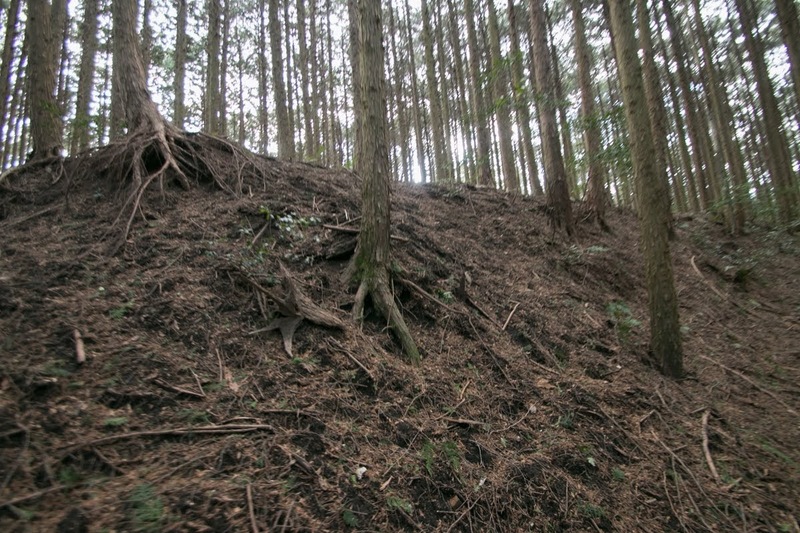 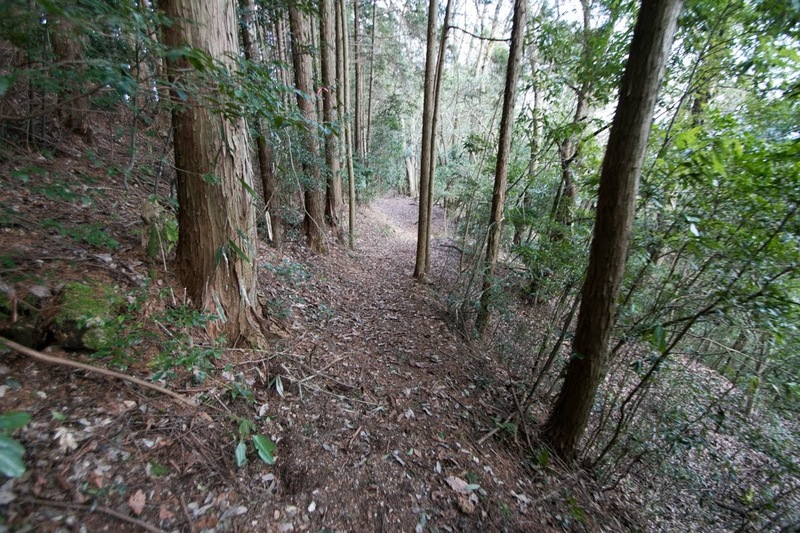 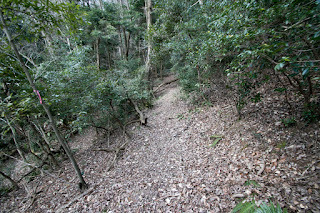 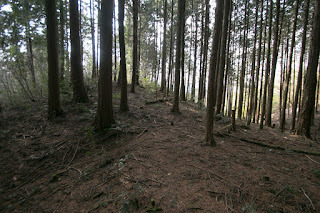 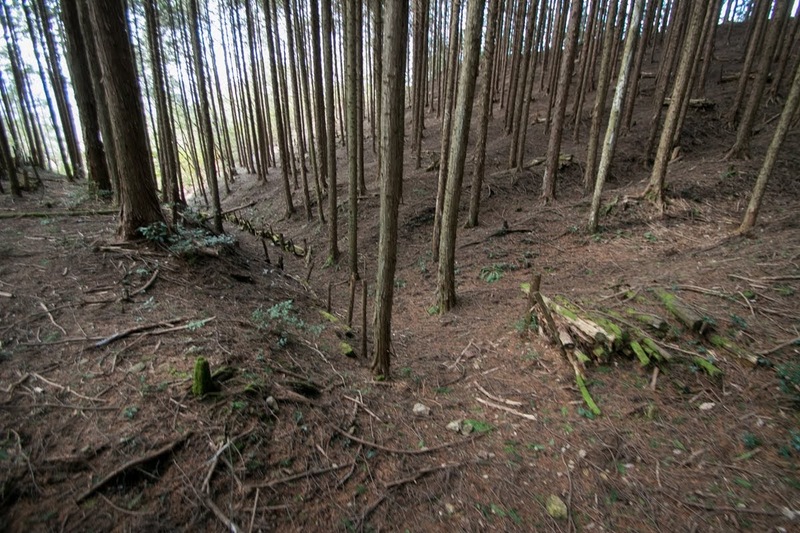 Castle site is a triangle shaped mountain which is formed by Gono-kawa river and its tributary Saijo-gawa river which meets just at the south of the mountain. 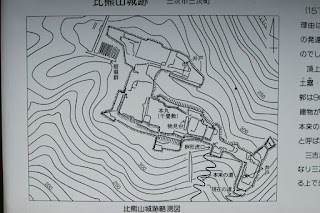 A flat area of about 1,000 meter long and 600 meter width formed by two rivers below of the castle is an ideal place to built castle town with river port, both for defense and transportation. Higumayama castle was built by local lord Miyoshi clan in 1591, originally lived at Hiebiyama castle (Hiroshima prefecture) at five kilometer east from Higumayama castle. 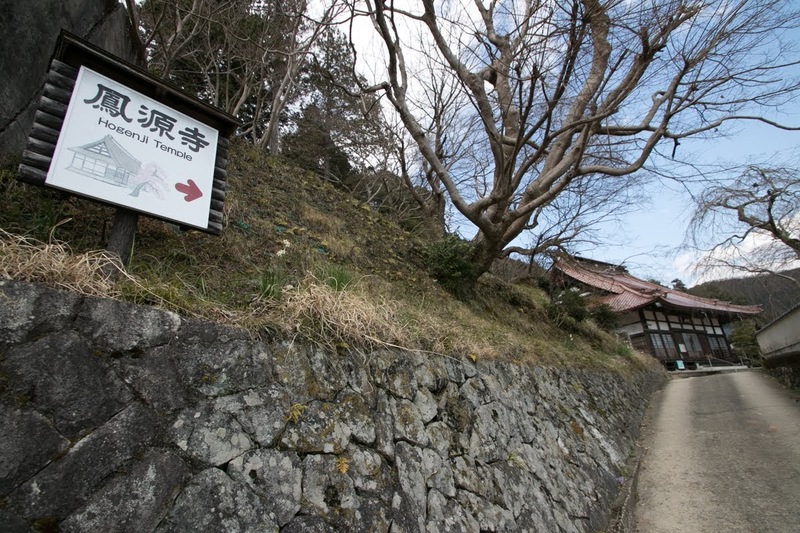 Miyoshi clan is said as a descendant of central noble Fujiwara clan and moved to their manor Miyoshi area in medieval era. 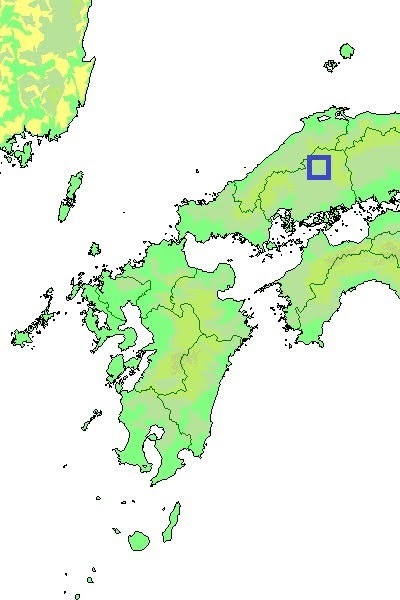 Miyoshi area belonged to Bingo province (east half of Hiroshima prefecture) but apart from its center at coast area, Miyoshi clan grew as an independent local lord. 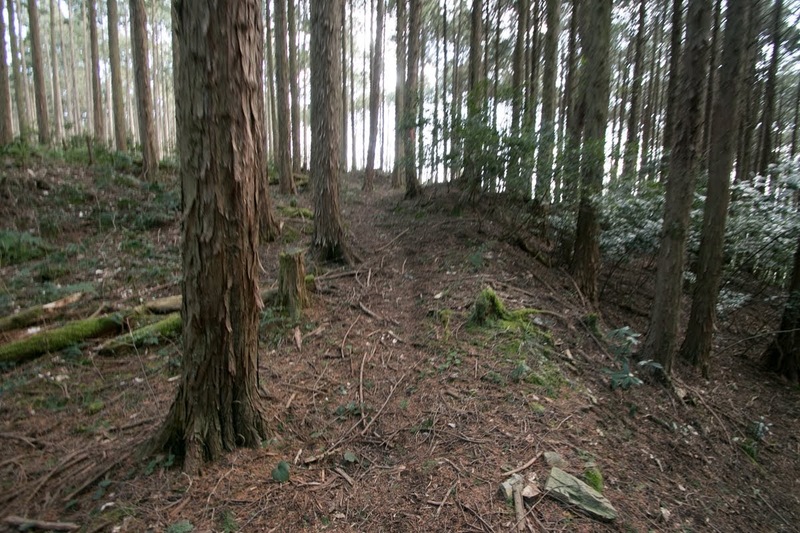 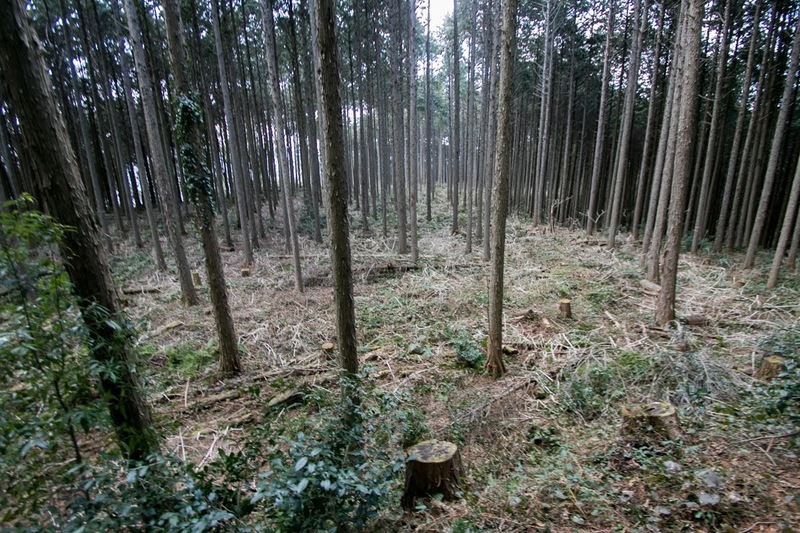 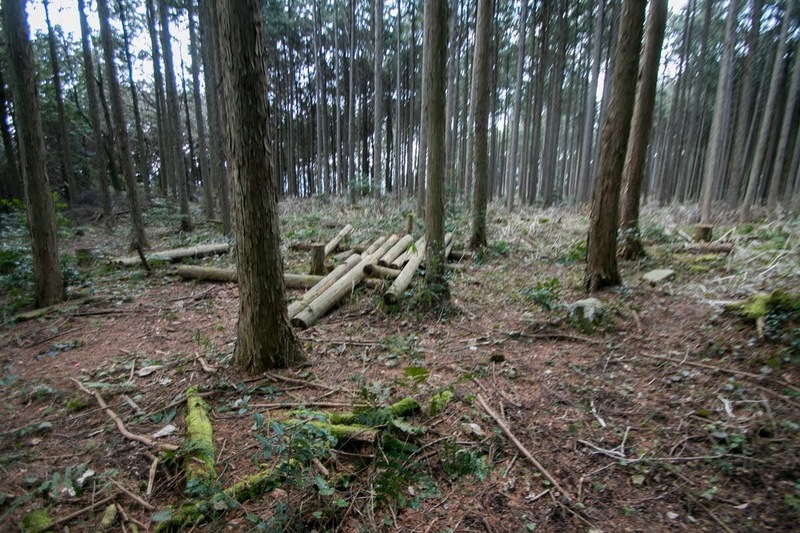 By the end of 15th century, Yamana clan significantly lost their power thus there was no leader for Bingo province. 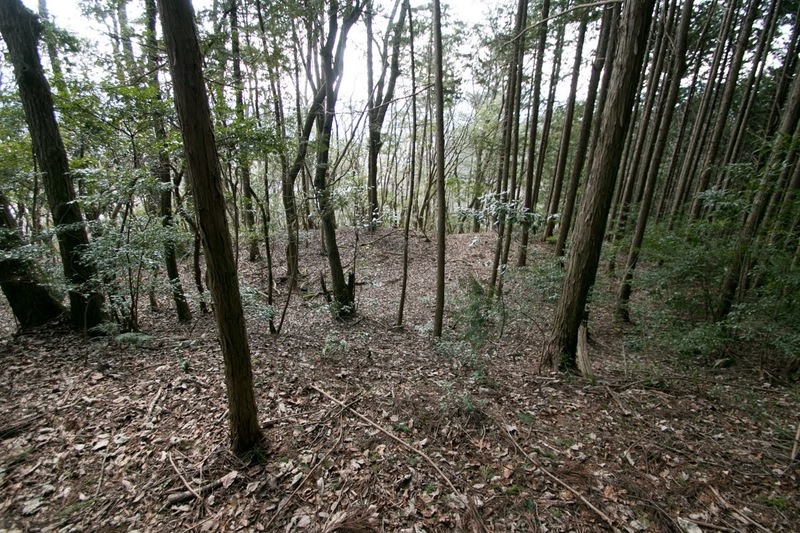 Local lords such as Yamauchi clan, Miya clan or Miyoshi clan separately managed their territory. 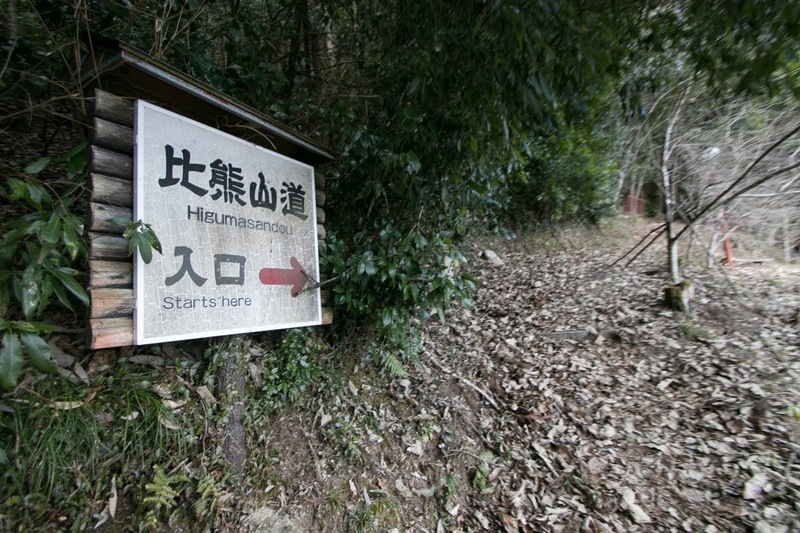 At the same time, Ouchi clan which was the governor of Suo province (Yamaguchi prefecture) and Amago clan, which was the one of Izumo province (eastern half of Shimane prefecture) struggled for the hegemony of Chugoku region. 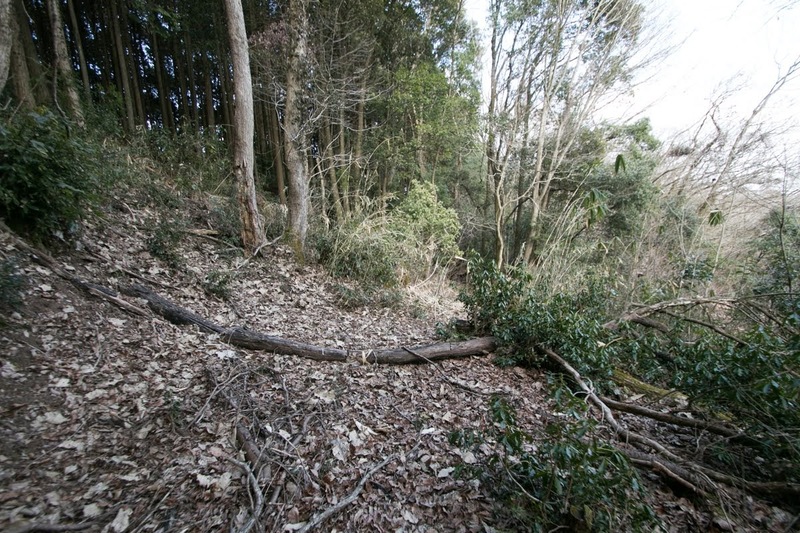 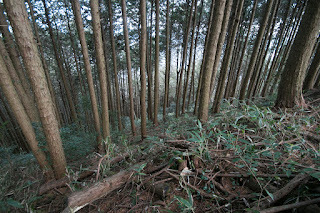 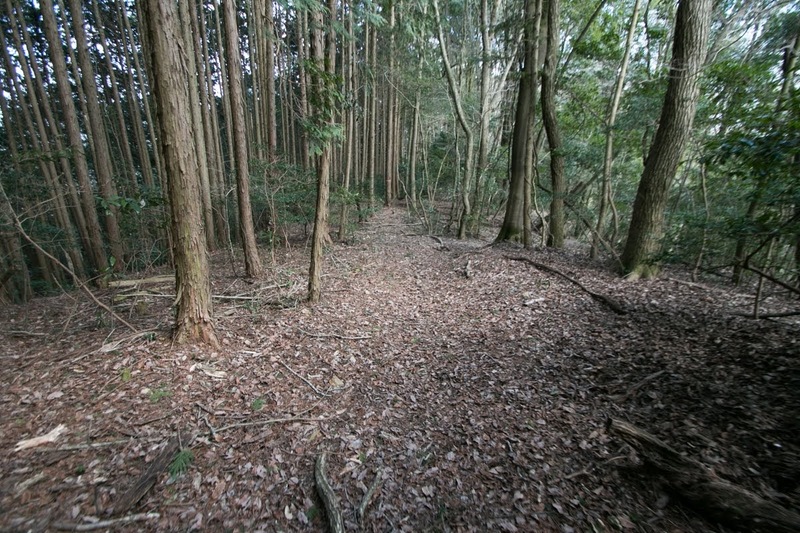 Miyoshi area became the front of Ouchi clan from westward and Amago clan from northward. 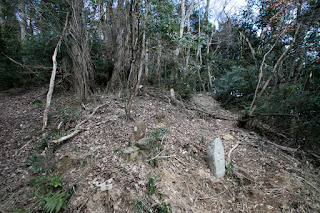 Along with local lords of Aki province (western half of Hiroshima prefecture) also lacked strong leader but managed by cooperation of local lords under Mouri clan, Miyoshi clan moved between Ouchi clan and Amago clan looking at the situation. 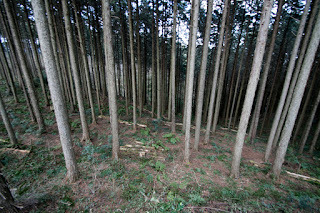 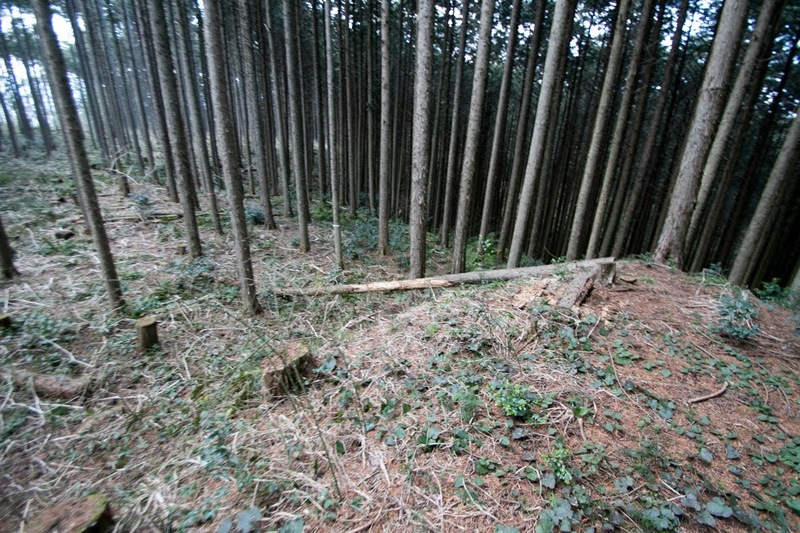 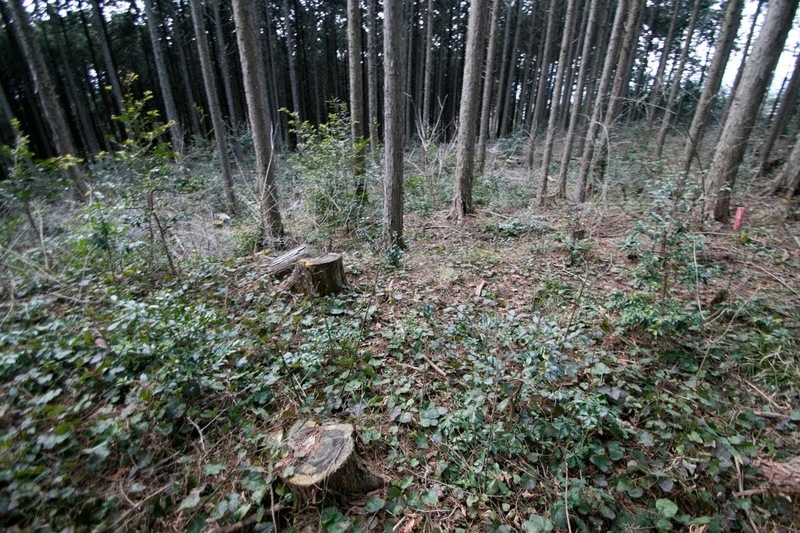 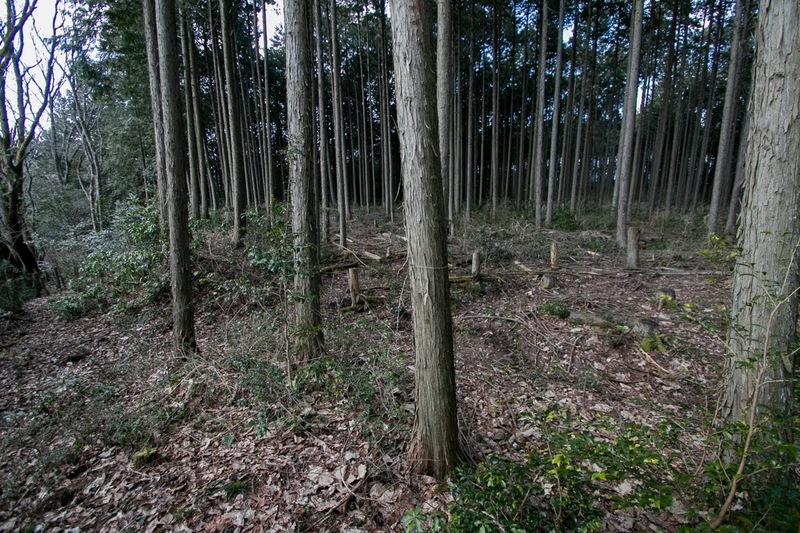 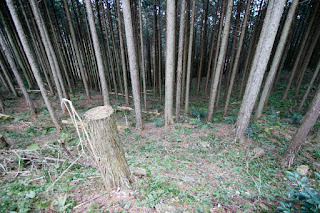 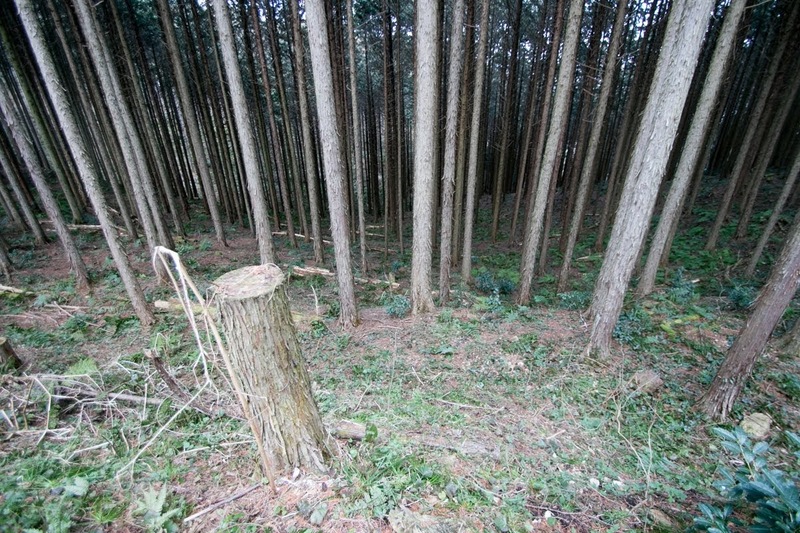 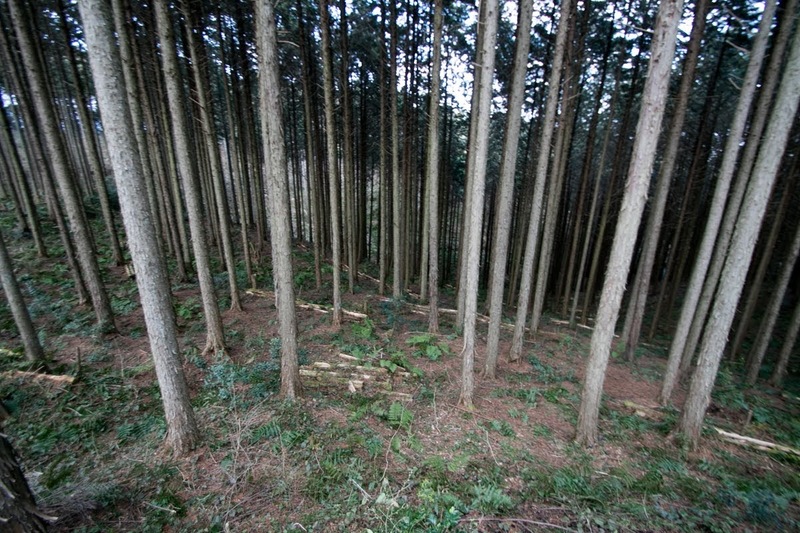 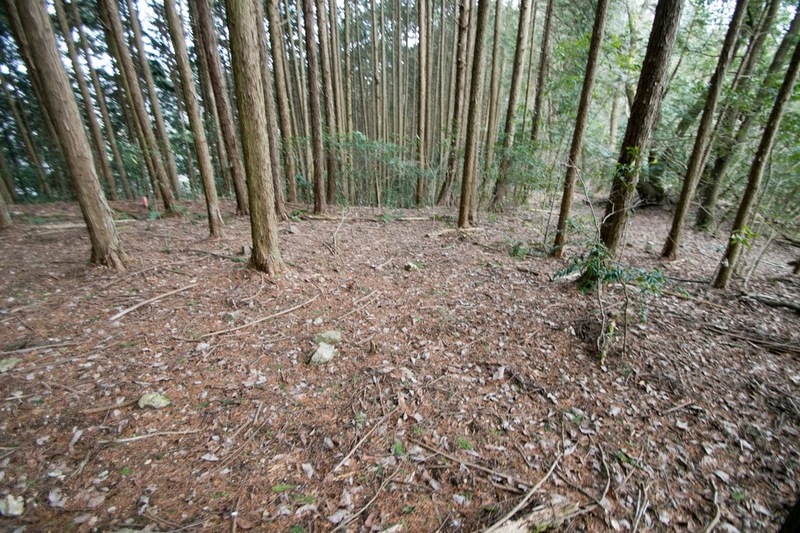 In 1544, Amago clan sent their strong army “Shingu-to” to ruin Miyoshi clan which turned to Ouchi clan. 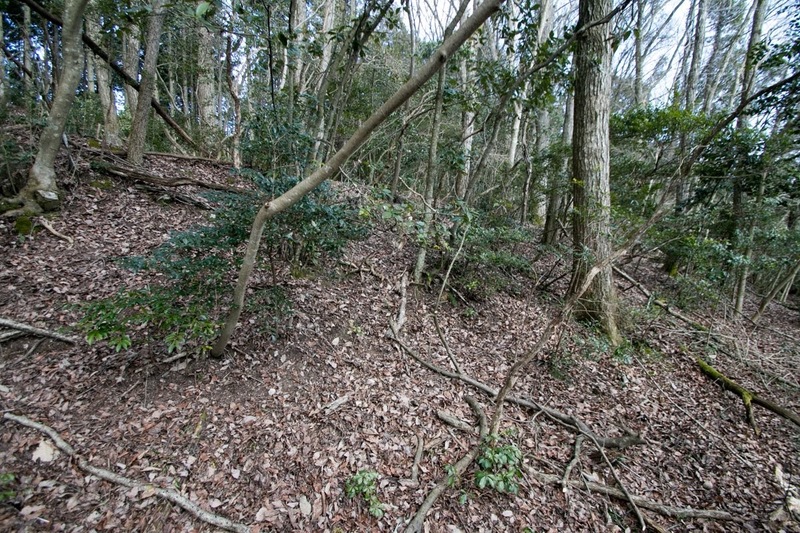 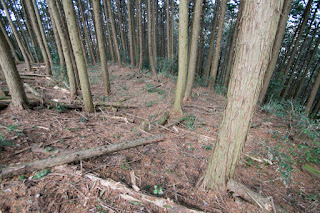 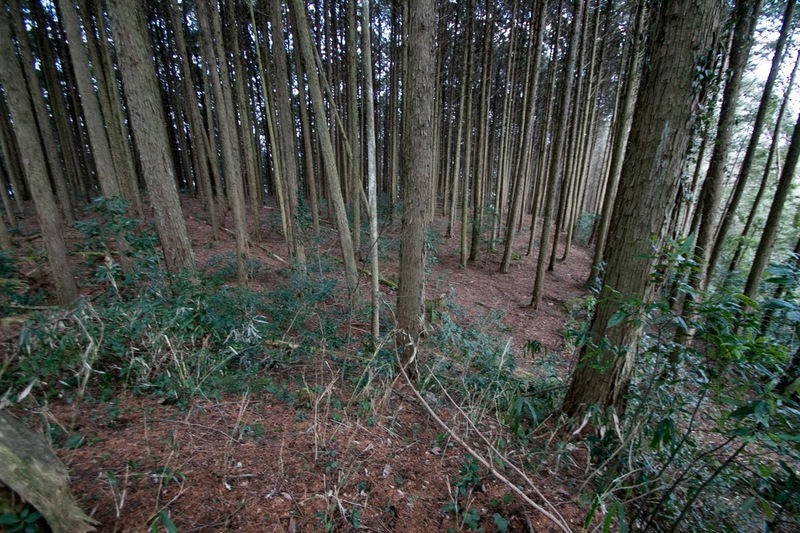 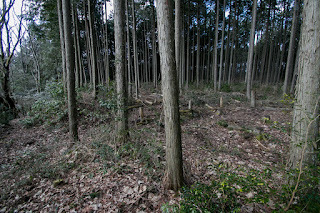 Once Miyoshi clan and its reinforcement army from Mouri clan suffered defeat before Amago army near its main base Hiebiyama castle, but because of sudden attack of Miyoshi army they barely broke Amago army and survived. After that Miyoshi clan became connected to Motonari Mouri (1497-1571), the intelligent leader of Mouri clan. 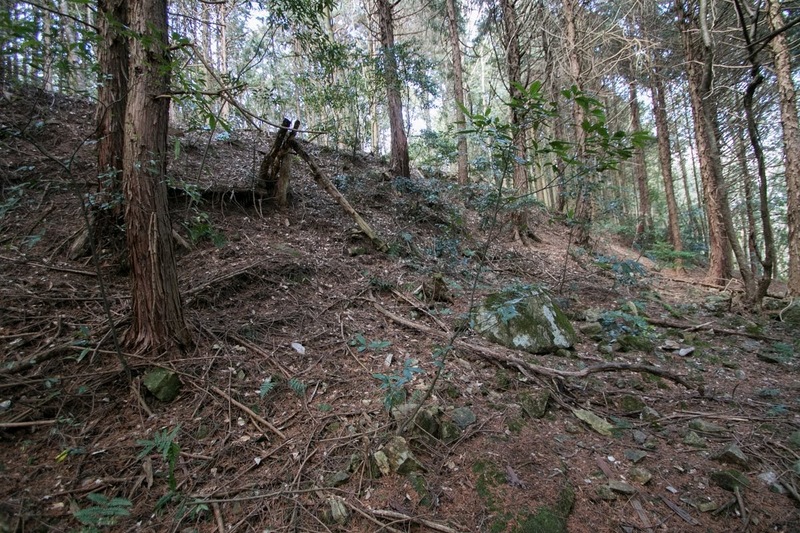 Mouri clan overcame Ouchi clan which was virtually ruined by a coup d’?tat by its deputy governor Harukata Sue (1521-1555), then broke Amago clan and occupied its main base Gassan Toda castle (Shimane prefecture) in 1566 after two year battle. 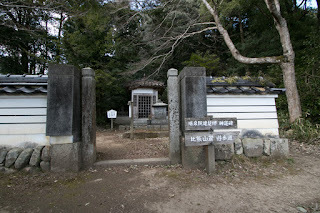 Motonari died in ill in 1571, but under Terumoto Mouri (1553-1625), the grandson of Motonari who was supported by his brilliant two uncles Motoharu Kikkawa (1530-1588) and Takakage Kobayakawa (1533-1597), Mouri clan expanded their territory eastward and once captured most part of Chugoku region. Miyoshi clan was treated as close retainer of Mouri clan and prospered at Hiebiyama castle. 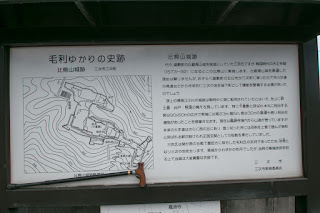 But in the middle of 1570’s, Mouri clan which reached to the western border of Harima province (western part of Hyogo prefecture) started conflict against central ruler Nobunaga Oda (1534-1582). 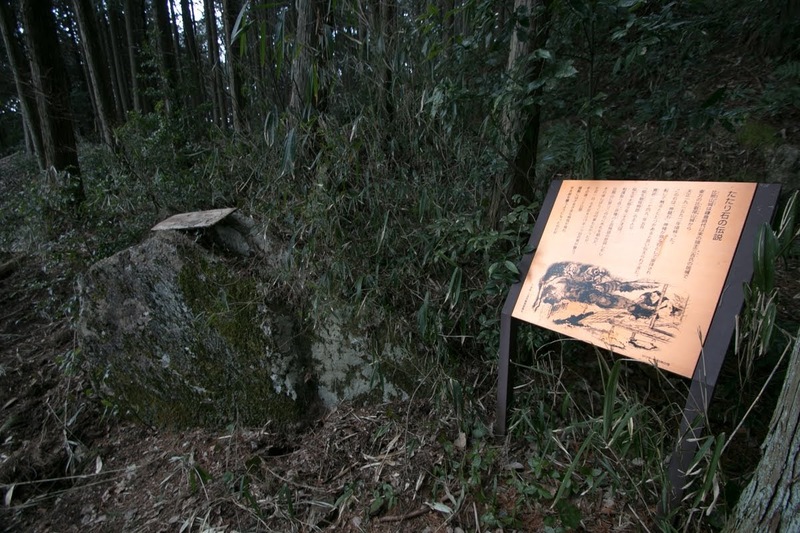 At first Mouri clan supported opponent of Nobunaga such as Honganji temple or Miki clan and was once superior to Oda army in Harima province. 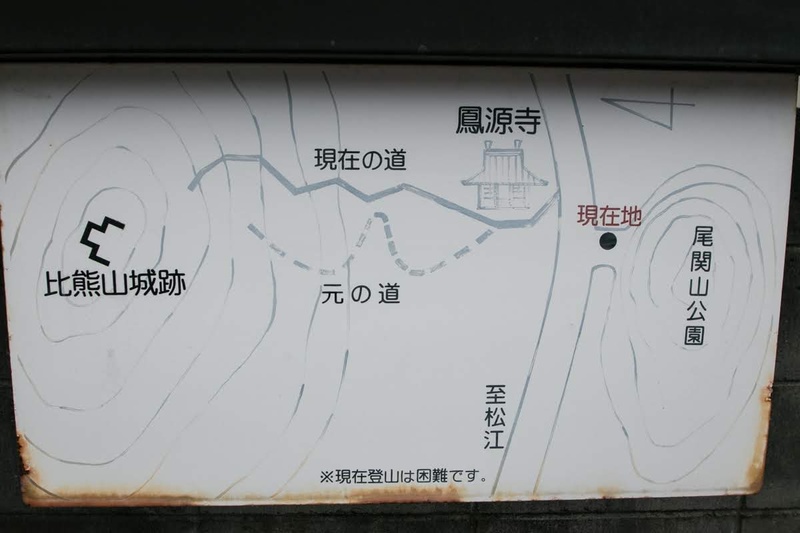 But Oda clan which fixed its eastern border by decline of Takeda clan and death of its rival Kenshin Uesugi (1530-1578) could focus on its border toward Mouri clan. 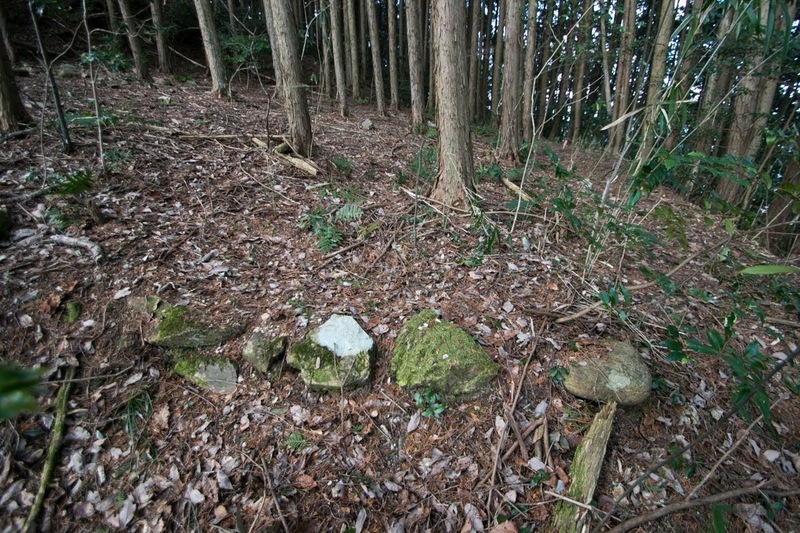 Oda army individually broke the supporter of Mouri clan, and also Mouri navy at the naval battle of Kizu-gawa. Hideyoshi Hashiba (1537-1598, later Hideyoshi Toyotomi) who was the regional commander of Nobunaga reversed situation after tough battle and started counter attack toward Mouri clan. 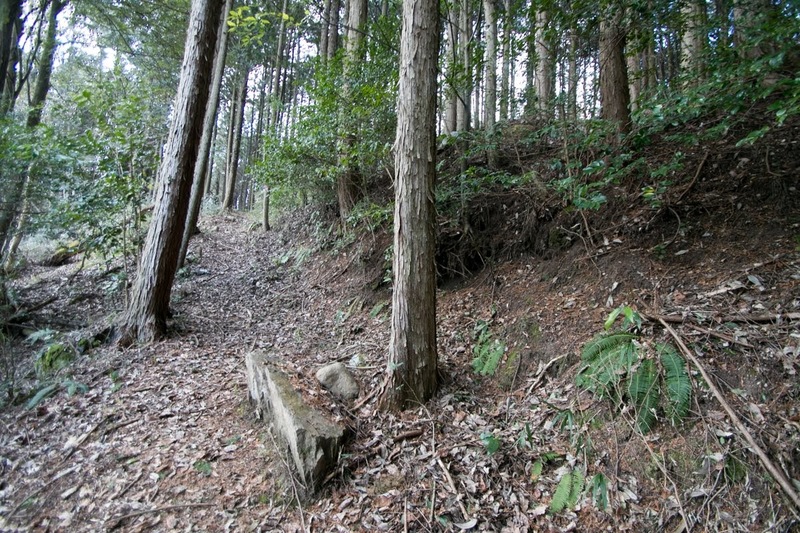 In 1581, Hideyoshi turned Ukita clan and Nanjo clan which protected the frontline of Mouri clan thus captured Tottori castle, an important castle at eastern part of Sanin region. 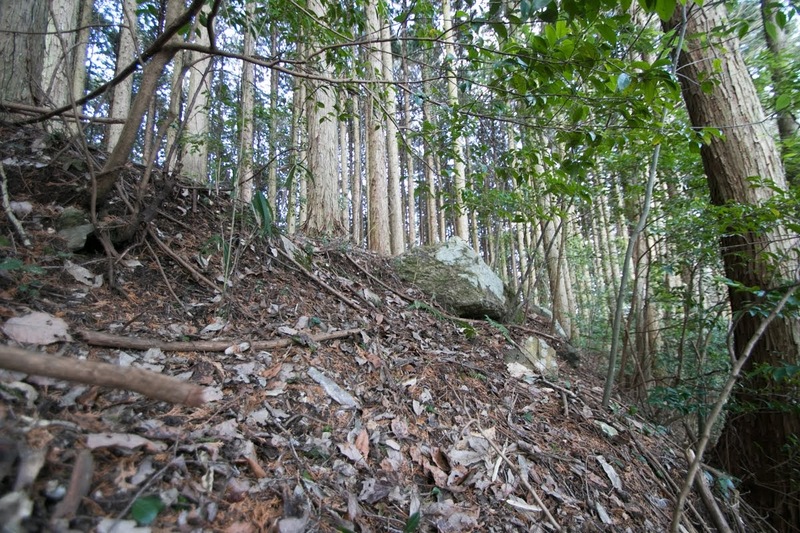 Hideyoshi built a front line both at Sanyo region and Sanin region pushed it toward west. 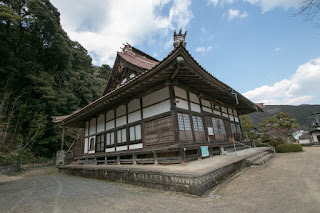 In 1582, Hideyoshi intruded into Bicchu province (western part of Okayama prefecture), just the east of Bingo province which was eastern border of core area of Mouri clan. 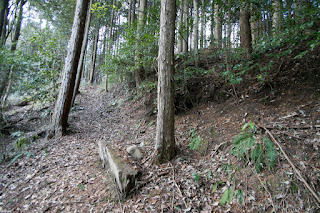 Hideyoshi made flood attack to Bicchu Takamatsu castle (Okayama prefecture), thus Mouri clan sent their all force as reinforcement army but could not save castle. 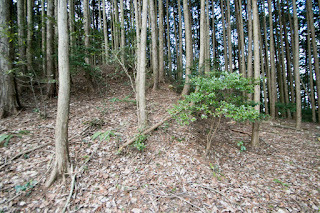 Looking at this situation Nobunaga decided to march to Bicchu province to make decisive battle, and Mouri clan was forced to the corner. 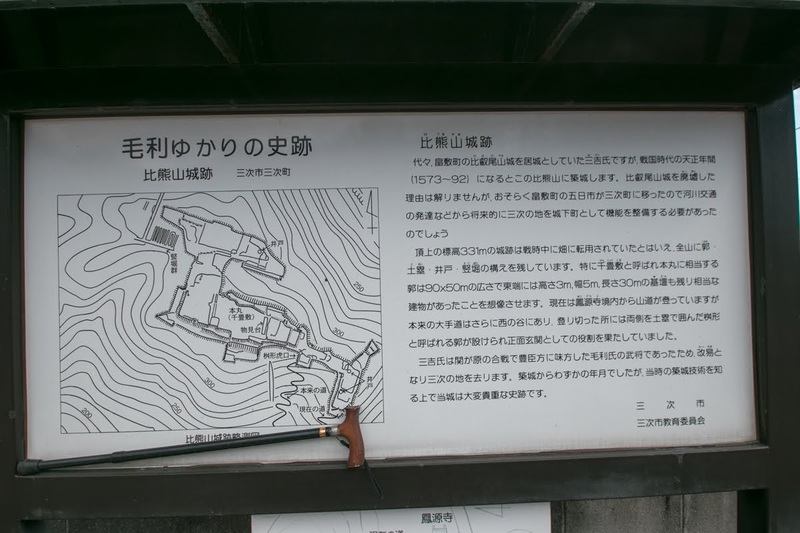 But on the way of his expedition, Nobunaga died in the incident of Honnoji, a coup d’?tat by his general Mitsuhide Akechi (1521-1582). 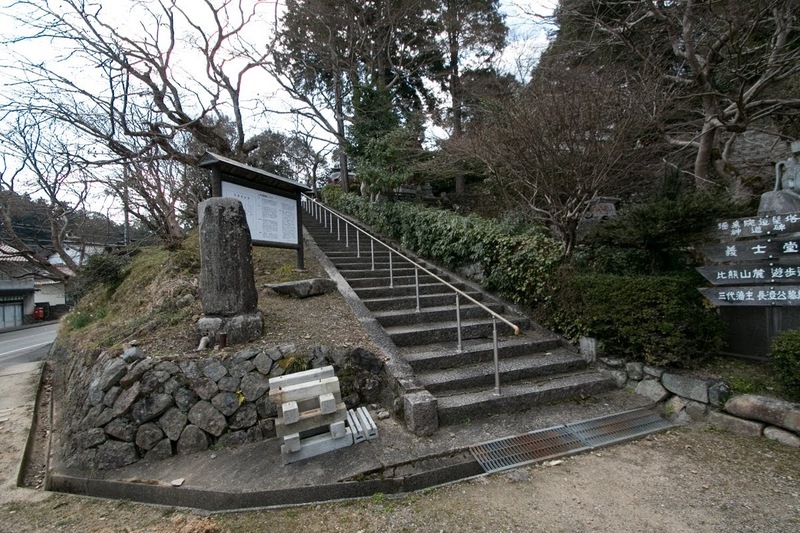 Knowing the loss of his master, Hideyoshi quickly agreed with Mouri clan and returned his force to Kyoto city, then broke Mitsuhide Akechi at the battle of Yamazaki and became the next ruler. 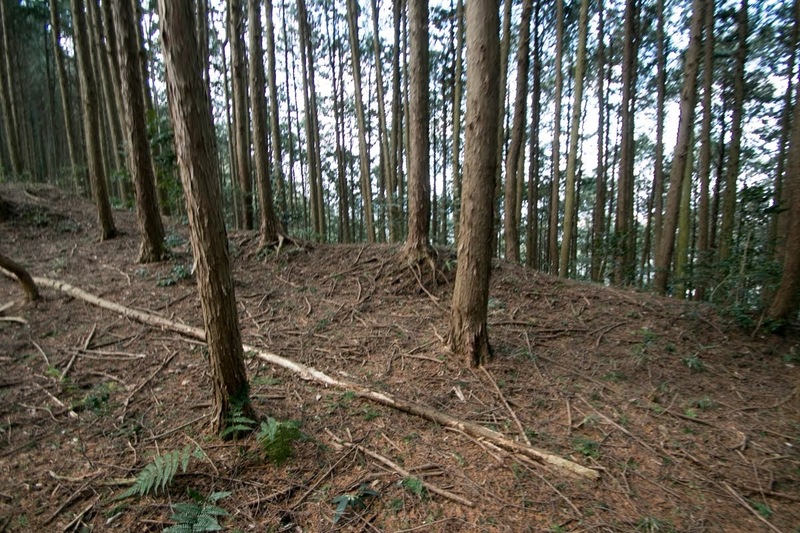 As Mouri clan did not chase Hideyoshi at this time and cooperated, Hideyoshi treated Mouri clan as a major retainer of his government. 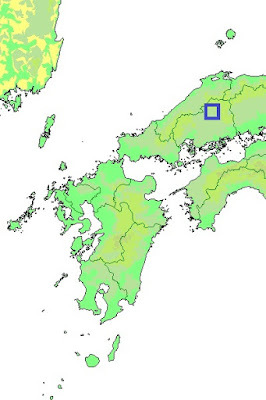 Loosing large area from its peak, but Mouri clan still held western half of Chugoku region and additional territory at Shikoku island or Kyushu island, and became the leader in western Japan. 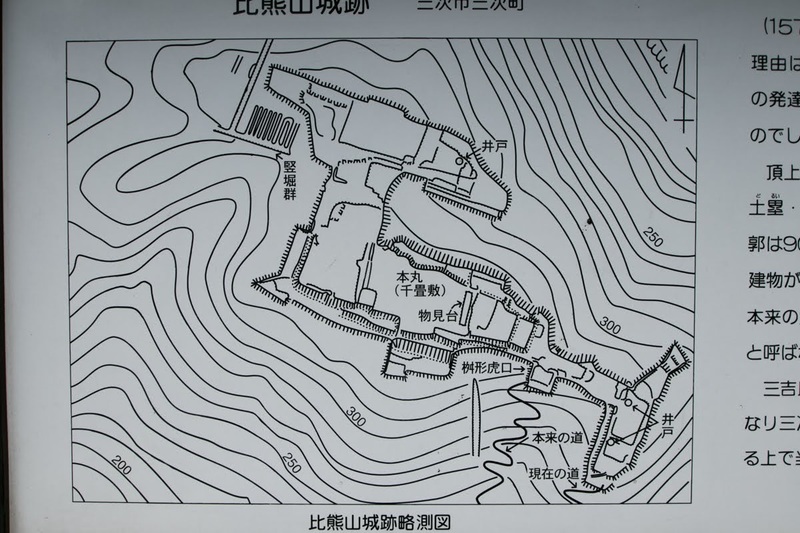 Under the stabilization of situation, Mouri clan started centralization and optimization of territory by abolishing small castles and building or reforming major castles. As Mouri clan lost eastern territories such as Bicchu province or Mimasaka province (north part of Okayama prefecture), Miyoshi area exactly became the center of the territory. 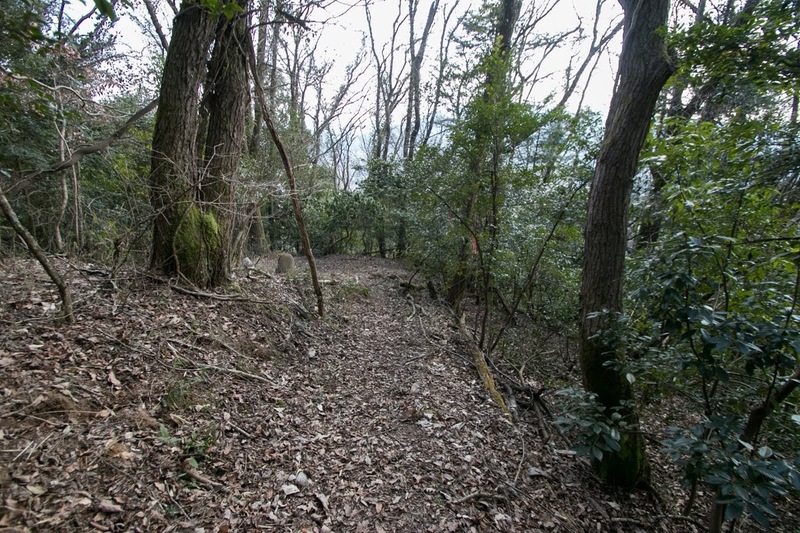 Mouri clan moved its main base from Yoshida Koriyama castle (Hiroshima prefecture) near Miyoshi area to Hiroshima castle (Hiroshima prefecture) at coast side, the necessity of protection of Miyoshi basin had increased. 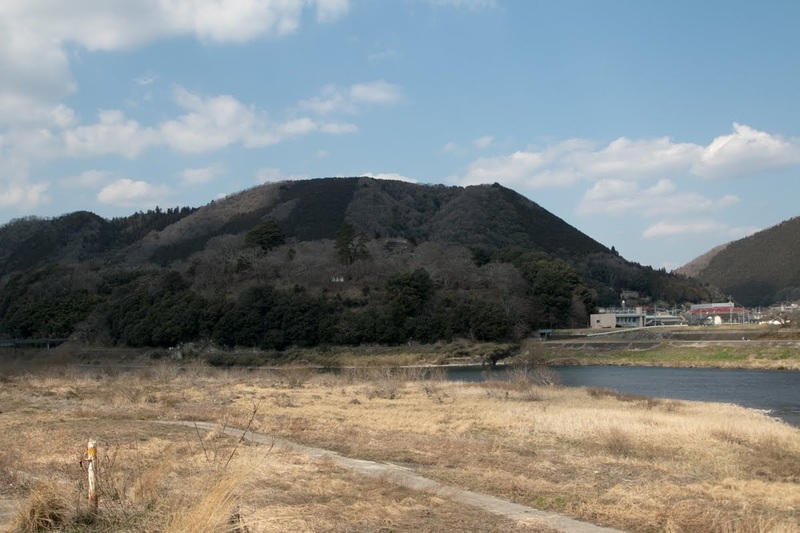 There was no enemy around Miyoshi basin but it was a vital point for Mouri clan both for military and commerce. 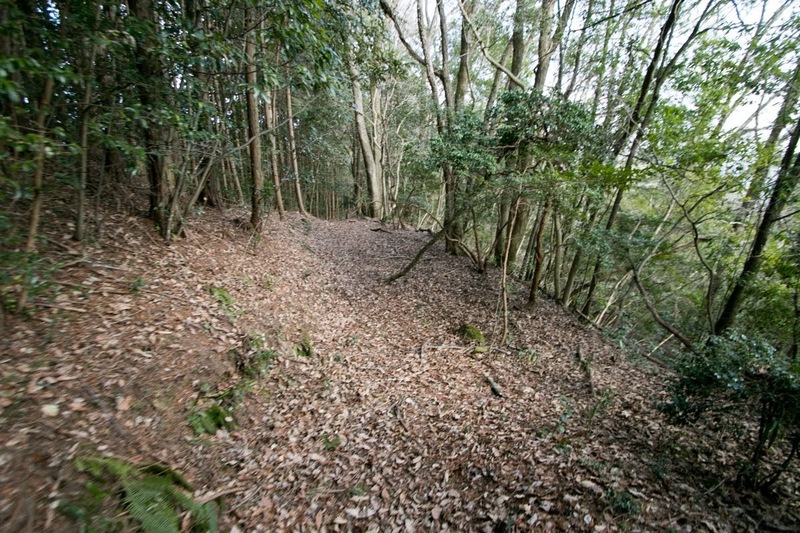 Under the order of Mouri clan, in 1591 Miyoshi clan built Higumayama castle and moved its main base from former base Hiebiyama castle. 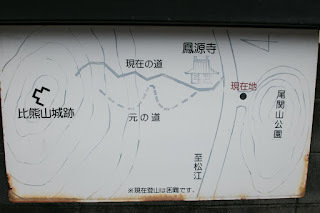 Comparing with Hiebiyama castle at inland area, Higumayama castle was just at the next of meeting point of Gono-kawa river, Saijo-gawa river and Masen-gawa river. 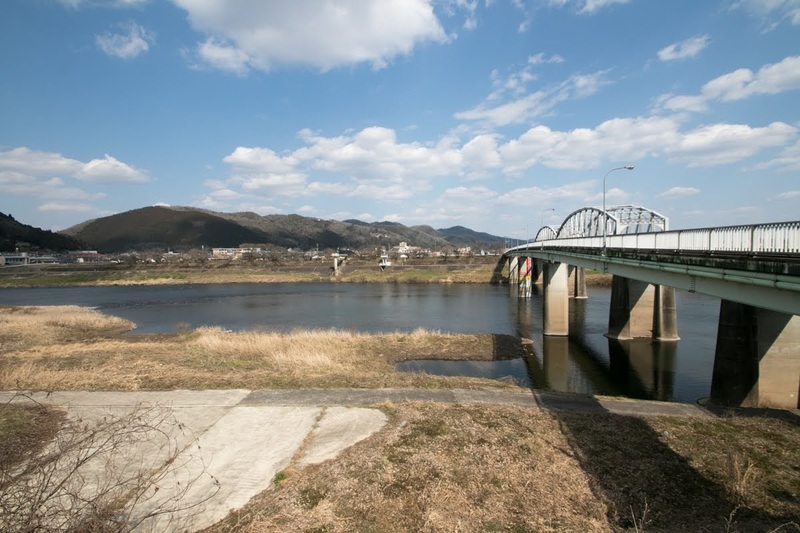 The upstream of Gono-kawa river is a road from Hiroshima bay and Seto-naikai area, and downstream was a path to Iwami province (western part of Shimane prefecture). Masen-gawa river is connected to the road from Mihara area or Onomichi area, and Saijo-gawa river was a path toward Izumo province and Mimasaka province. At Miyoshi basin, managing rivers also meant managing roads. 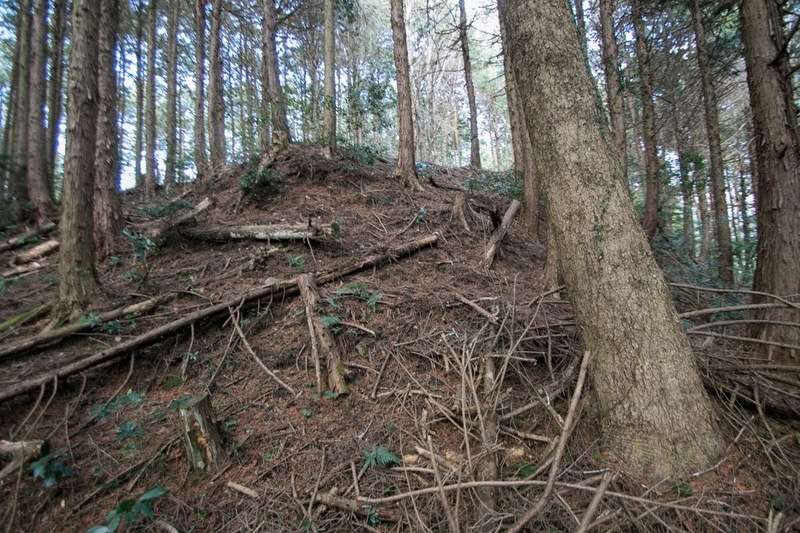 Basic structure of Higumayama castle resembles to Hiebiyama mountain, as the shape of mountain is similar. 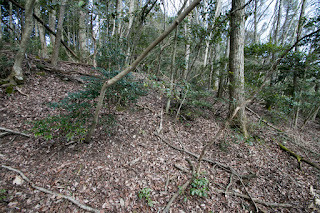 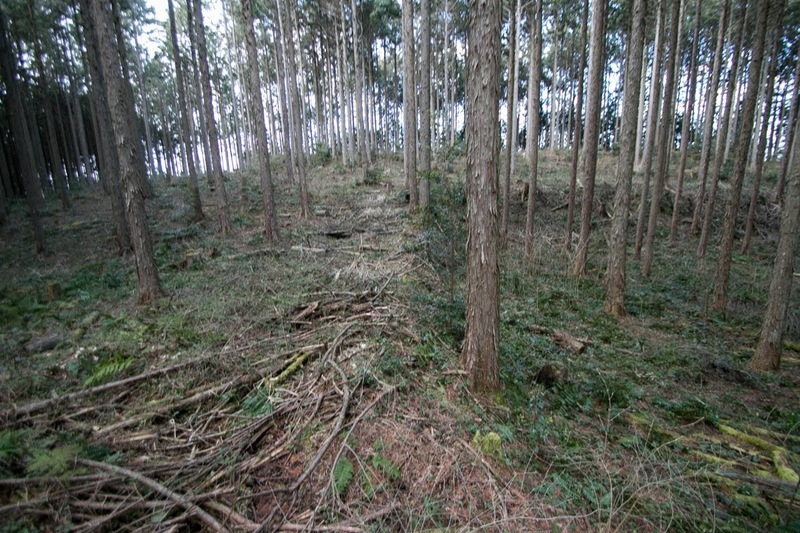 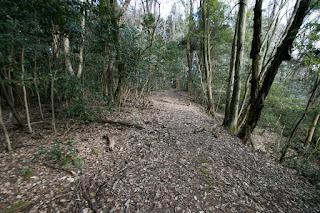 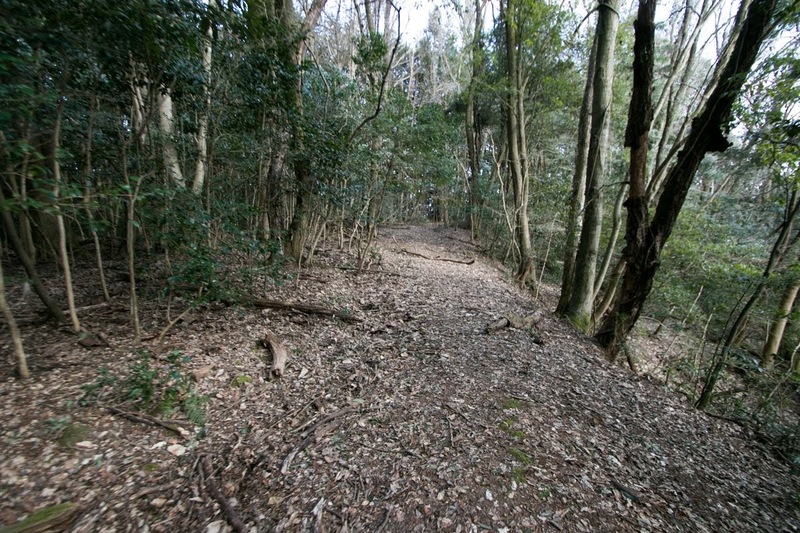 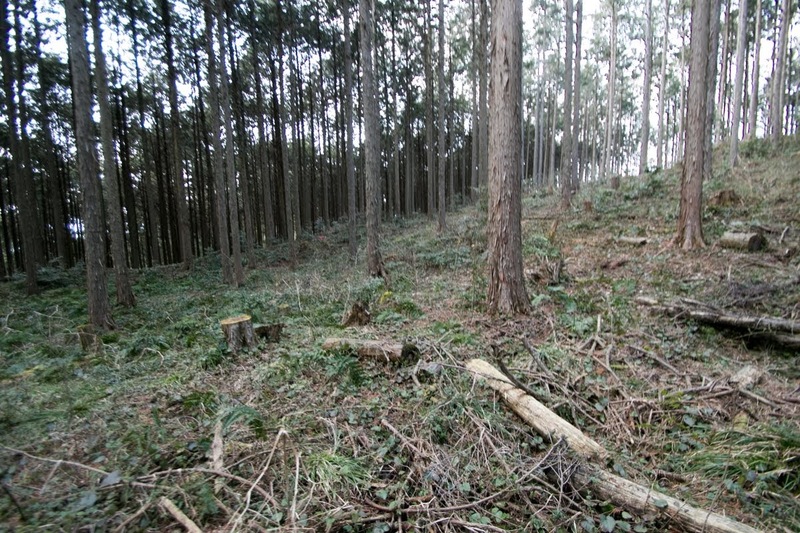 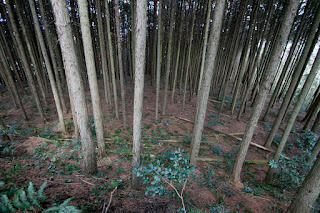 But as hilltop area of Higumayama mountain is flat compared to Hiebiyama mountain, Higumayama castle equip larger and technical defense facility compared to Hiebiyama castle. Central area of the castle is a rectangular terrace of about 90 meter long and 50 meter wide, which has clay wall at its front side and backside with basement of main tower at its southwestern corner. 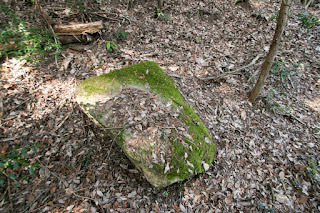 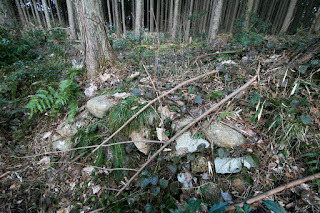 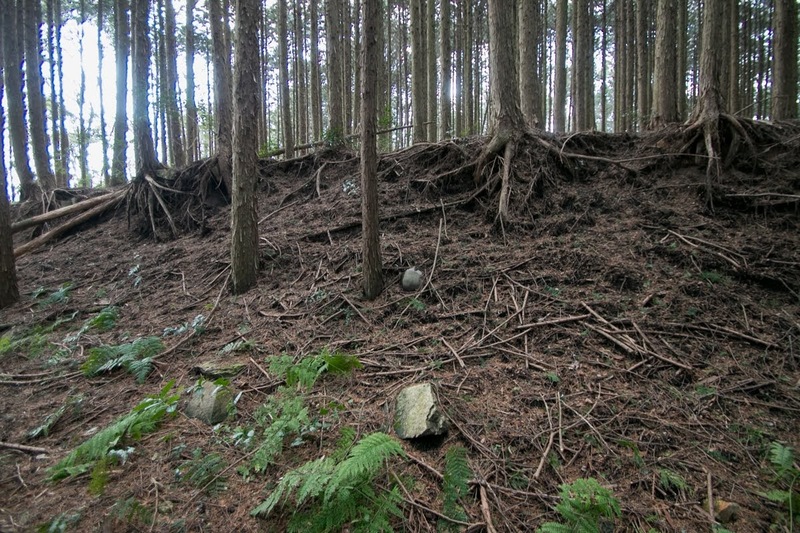 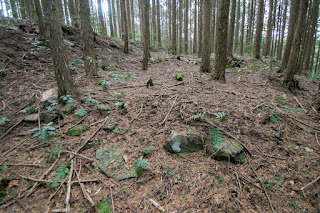 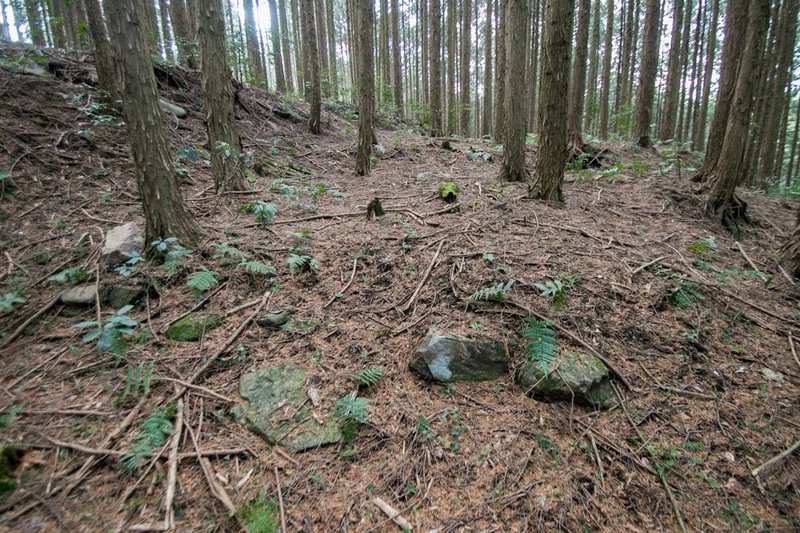 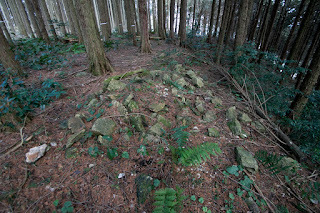 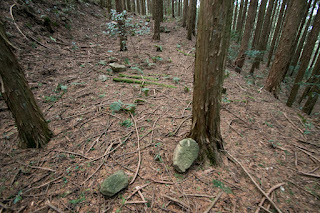 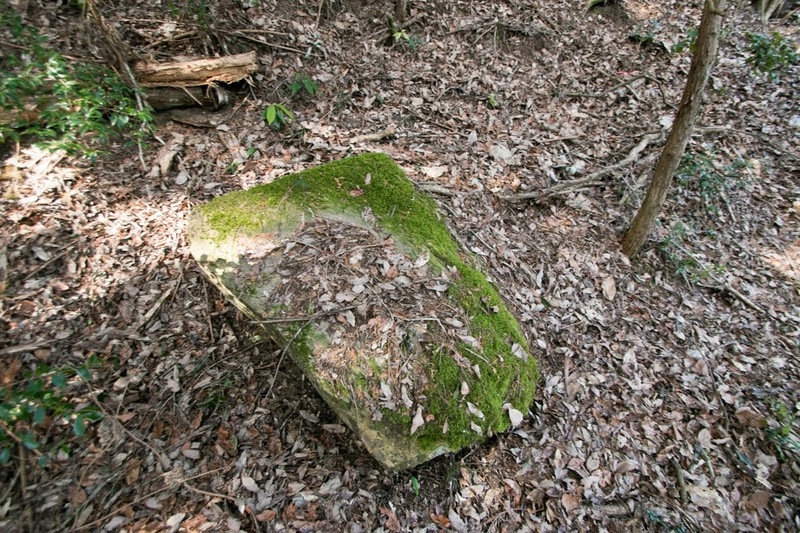 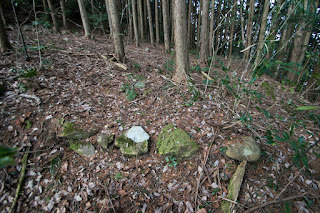 There remain stones on clay walls and formerly it might be wholly covered by stone walls. 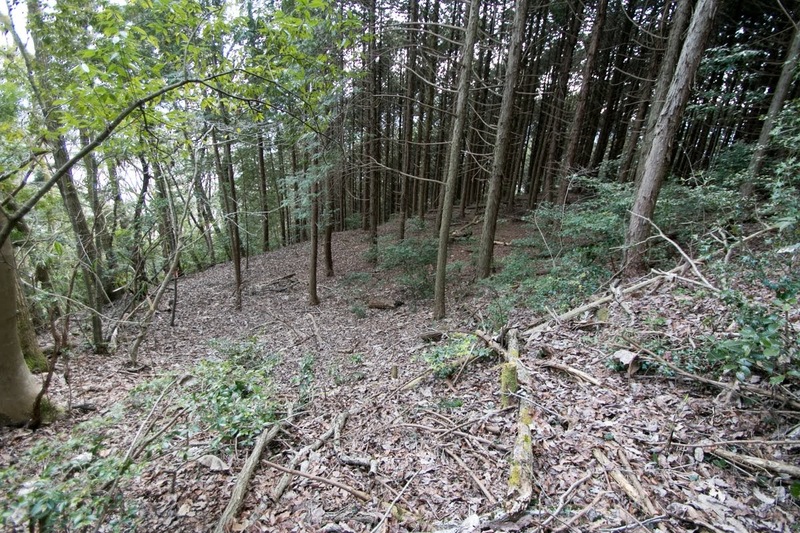 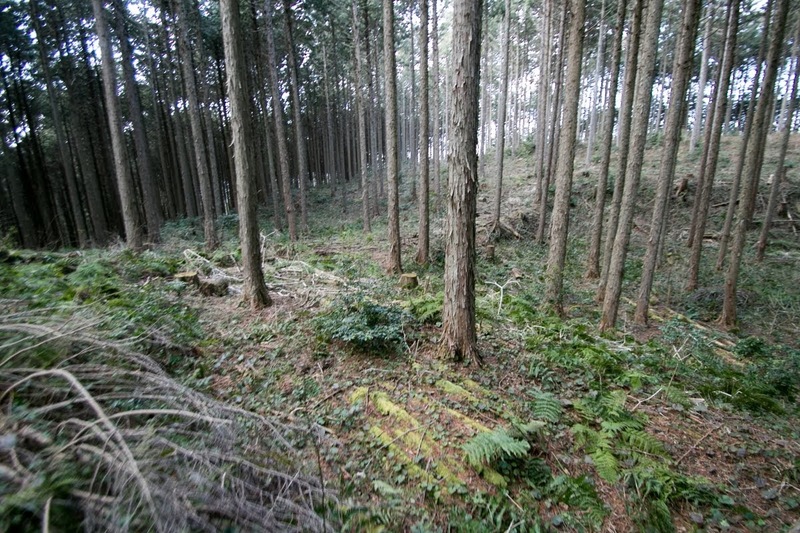 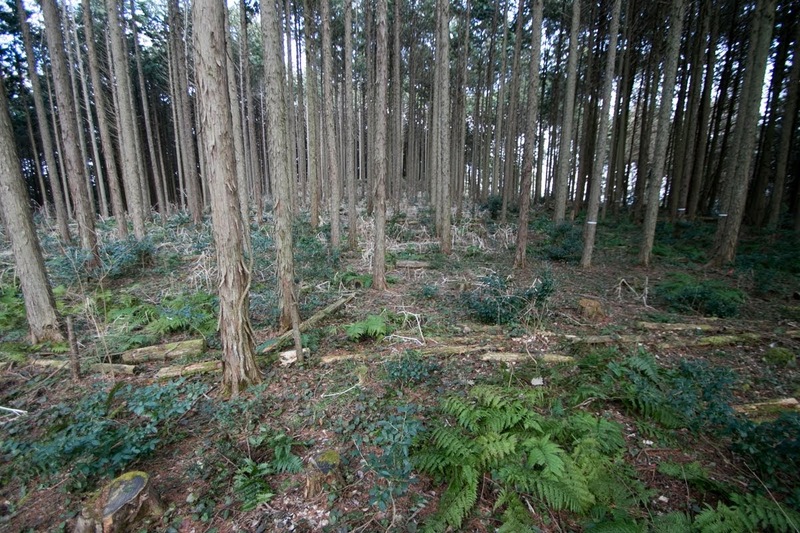 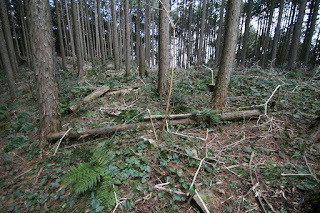 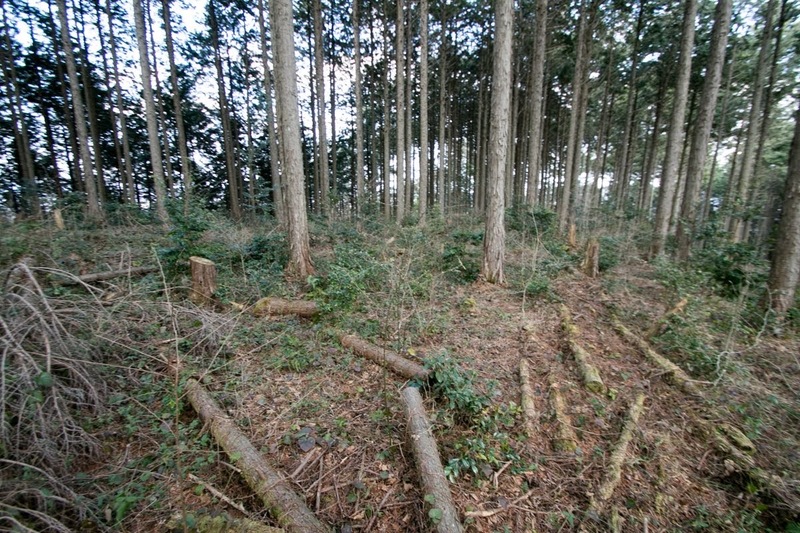 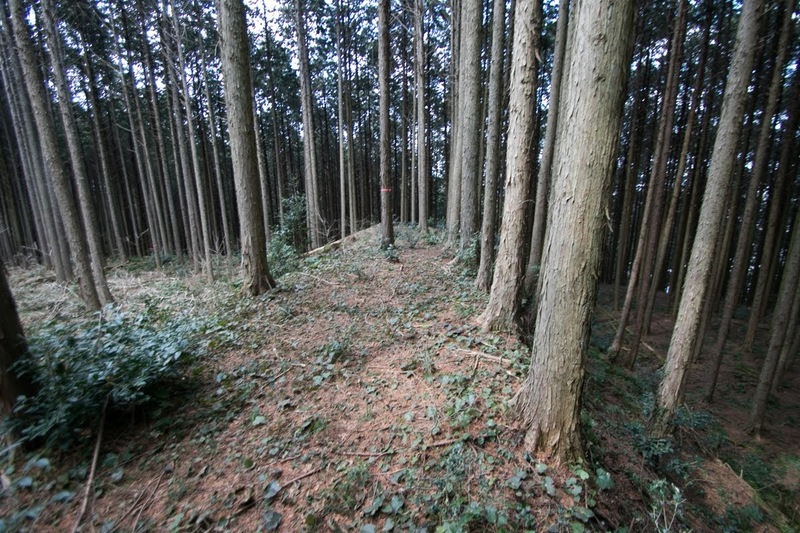 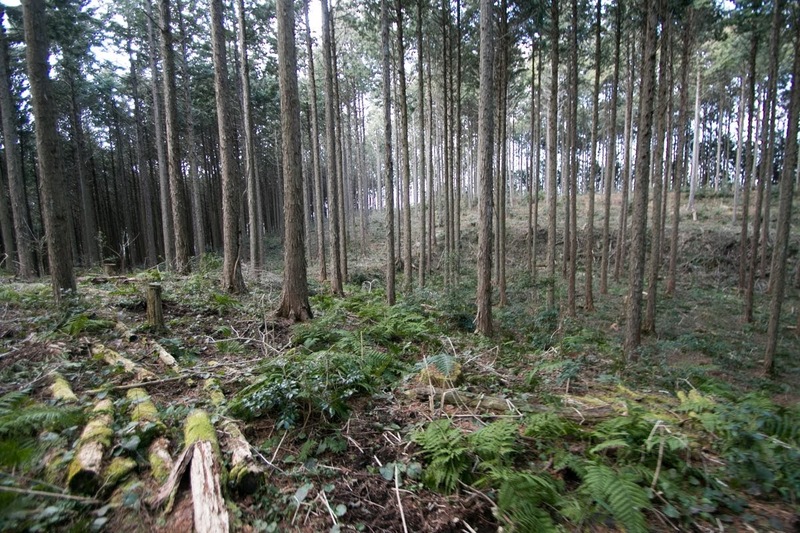 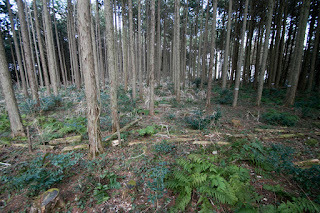 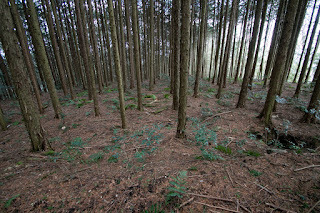 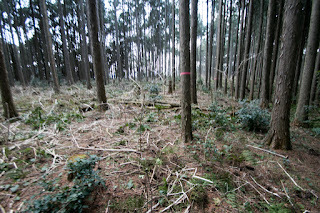 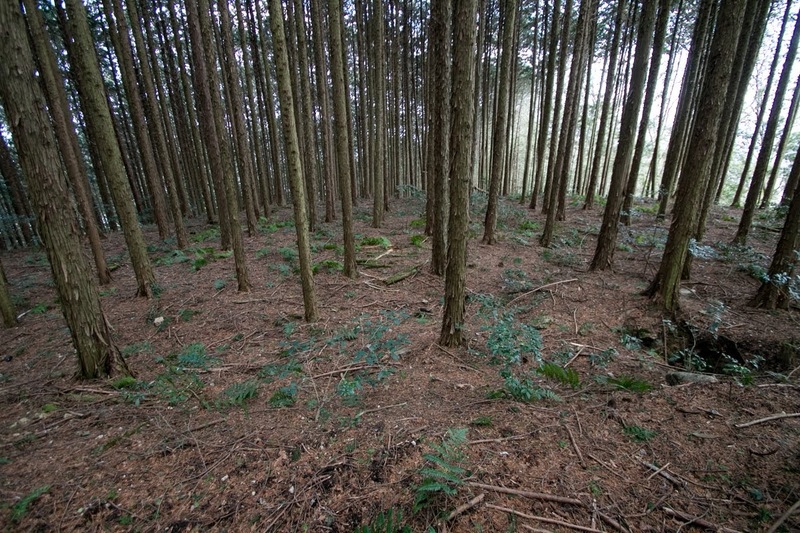 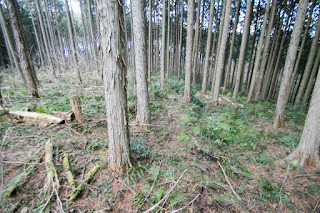 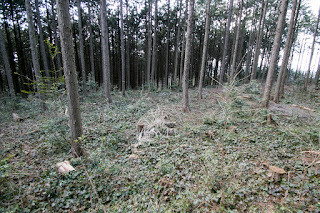 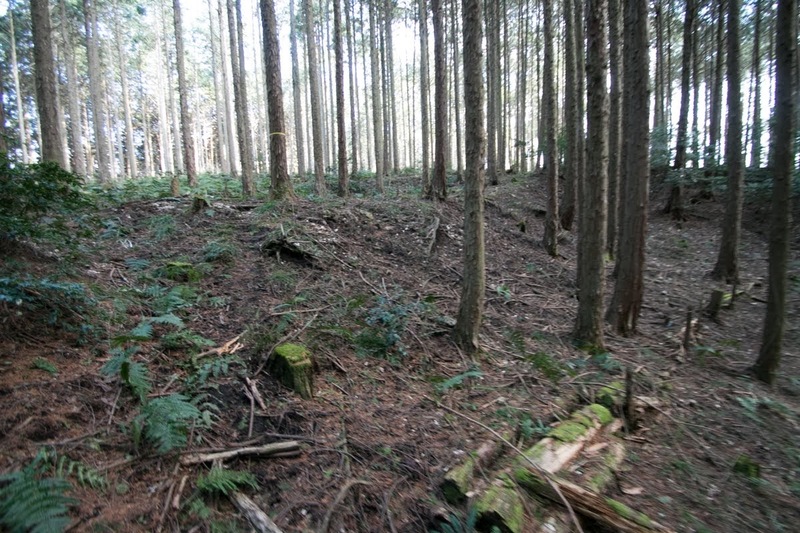 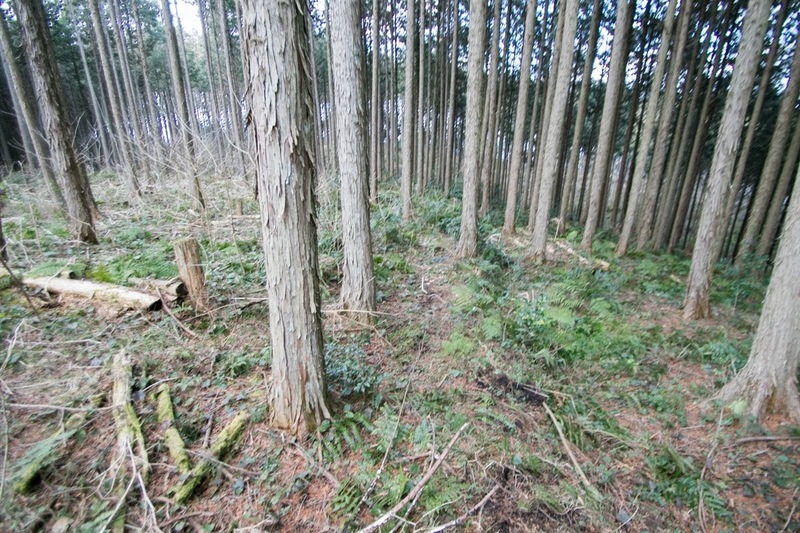 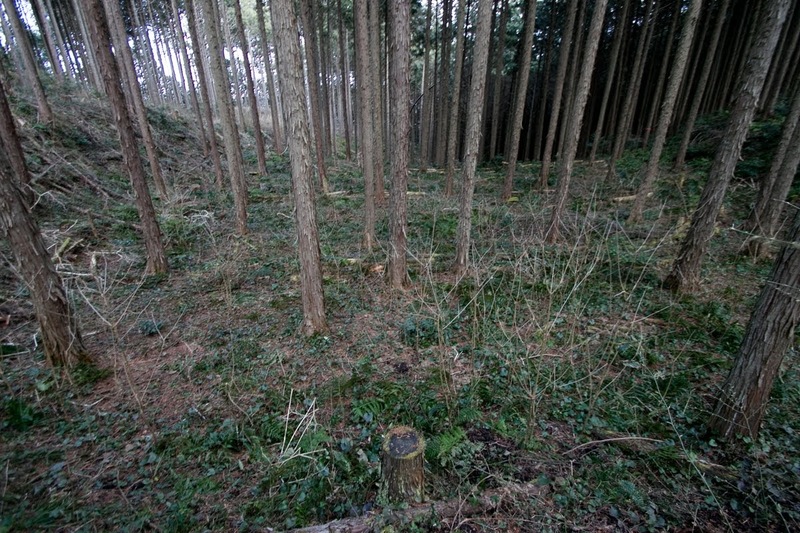 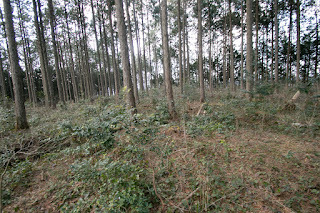 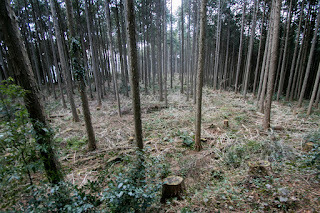 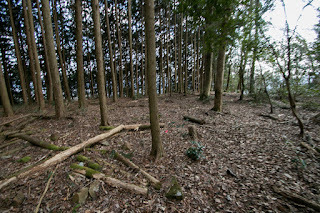 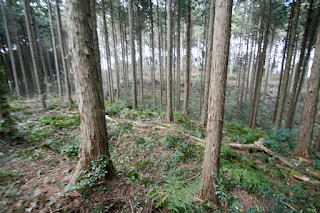 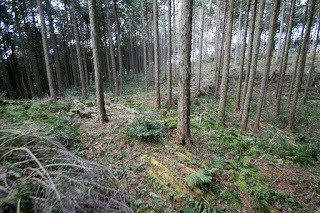 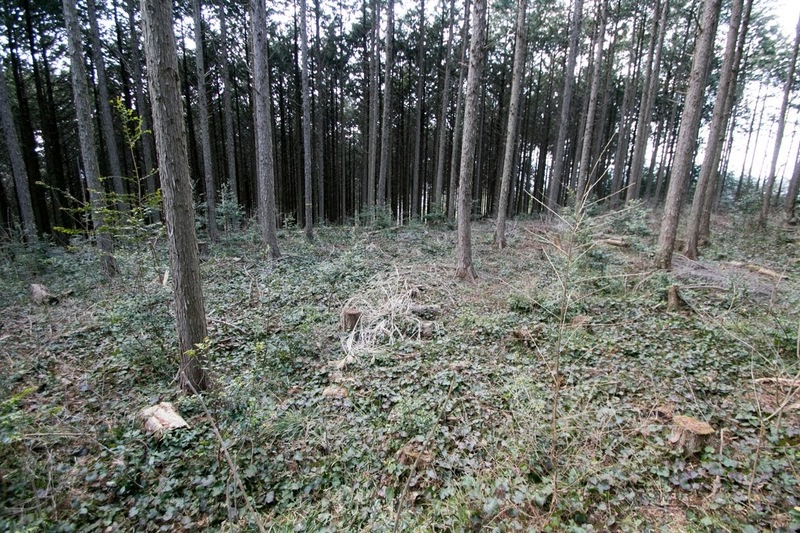 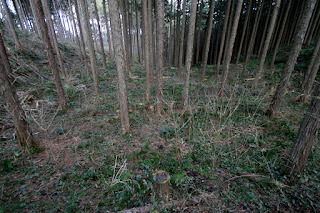 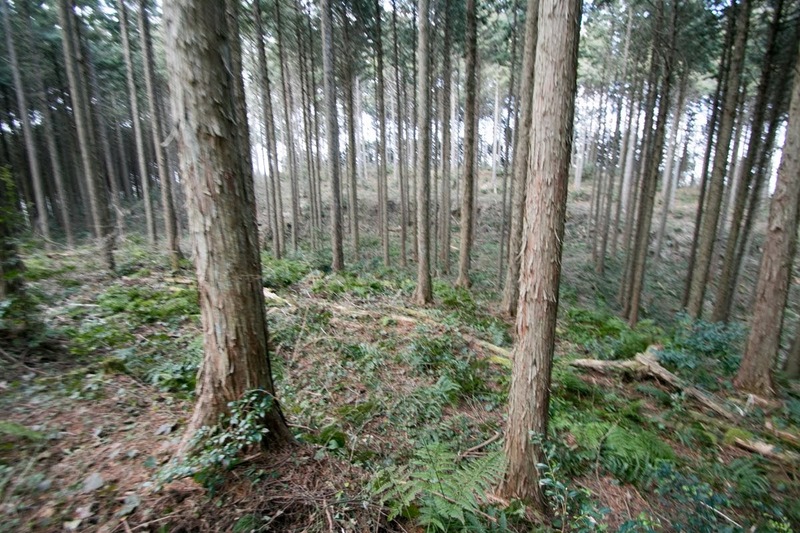 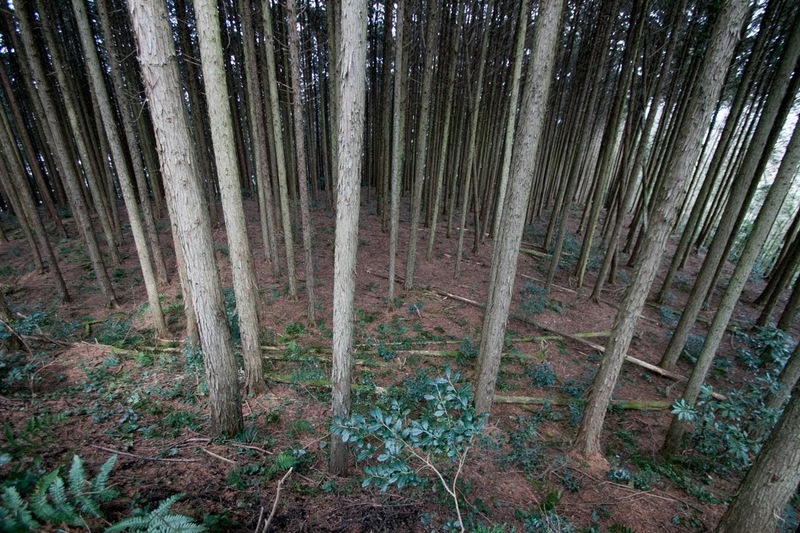 At the backside of the castle there are several large flat areas which might be used living and storage space. On the other hand, front side of the castle is securely protected by combination of small terraces. 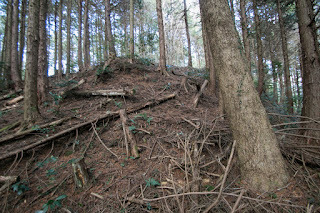 At the forefront there is a hammerhead shark like flat area might be used as a ground for watchtower, which was well seen from hillside and a symbol of the castle. 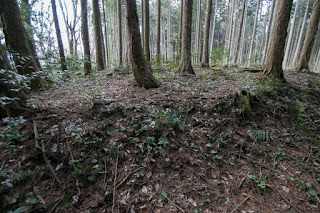 Total size of the castle is about 400 meter long and 200 meter wide, and it small size but advanced structure strengthened its character as a branch castle, compared with Higumayama castle which had many elements as main base. 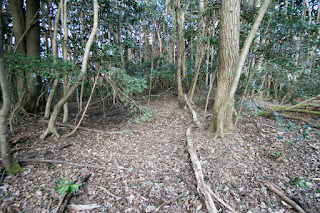 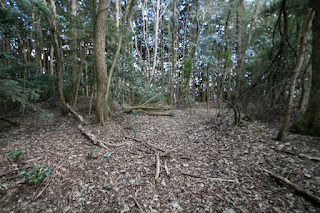 Along with important branch castle at a point of communication, it seemed Miyoshi clan could prosper at Miyoshi area. 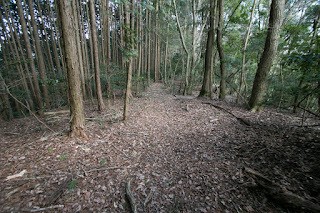 But only nine years from its construction, in 1600, Mouri clan which belonged to Mitsunari Ishida (1560-1600) at the battle of Sekigahara against Ieyasu Tokugawa (1543-1616), became loser of the battle. 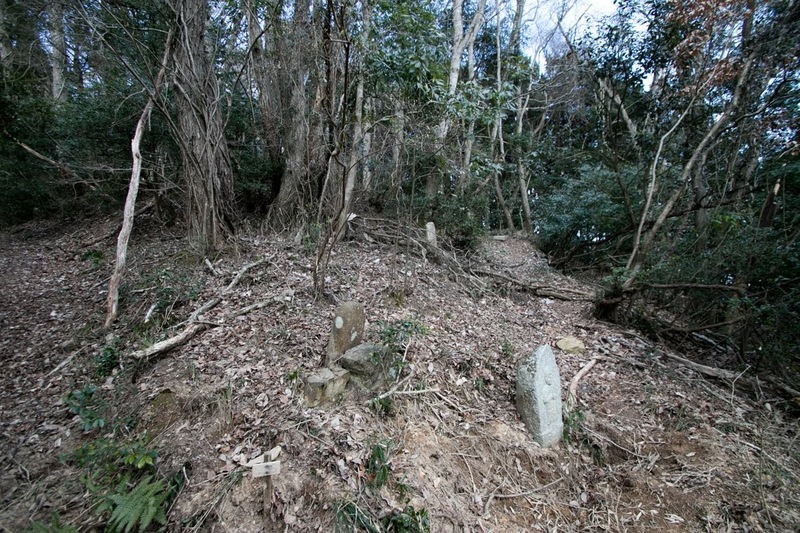 Mouri clan barely survived as feudal lord but lost most part of its territory including Bingo province. 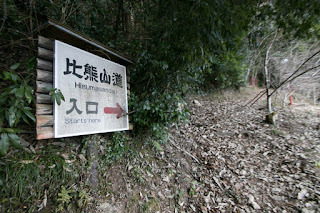 Along with Mouri clan, Miyoshi clan had to leave Higumayama castle. Masanori Fukushima (1561-1624) who became the lord of Aki province and Bingo province after Mouri clan also thought Miyoshi area as an important point. 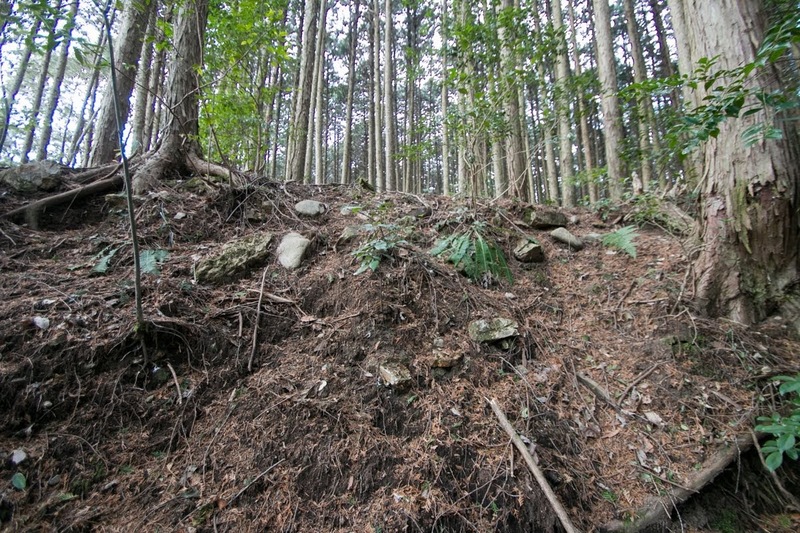 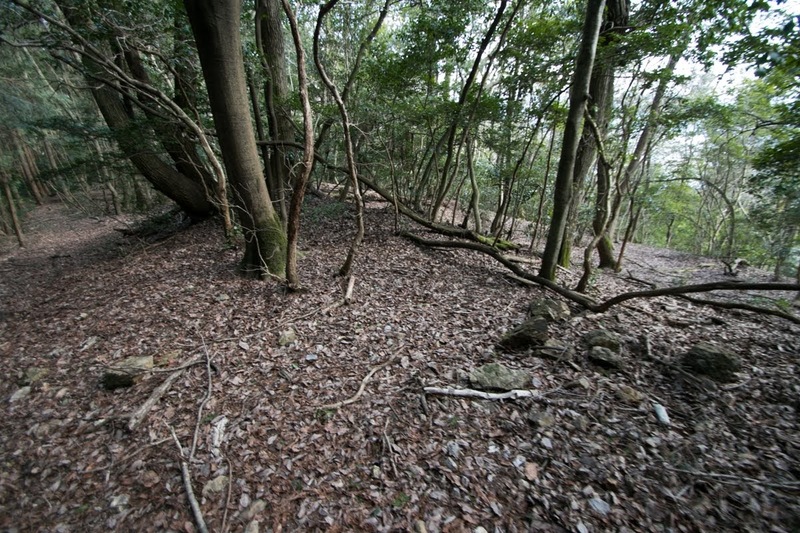 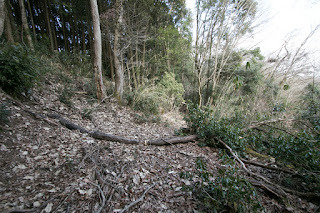 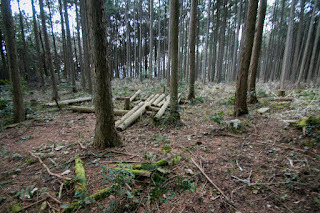 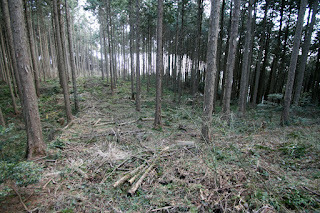 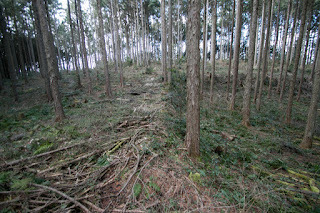 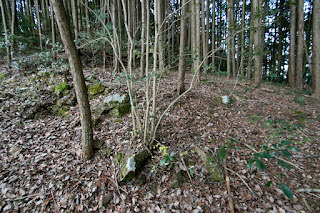 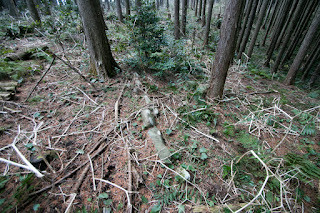 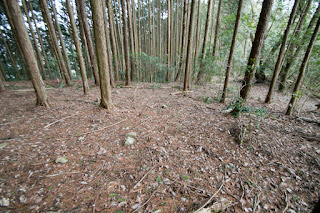 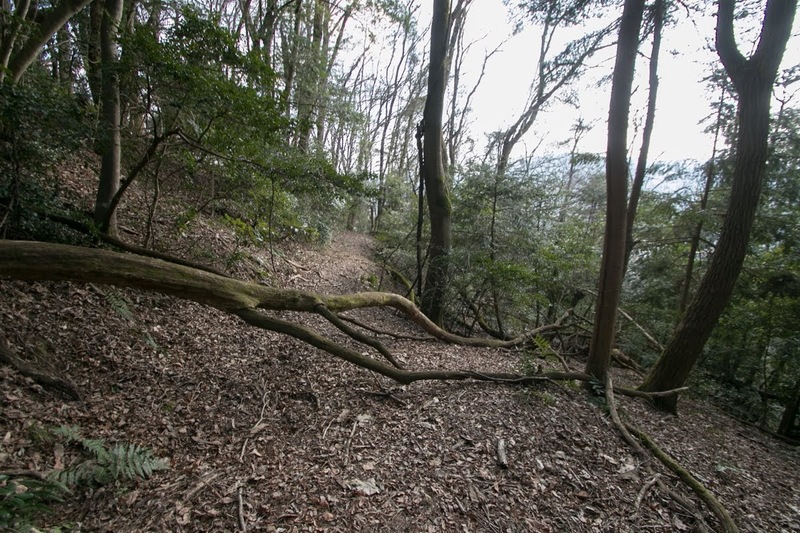 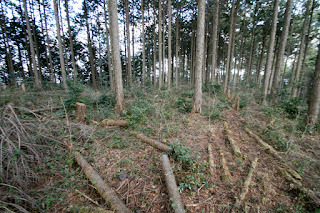 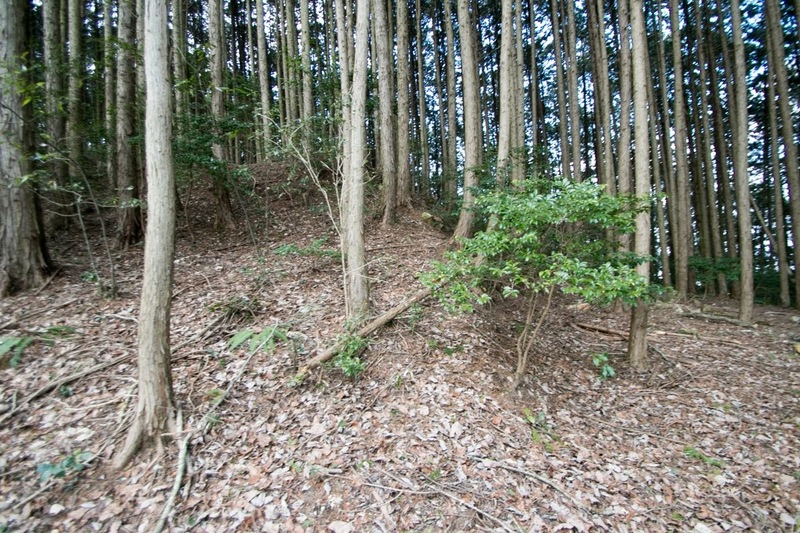 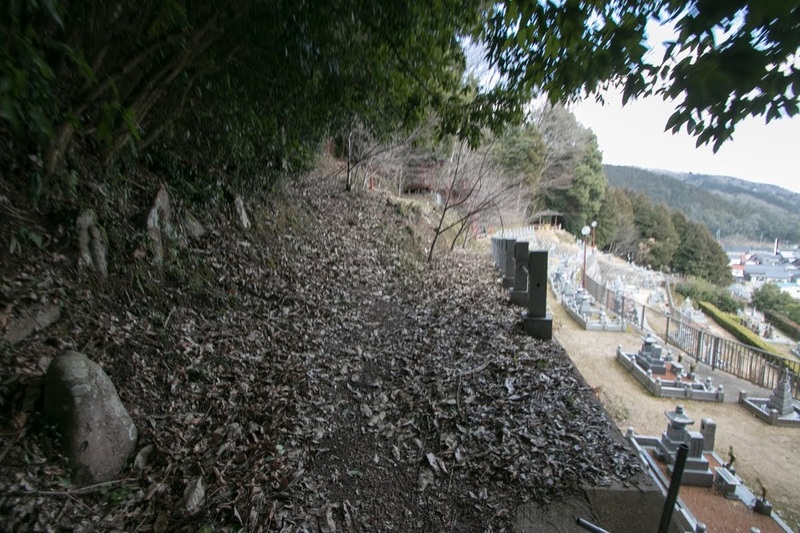 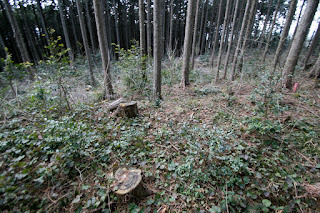 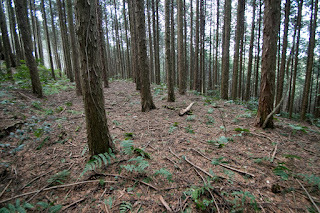 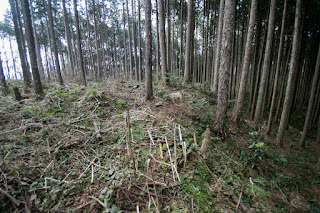 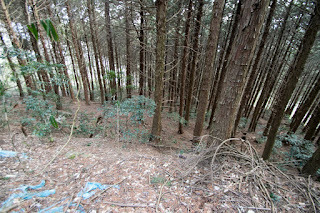 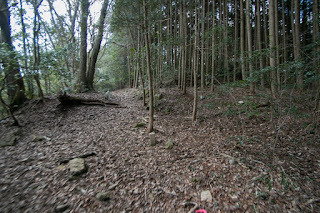 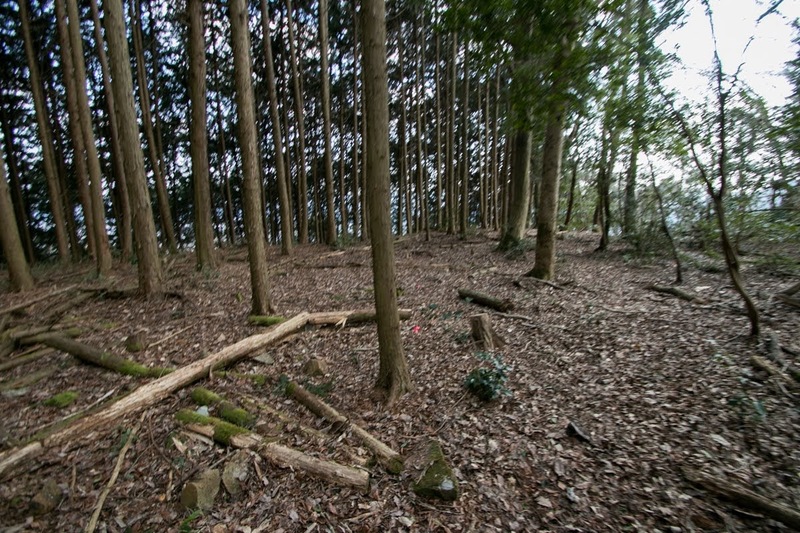 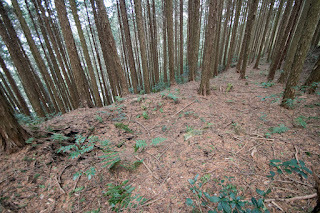 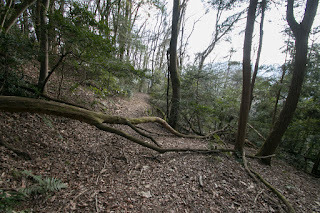 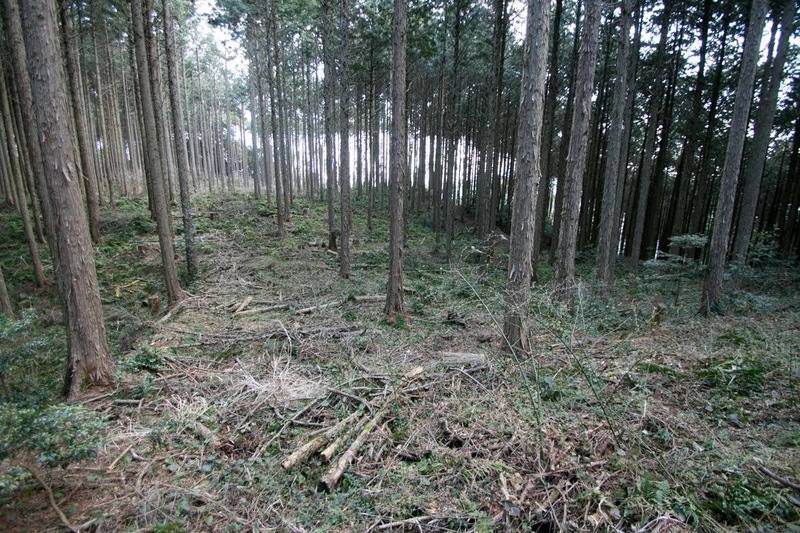 But considering inconvenience of mountain castle, Fukushima clan abolished Higumayama castle and newly built Ozekiyama castle just at the below of the mountain. 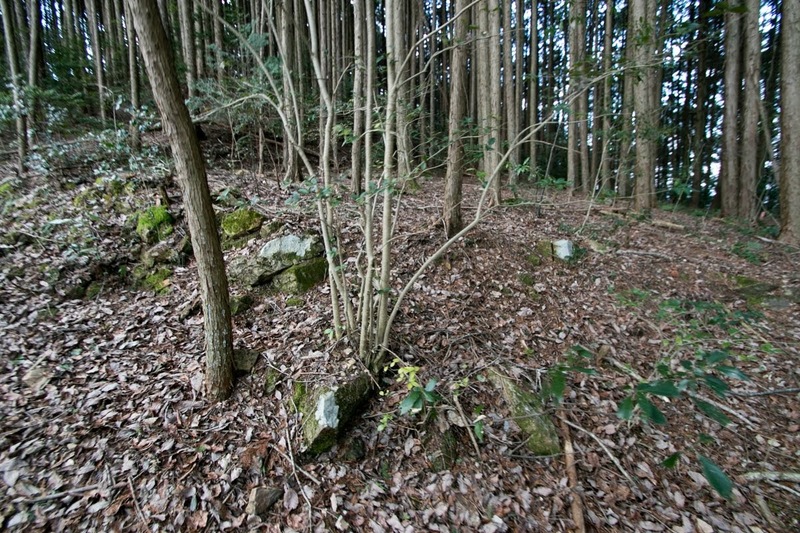 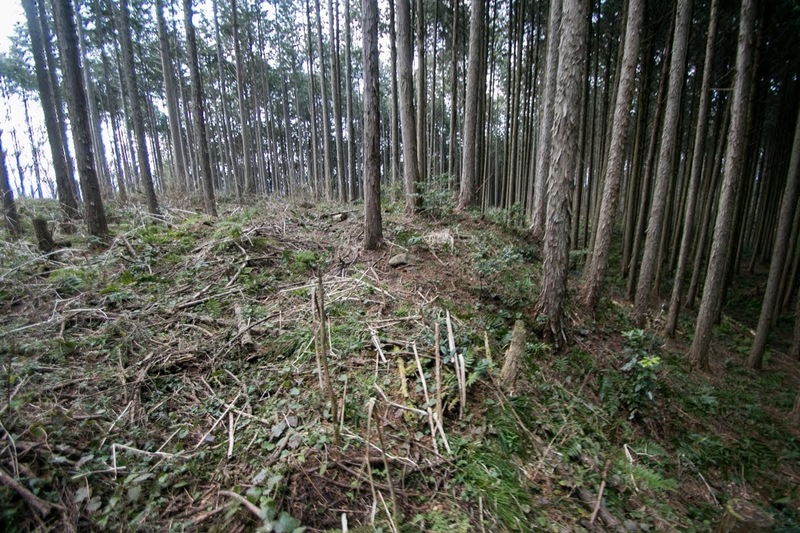 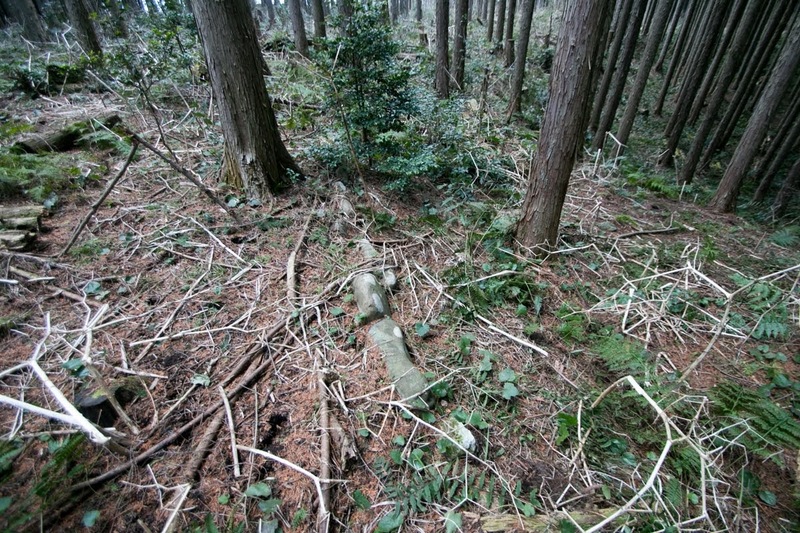 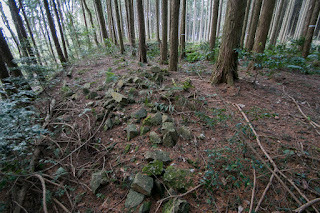 Now no building was left and partially destructed by cultivation, structure of the castle still remains on the mountain. 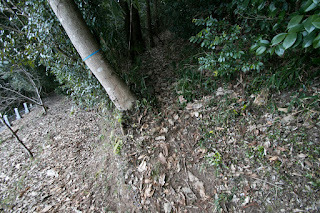 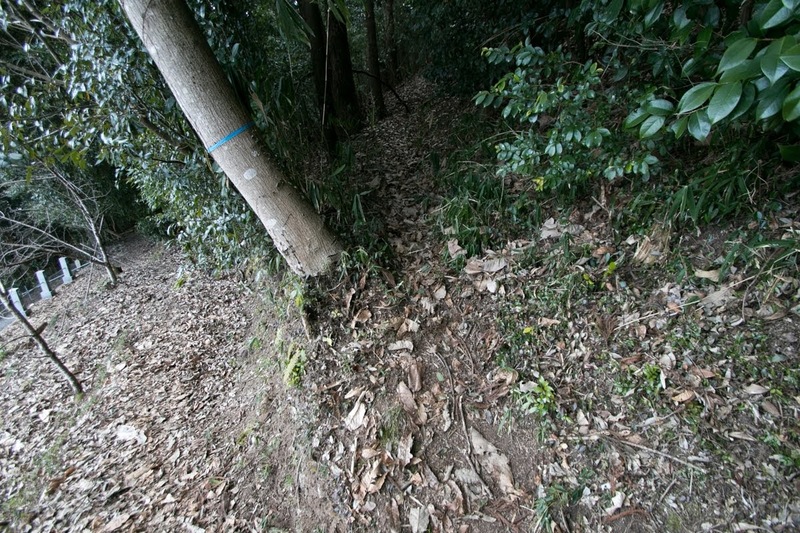 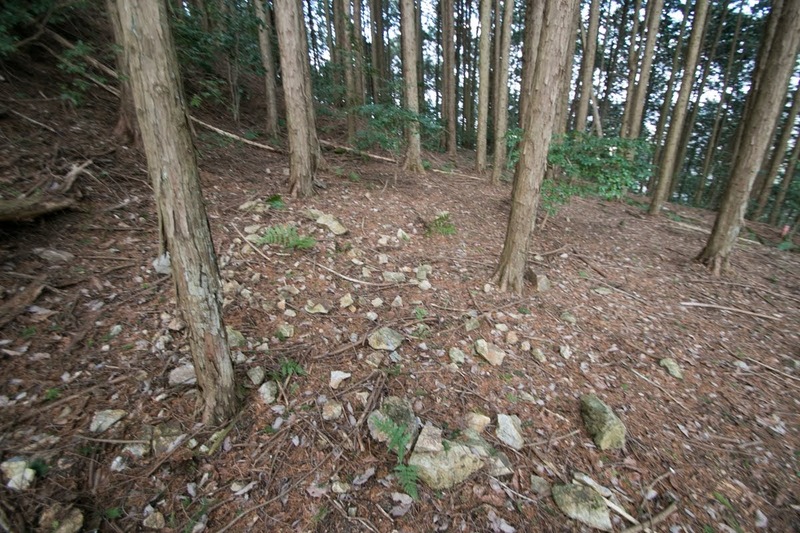 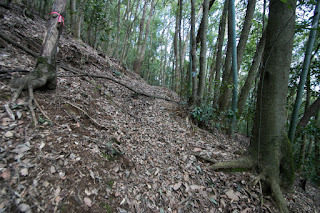 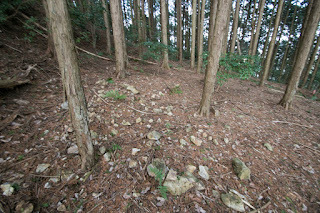 Straightly shaped line of clay walls with stones shows castle development in Mouri clan affected by technology of central area. 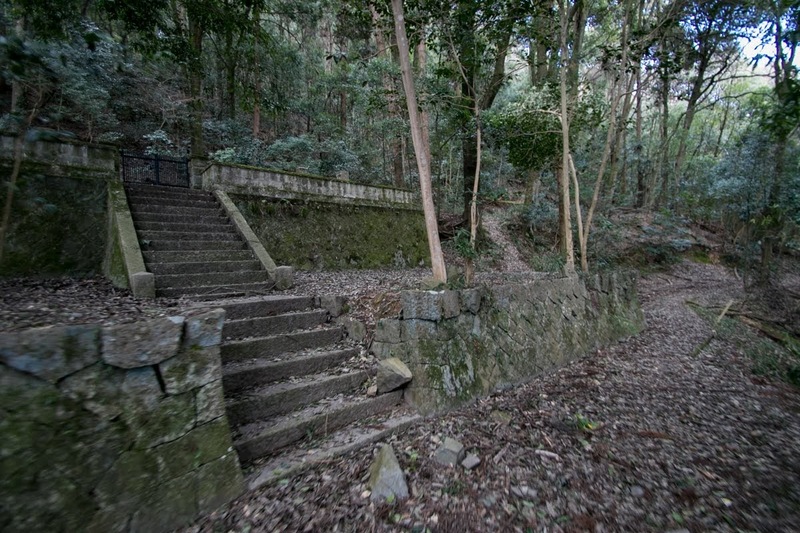 Transitional style of the castle shows the shape of Miyoshi clan which once approached to modern lord but finally failed to survive. 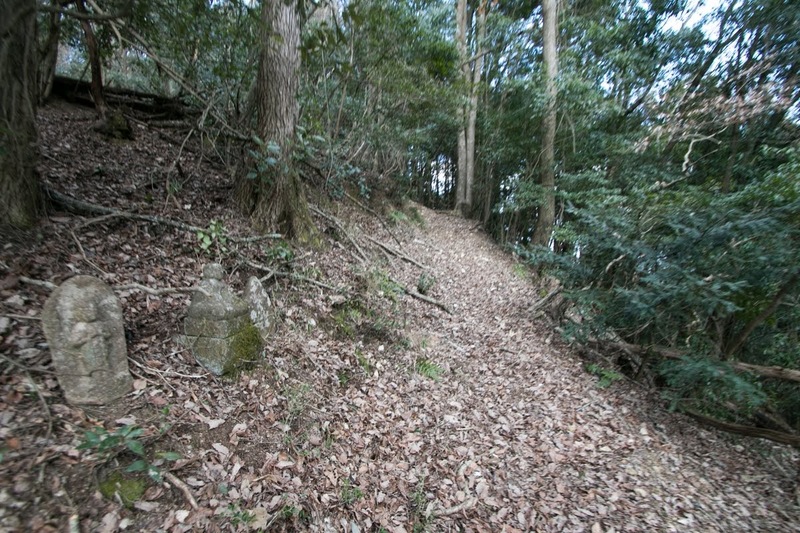 30 minutes walk from JR West Geibi-sen line Miyoshi station to the entrance of climbing road at the backside of Hogenji Temple. 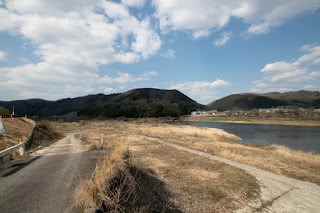 20 minutes drive from Chugoku Jidoshado Expressway Miyoshi interchange to parking of Ozekiyama Koen Park.